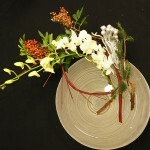 Point of lesson ; Look for the materials you’ve never used, seen, unusual or overlooked before and try them. 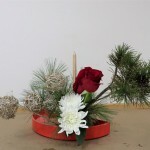 Same goes for the containers, try to make your own containers as well. 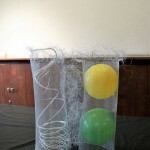 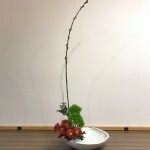 Point of lesson ; Importance of Dense and Sparse parts in the arrangement. 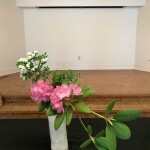 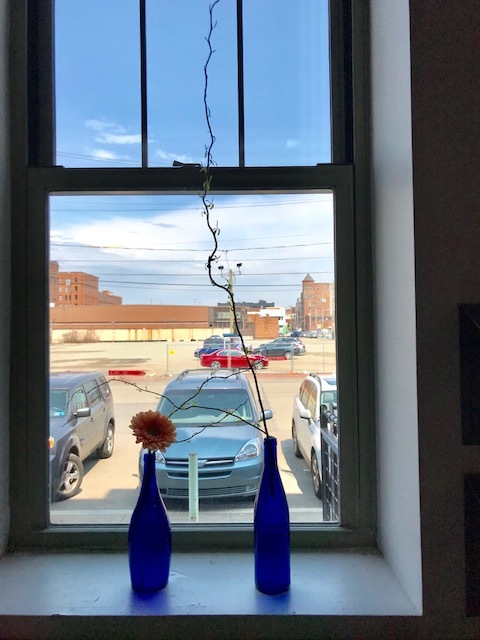 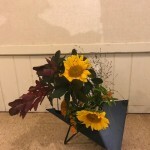 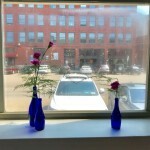 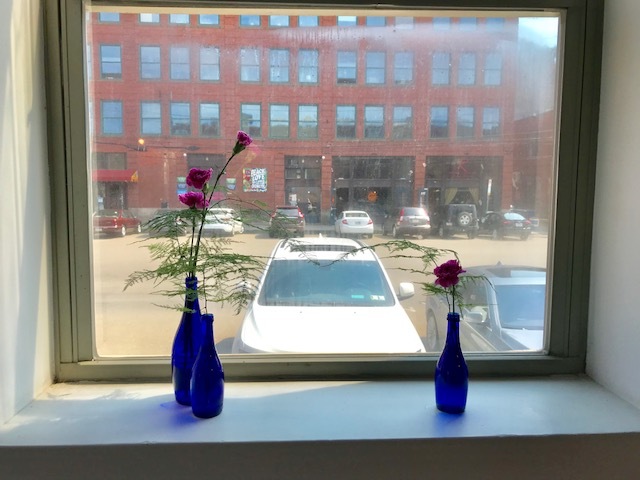 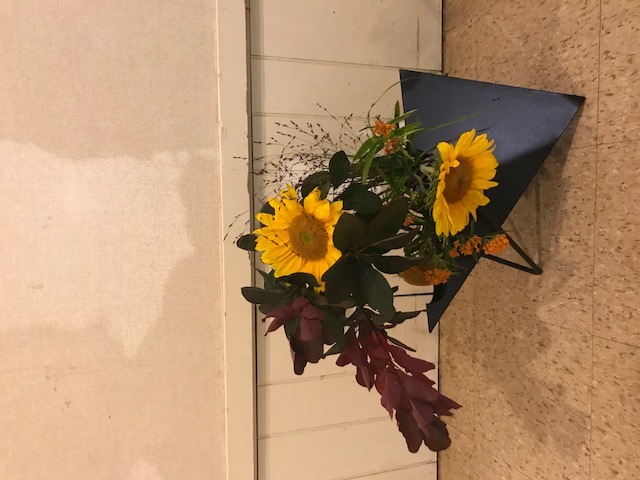 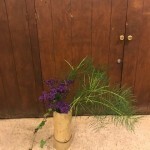 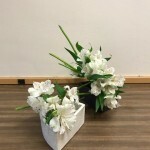 Is the main feature the flowers or the container. 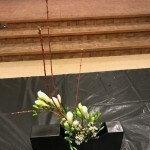 Point of lesson ; Pay attention to where you are going to place your arrangement. 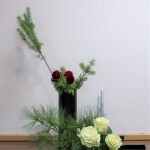 Point of lesson ; Pay attention to the choice of container as well as other components. 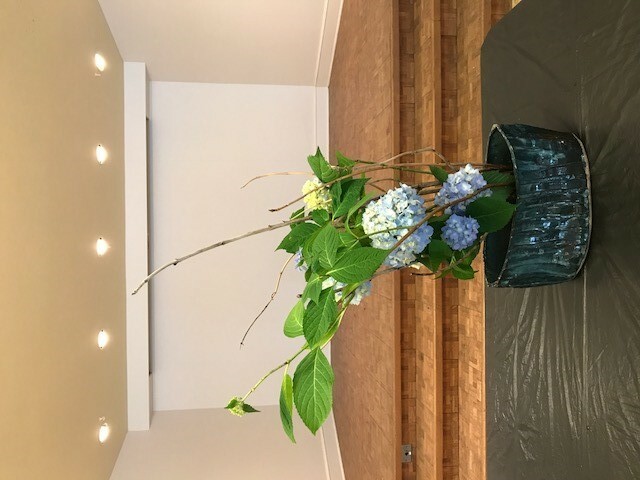 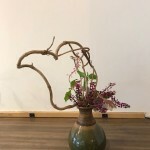 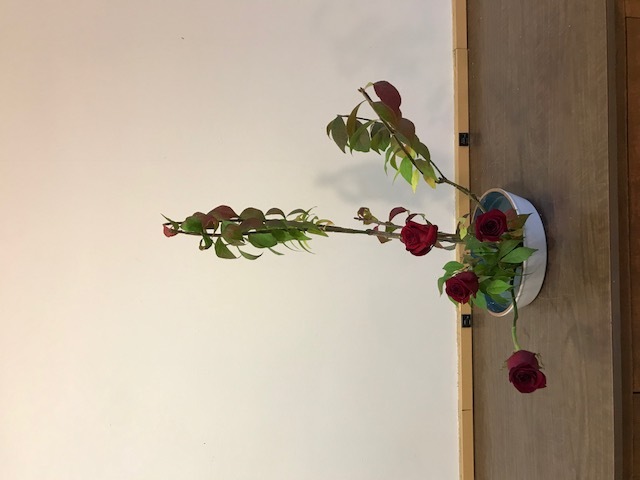 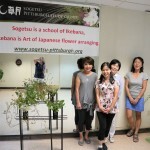 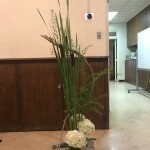 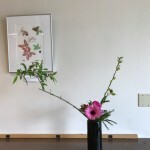 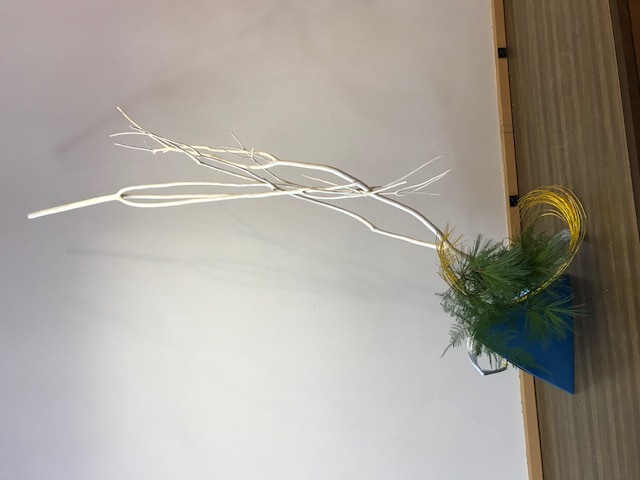 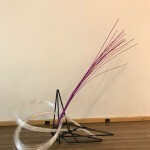 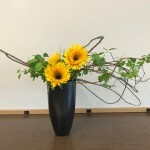 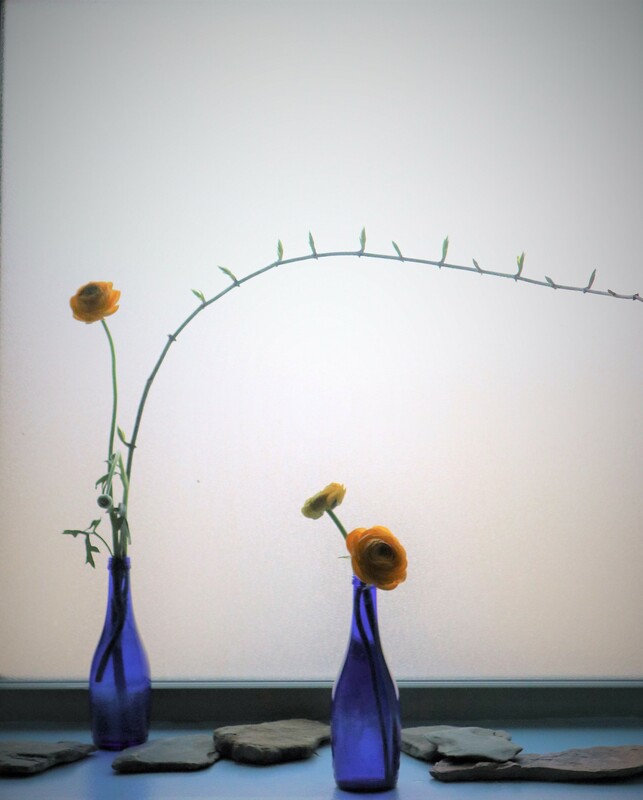 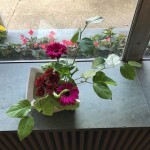 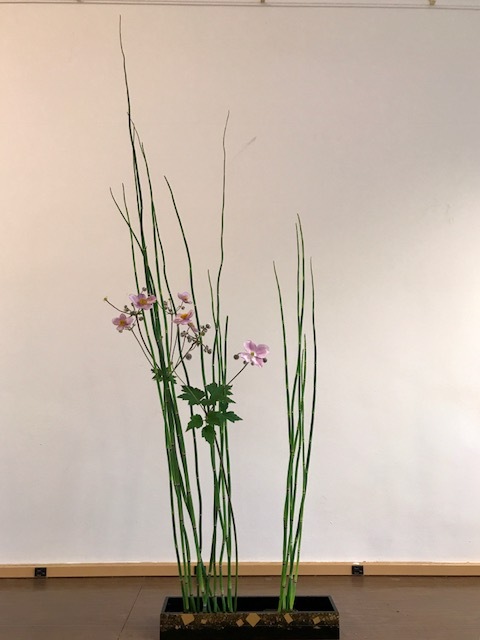 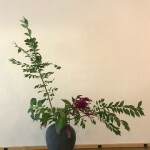 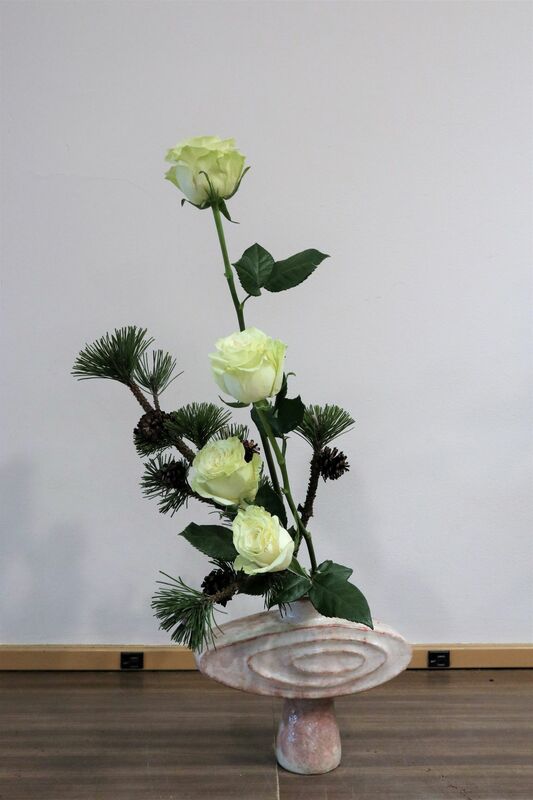 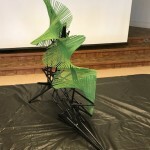 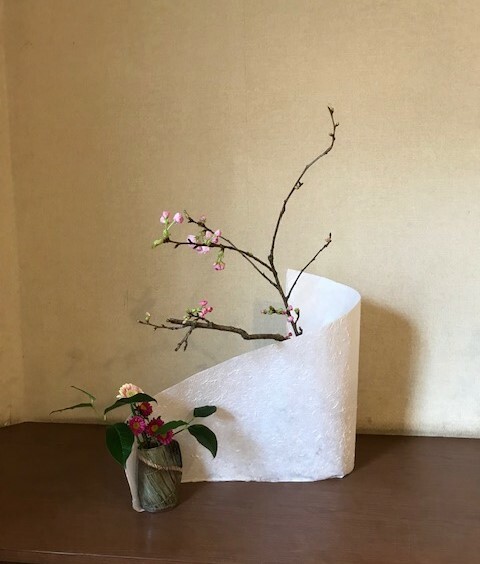 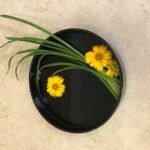 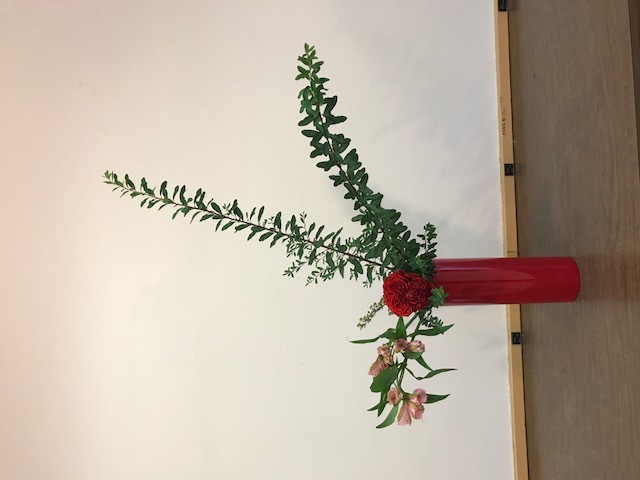 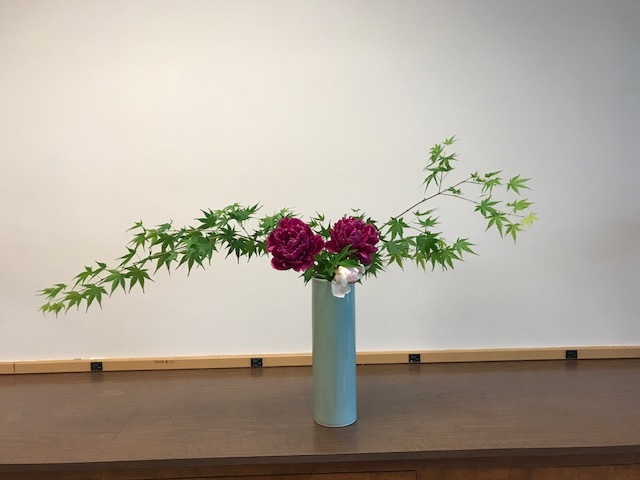 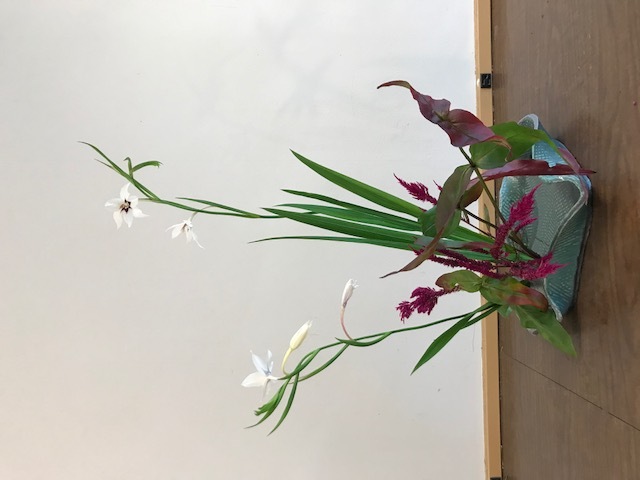 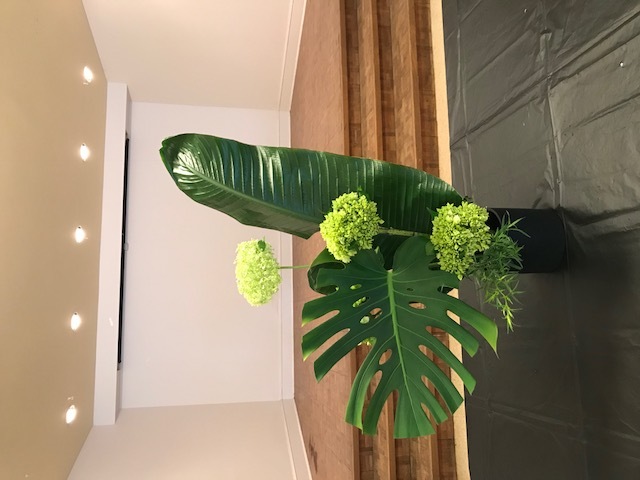 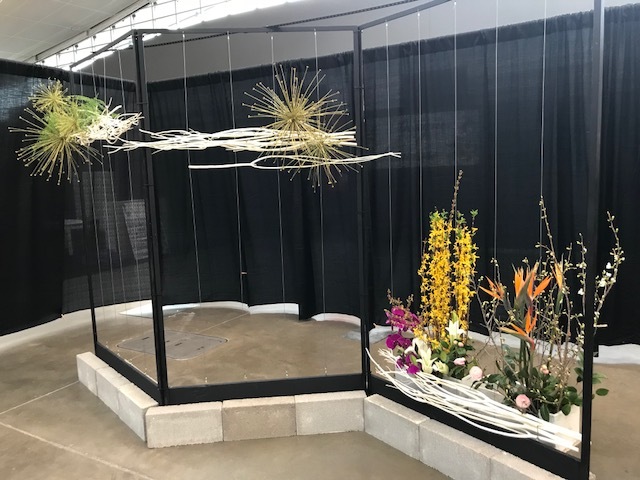 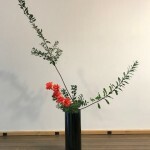 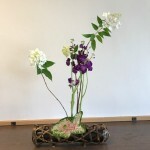 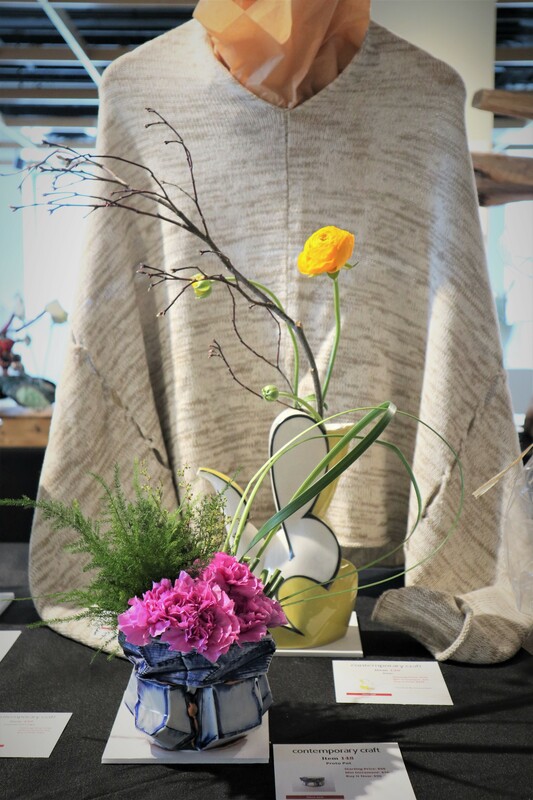 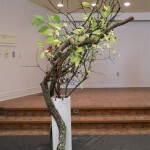 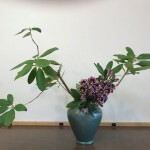 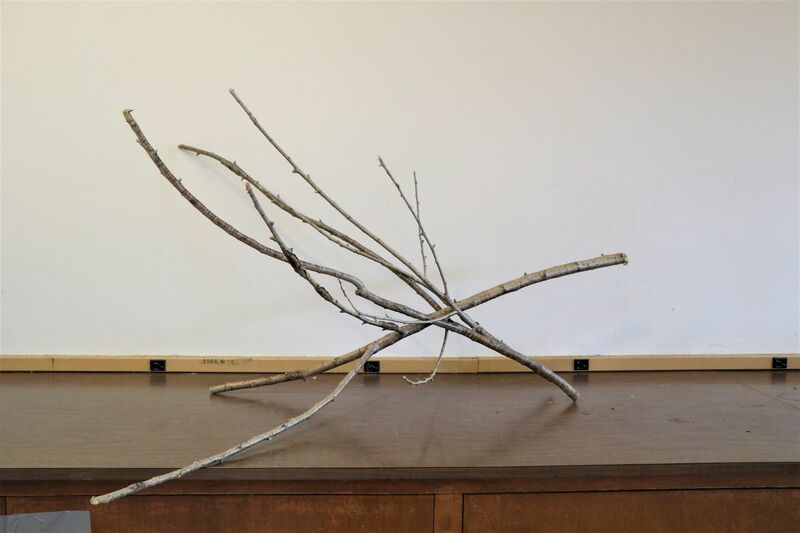 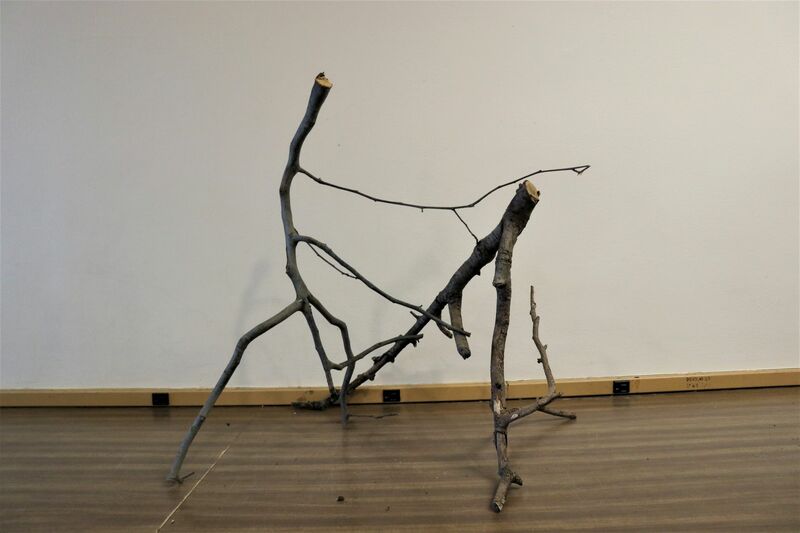 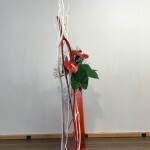 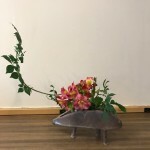 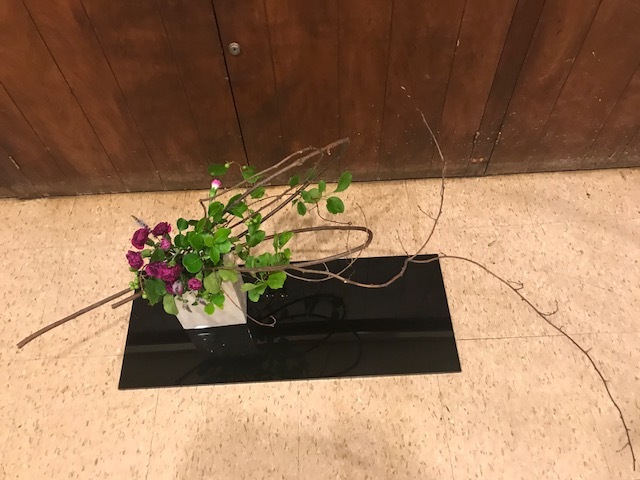 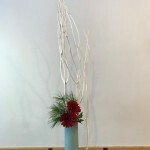 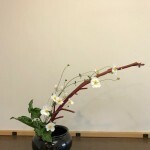 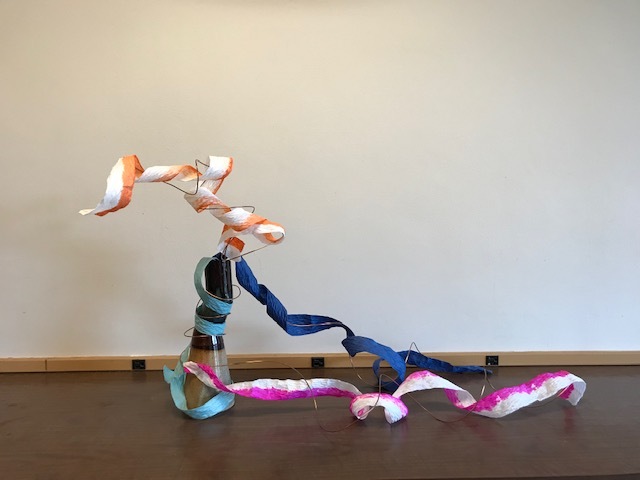 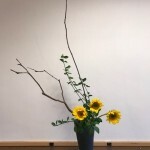 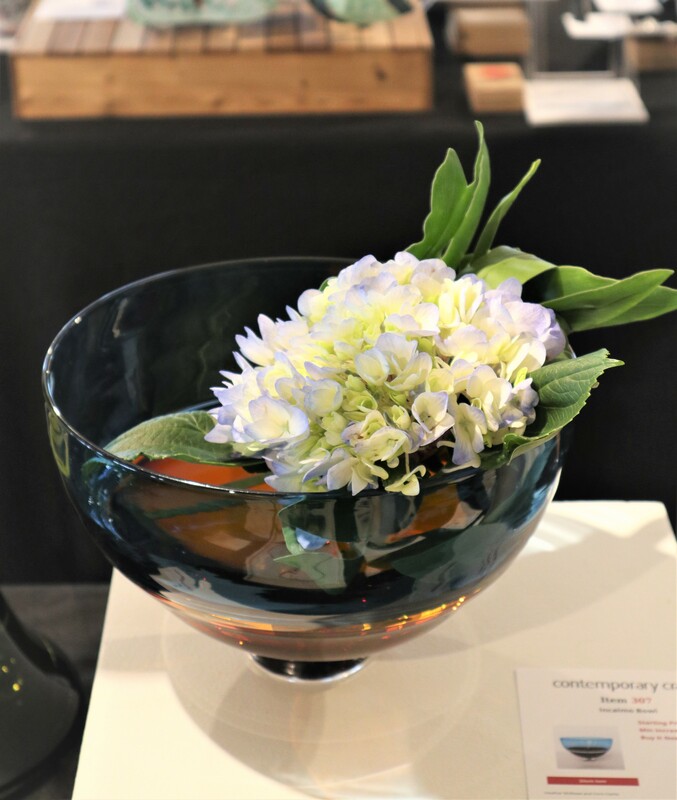 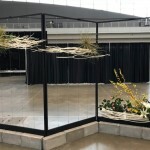 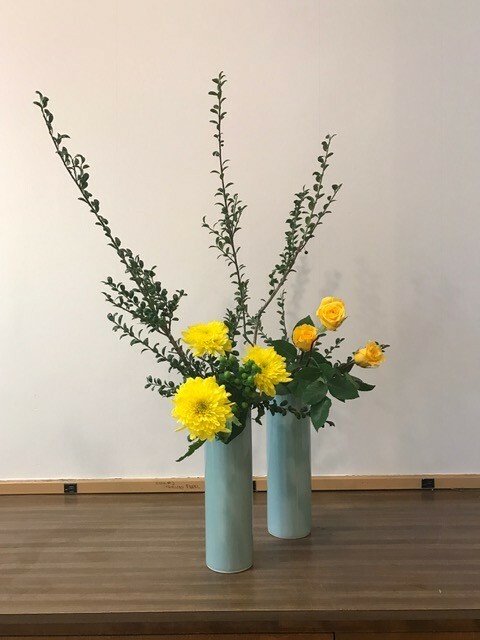 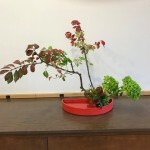 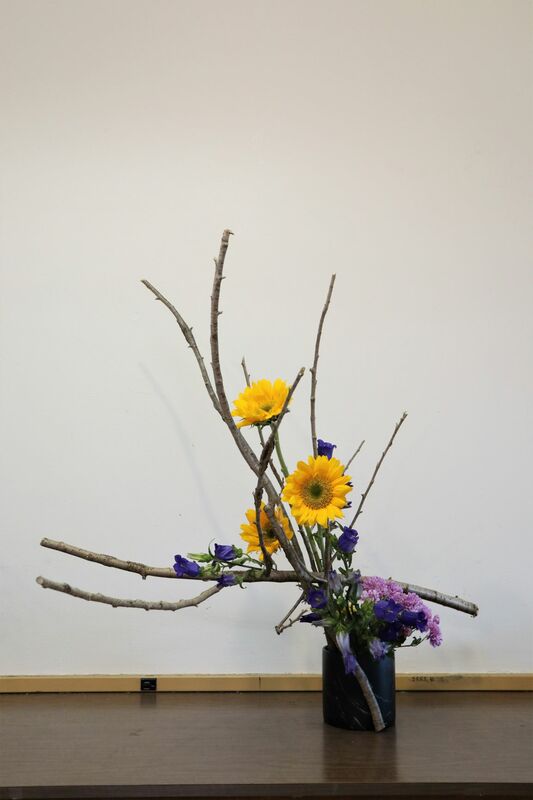 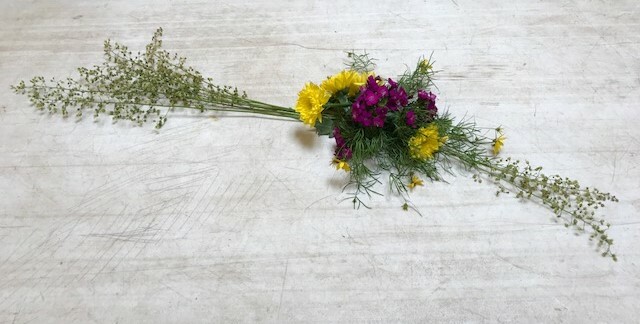 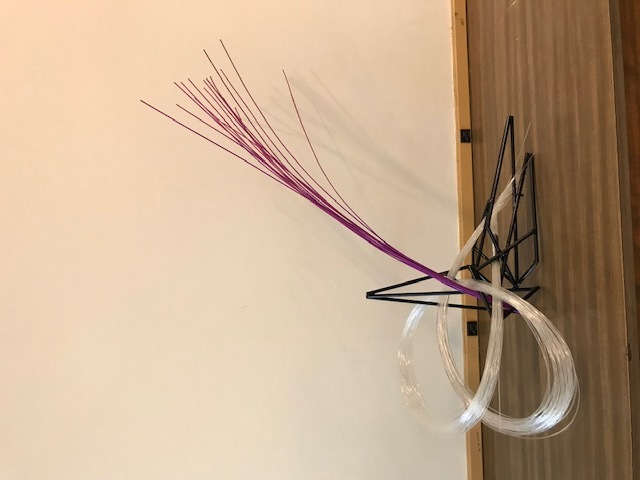 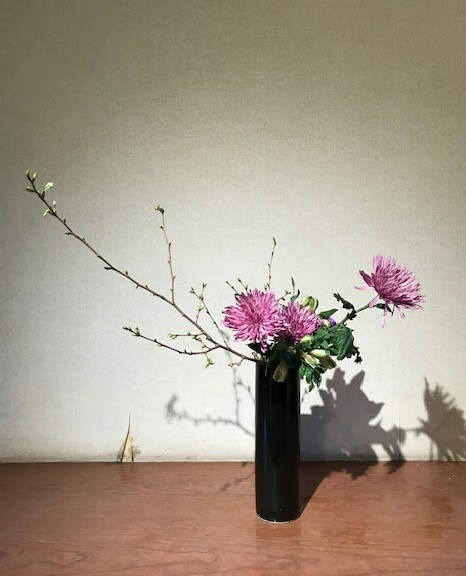 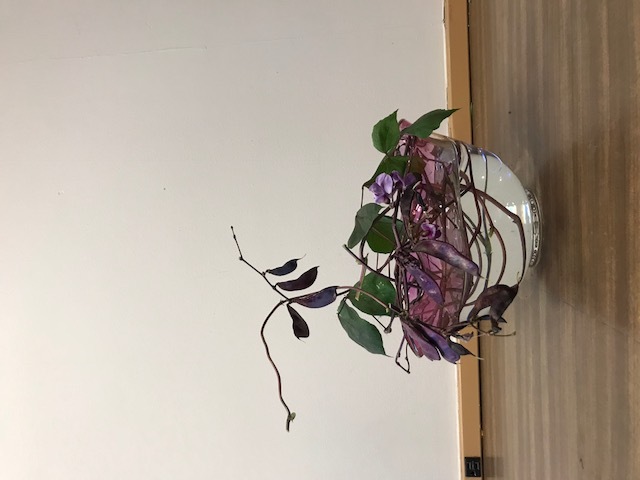 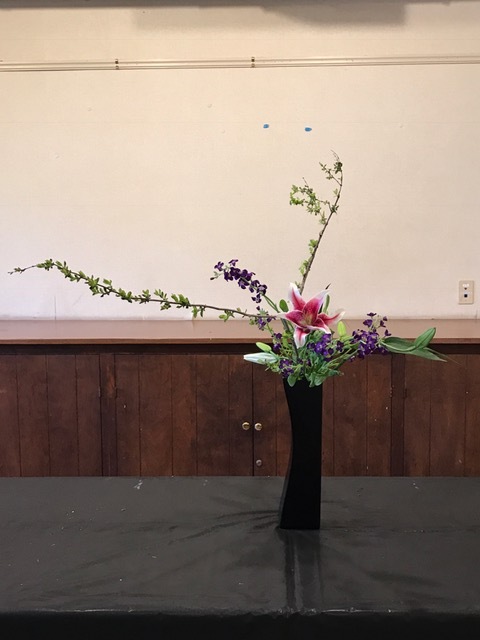 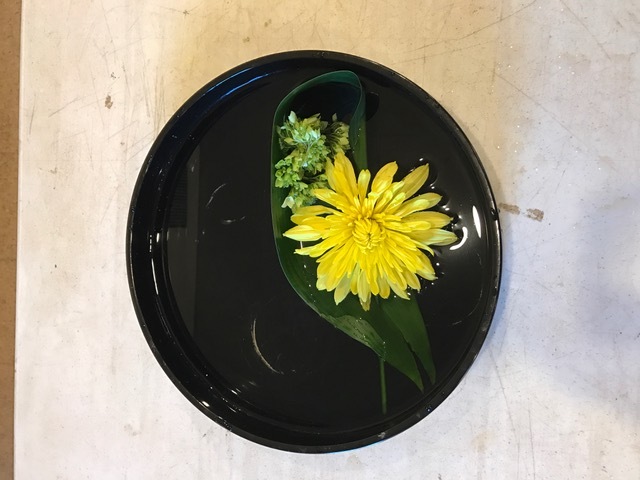 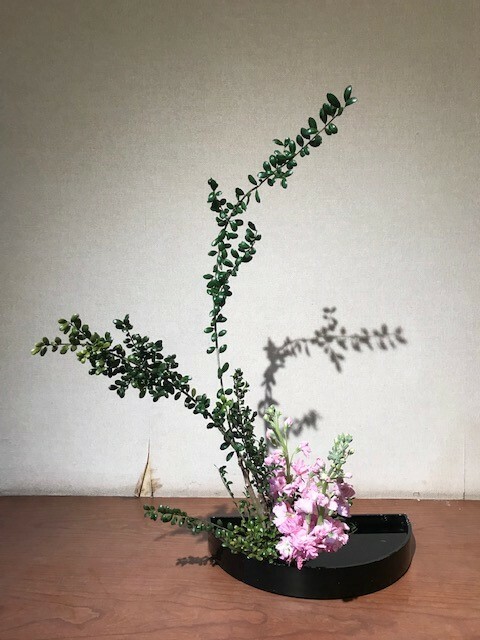 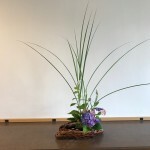 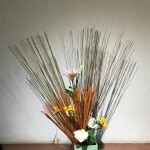 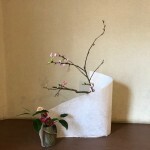 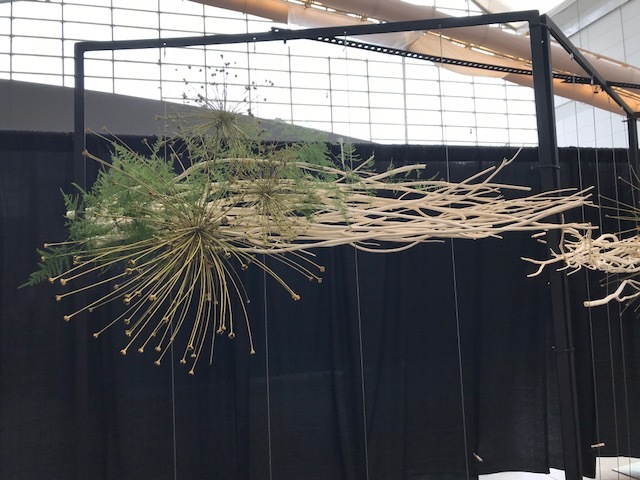 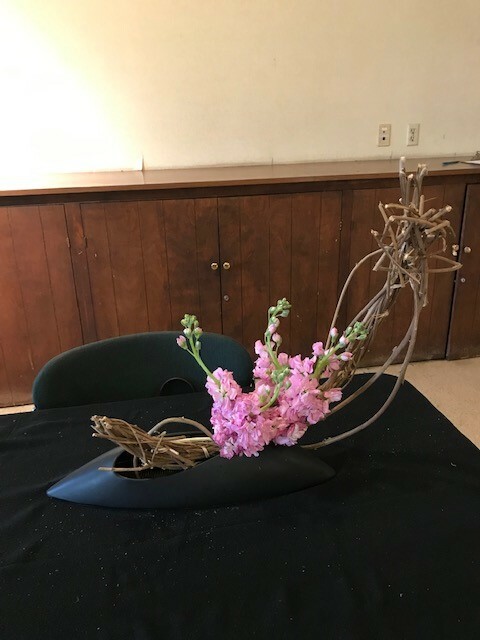 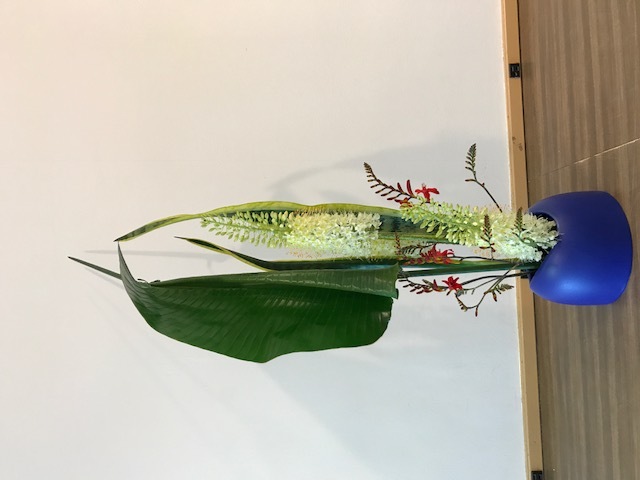 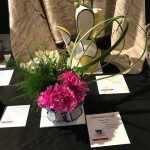 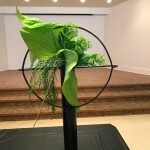 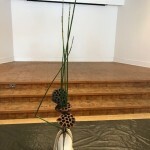 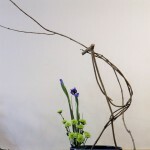 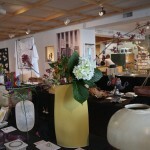 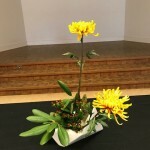 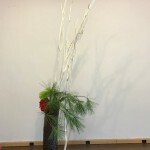 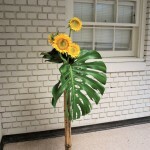 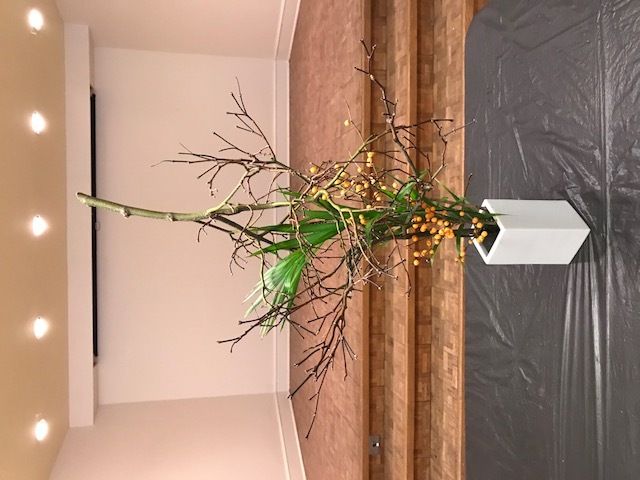 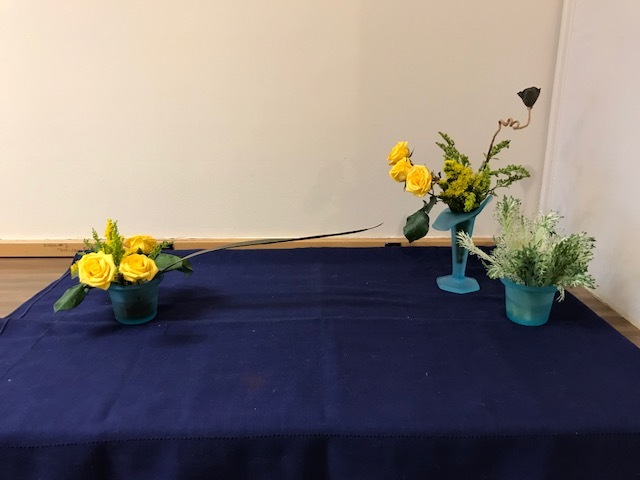 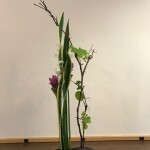 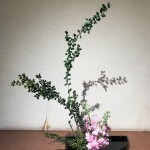 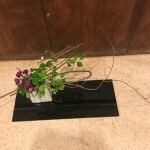 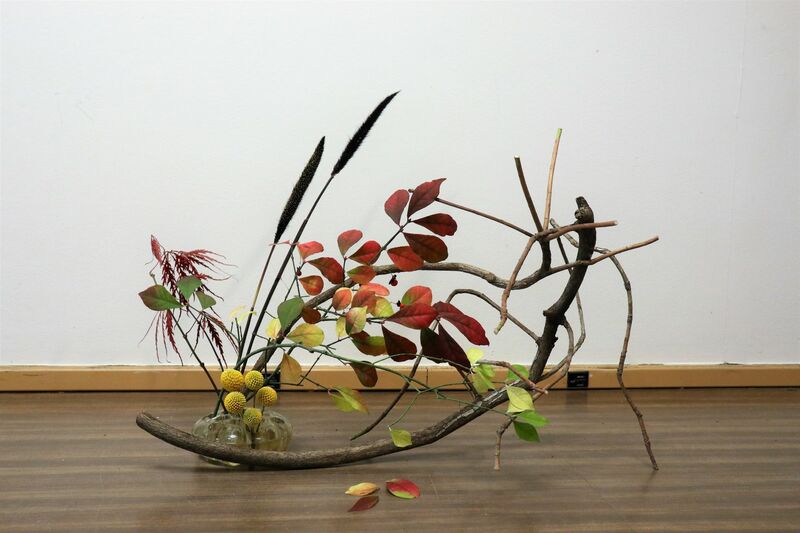 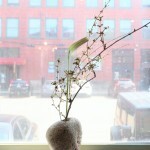 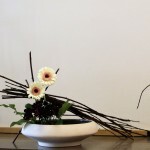 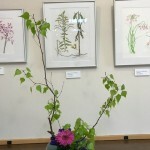 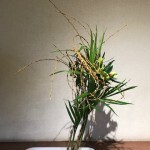 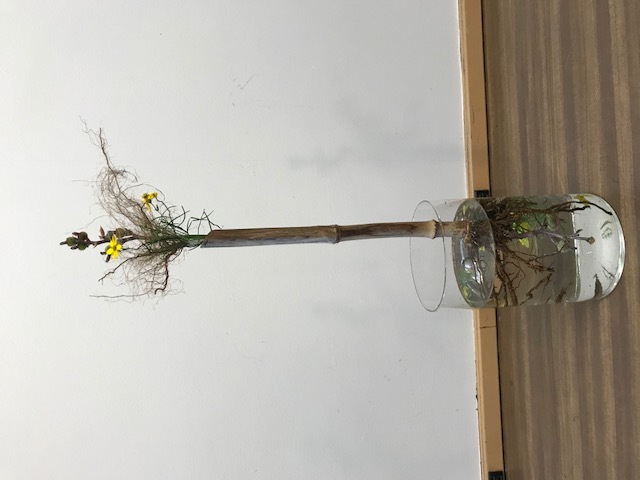 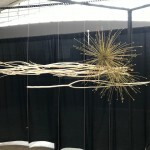 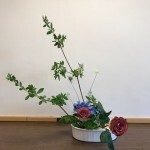 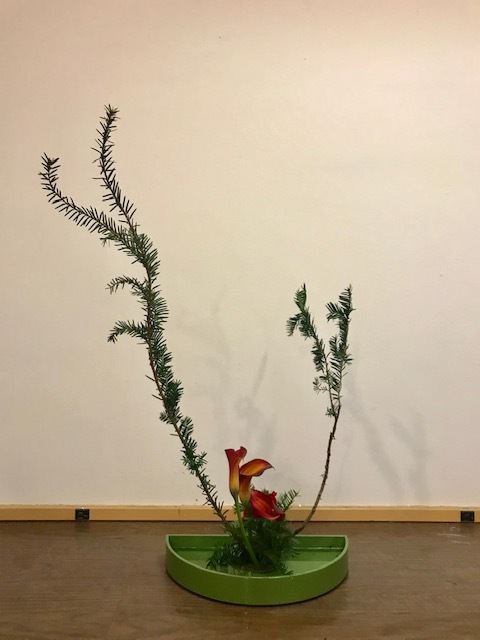 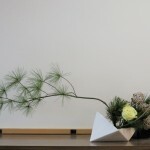 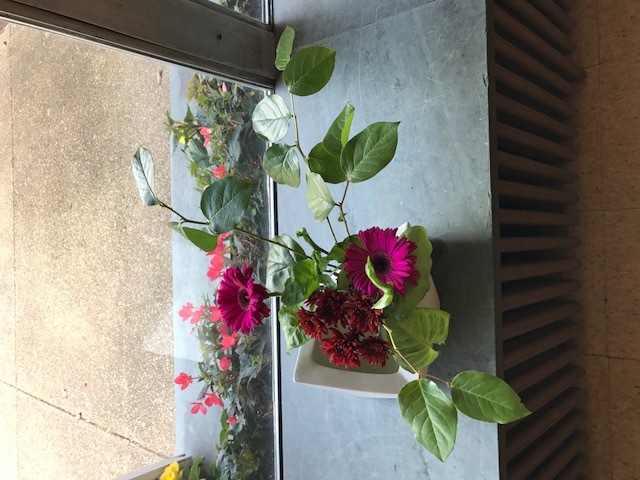 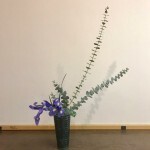 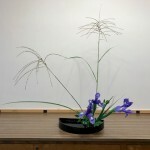 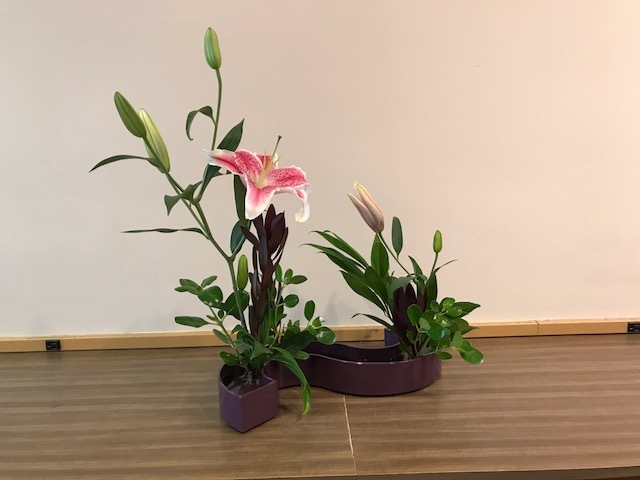 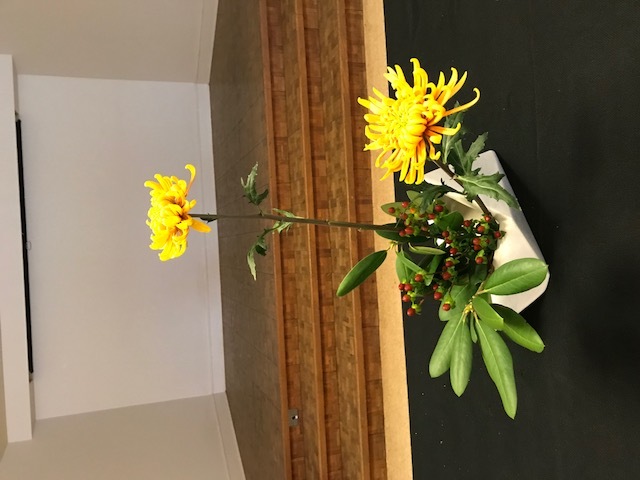 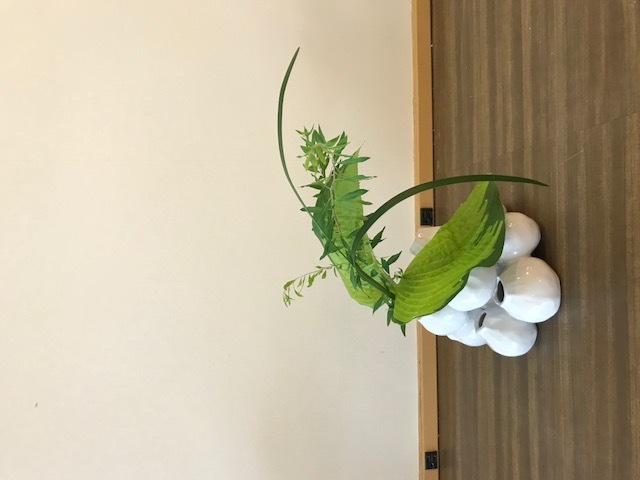 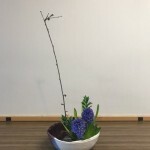 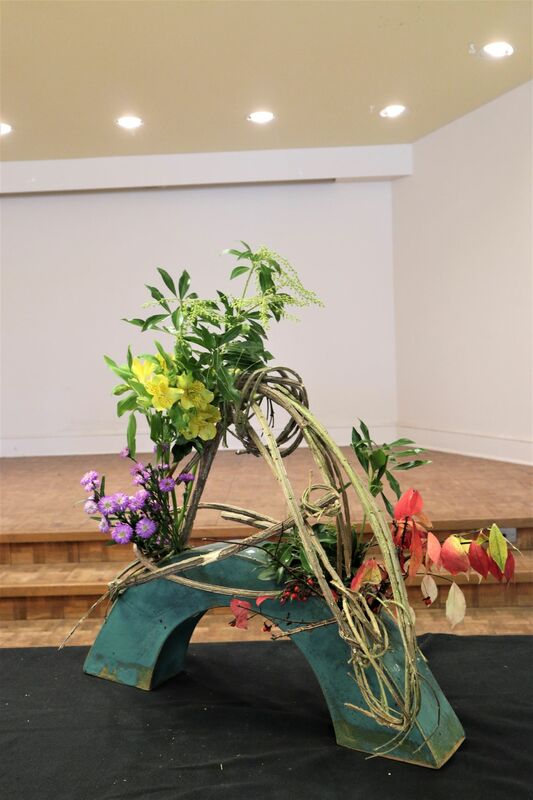 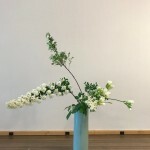 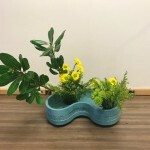 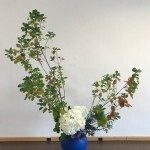 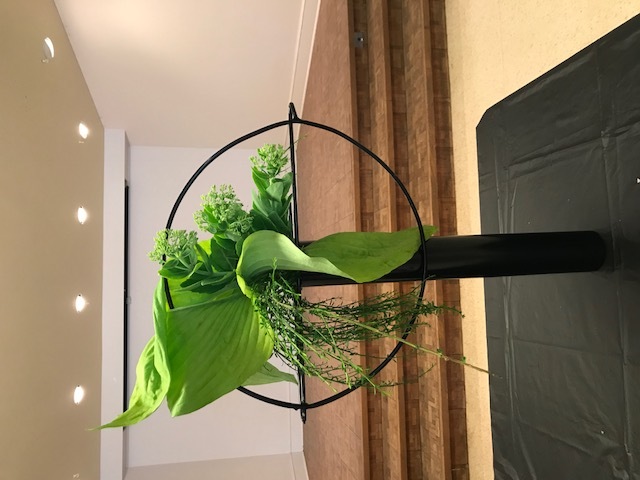 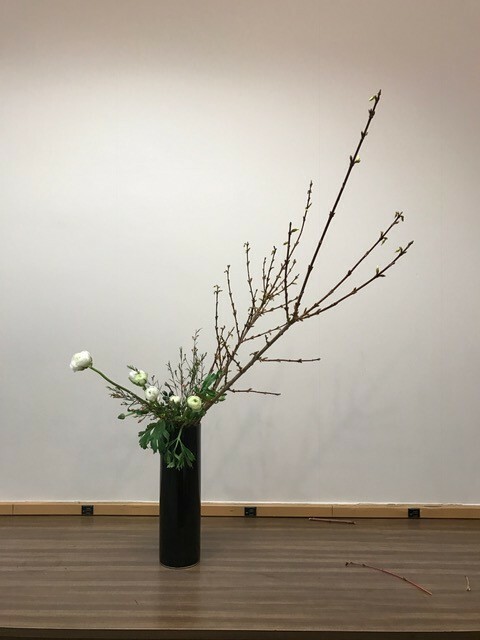 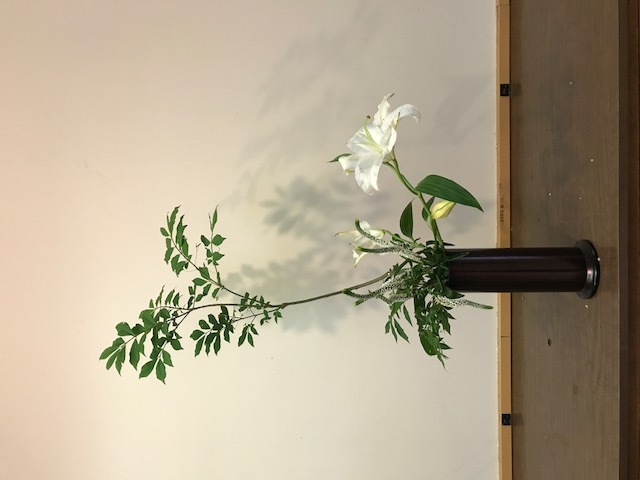 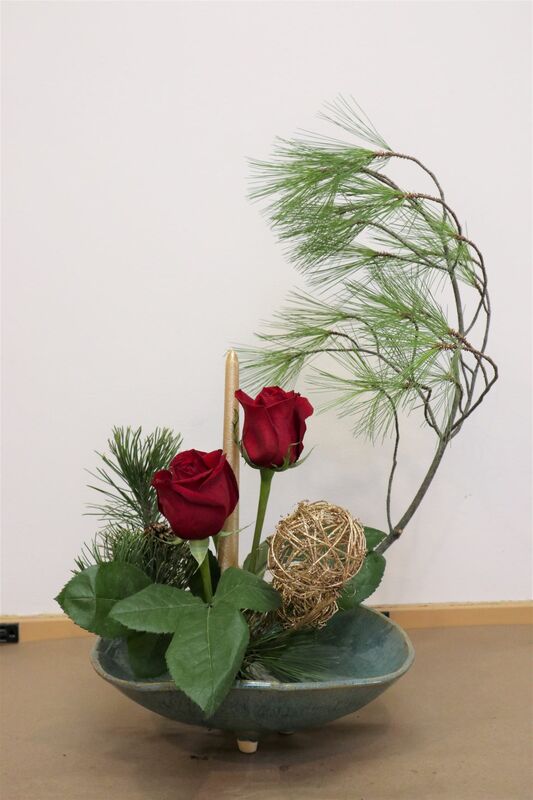 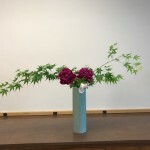 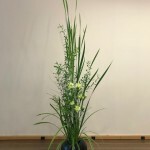 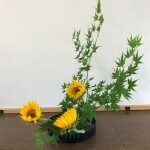 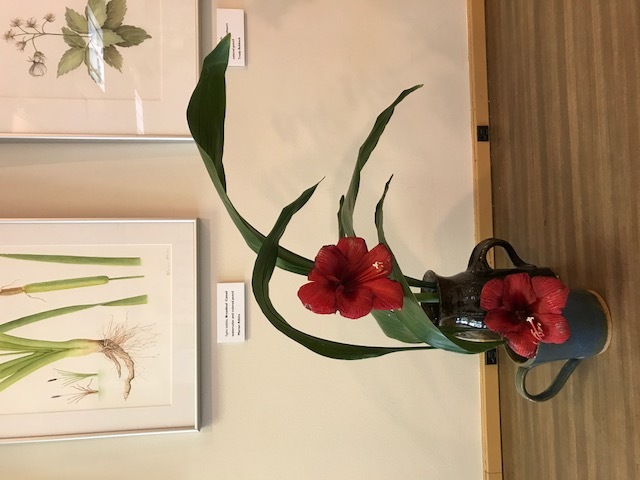 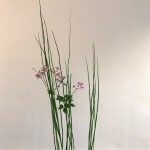 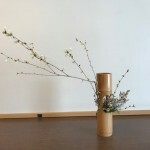 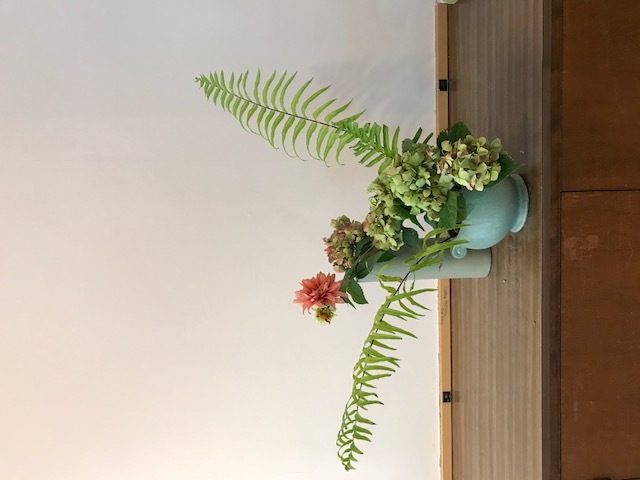 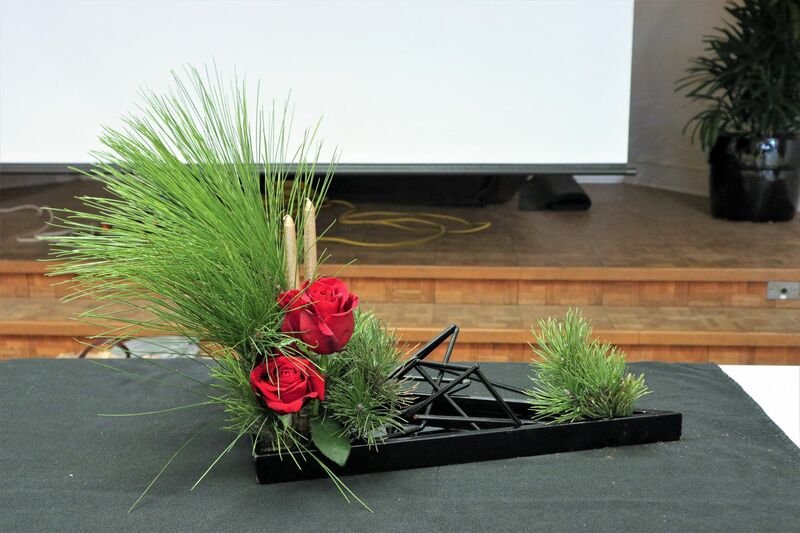 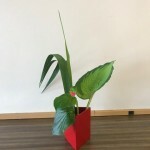 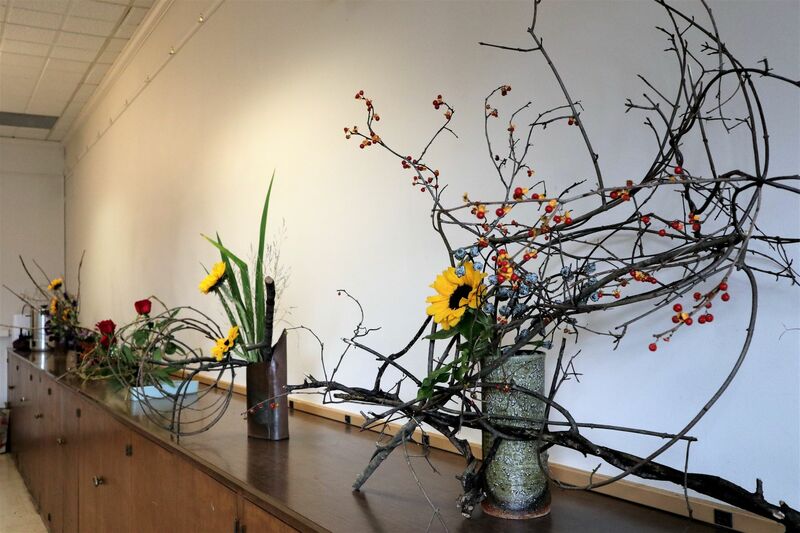 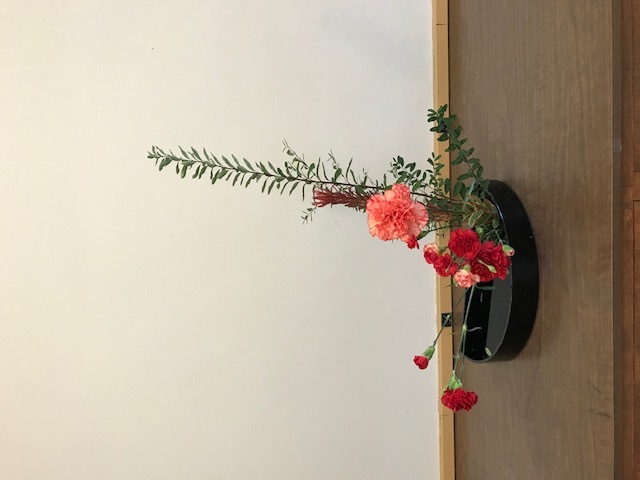 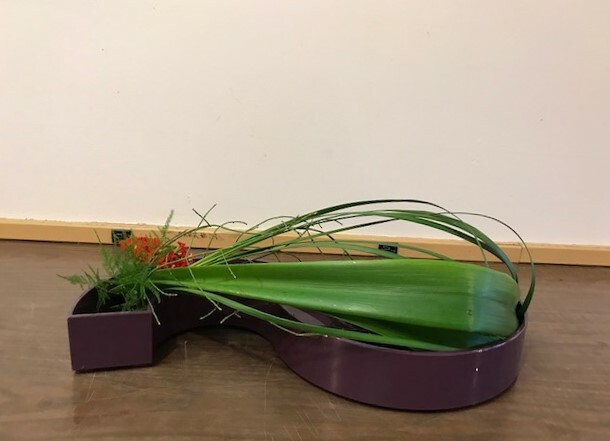 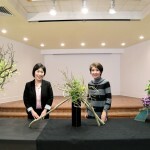 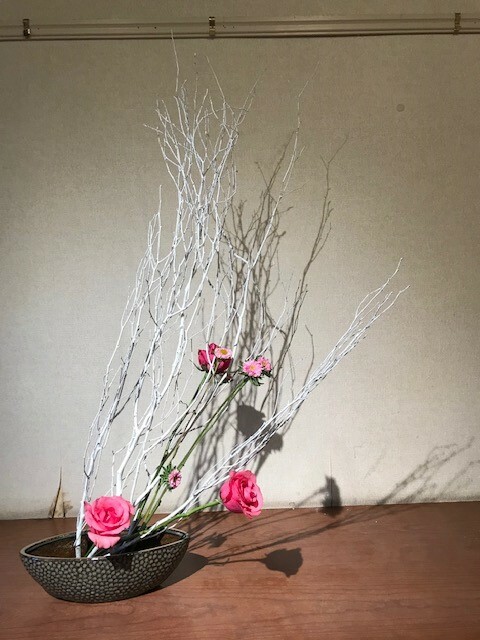 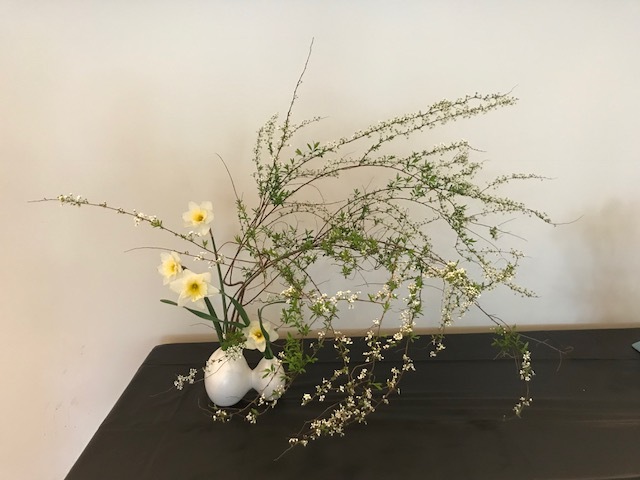 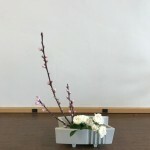 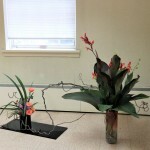 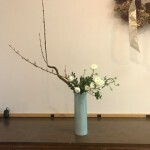 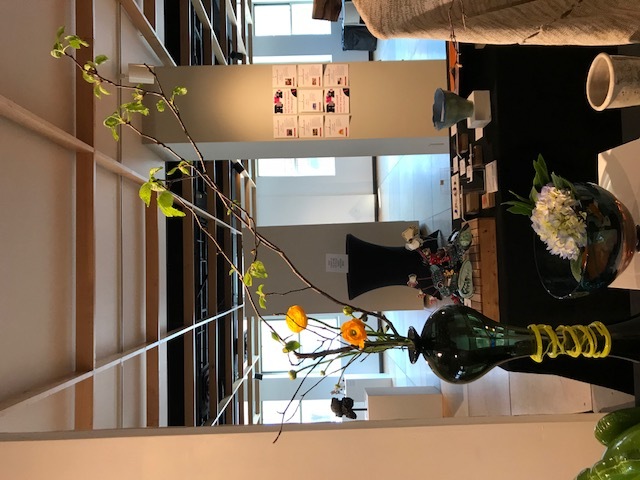 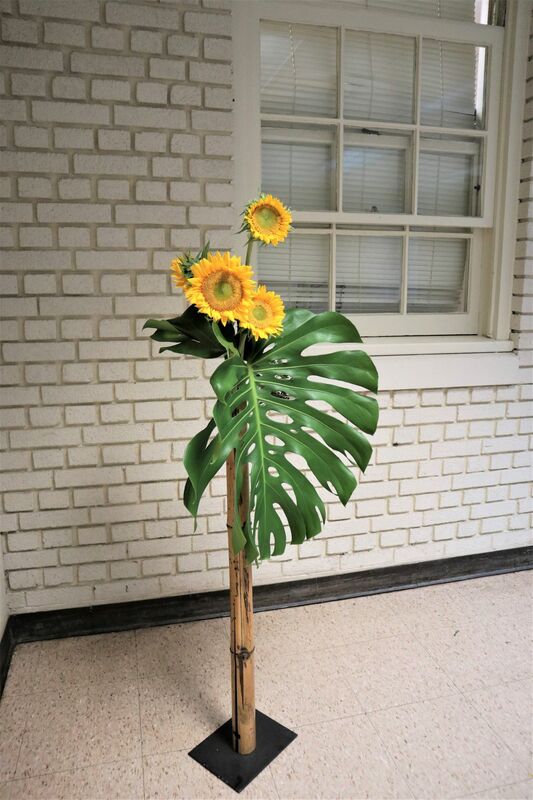 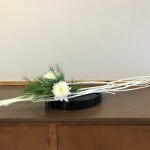 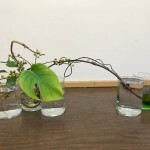 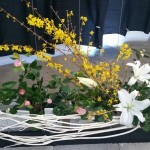 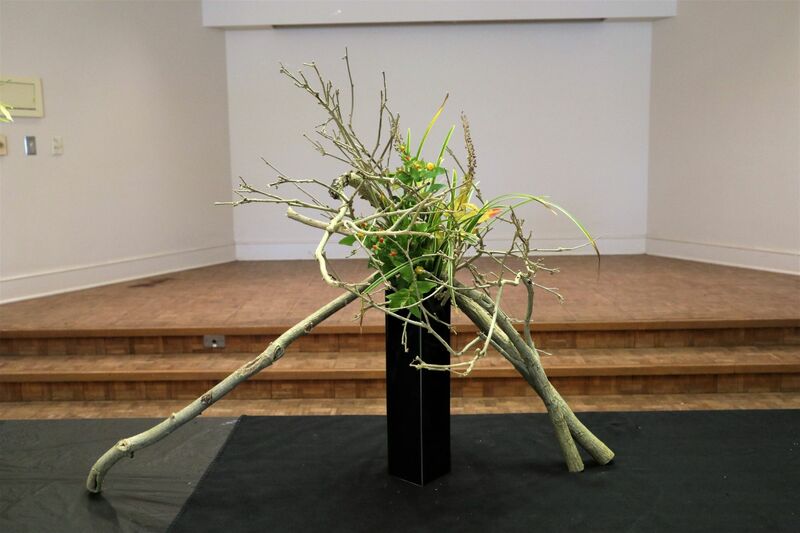 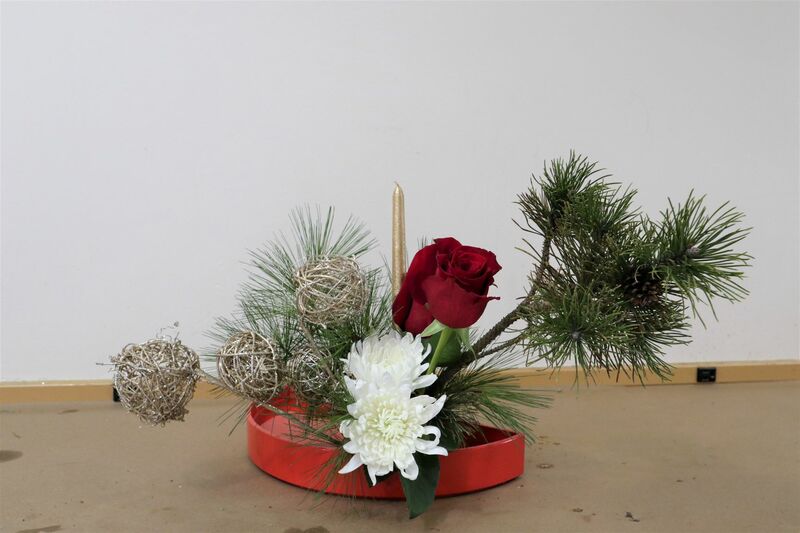 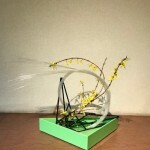 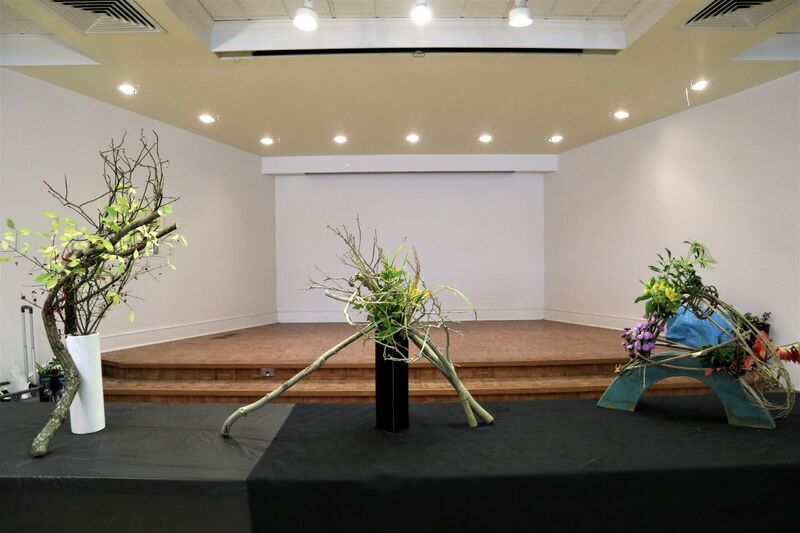 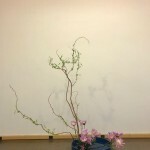 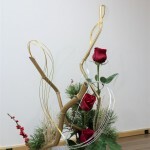 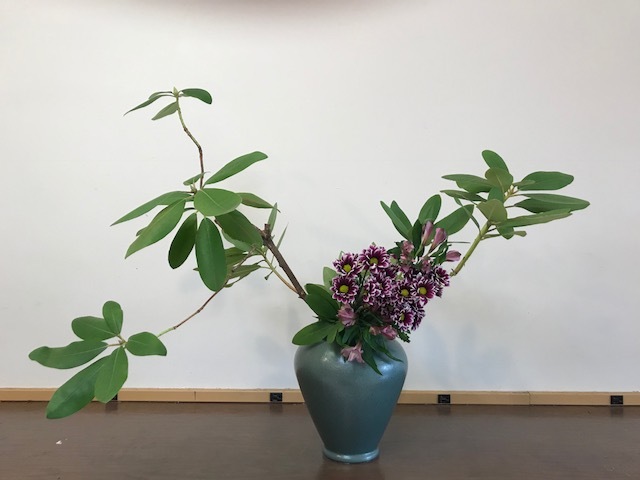 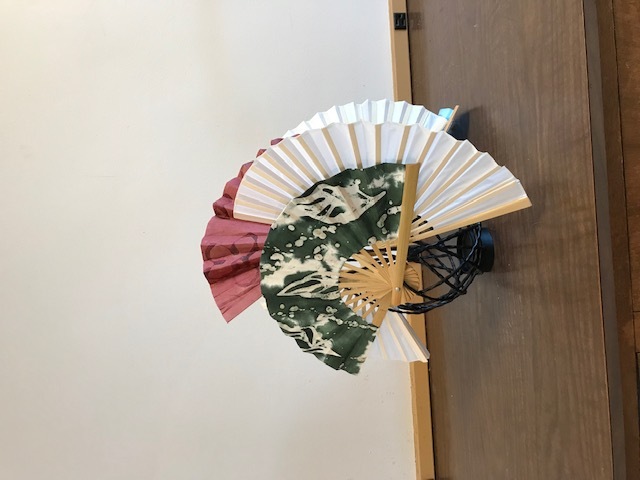 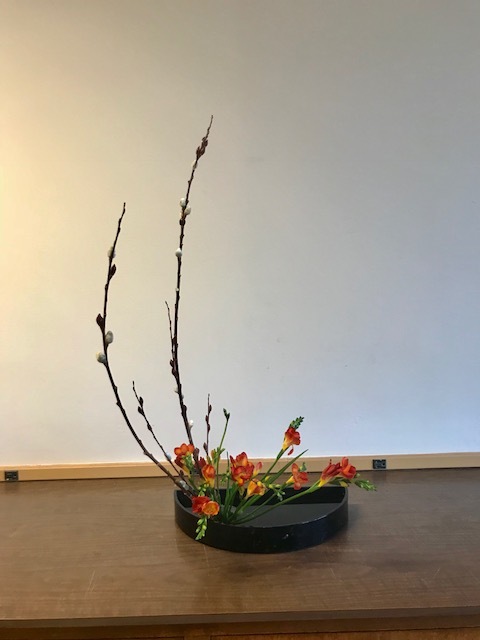 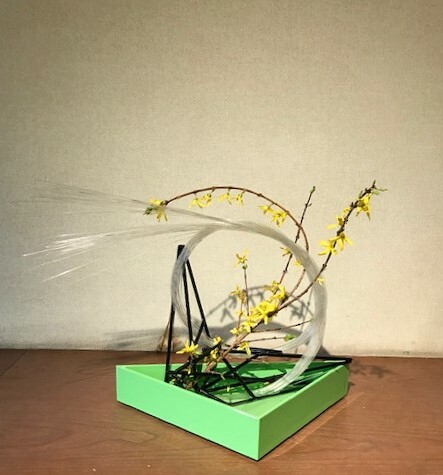 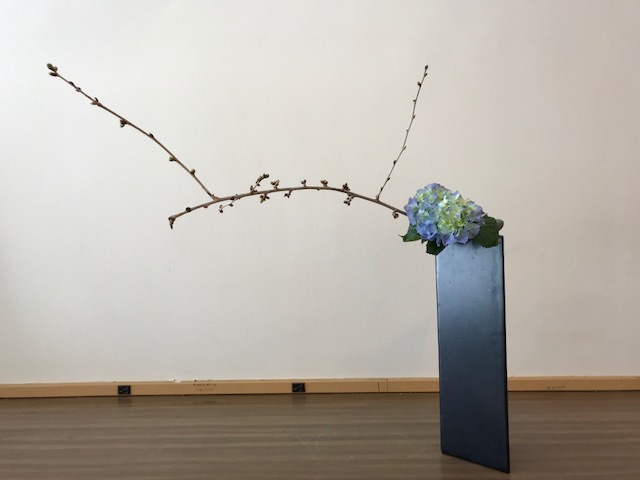 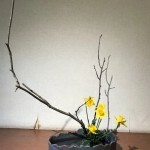 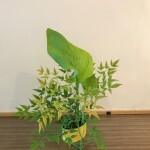 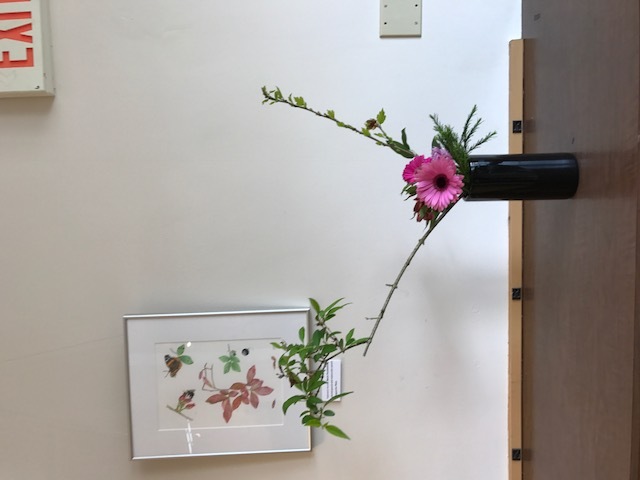 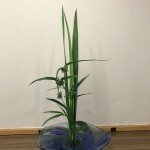 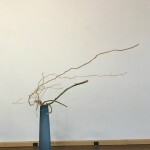 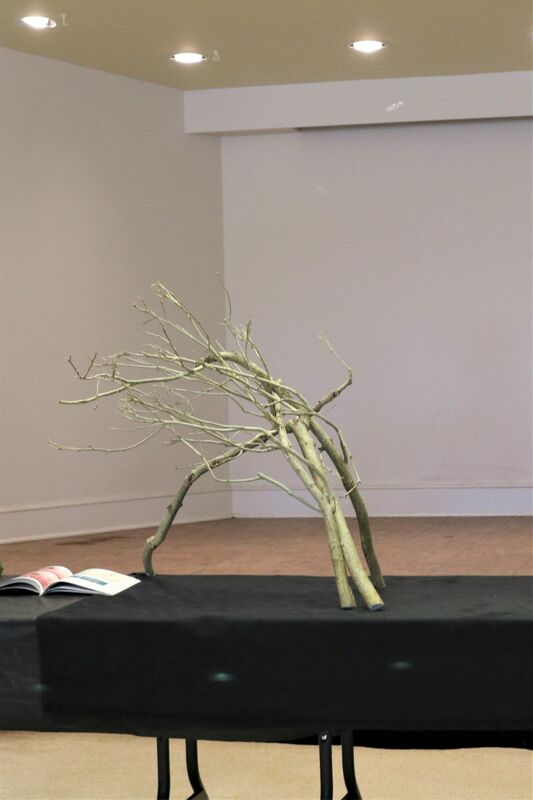 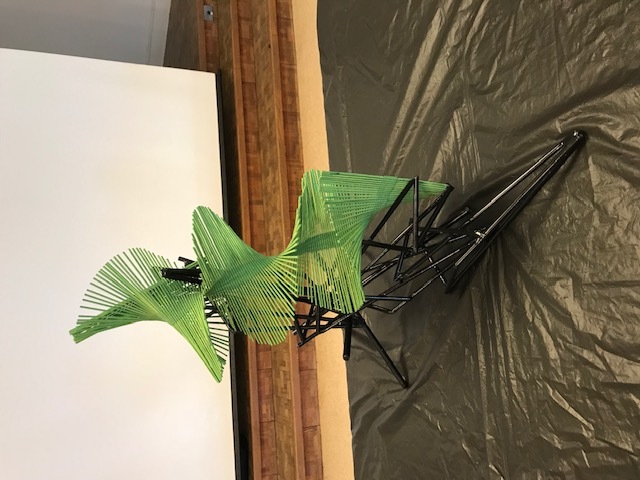 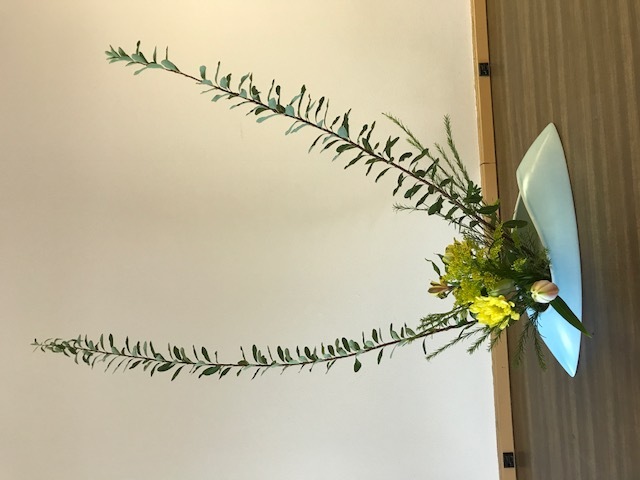 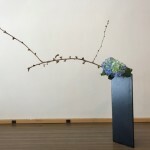 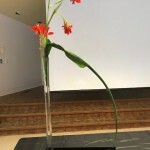 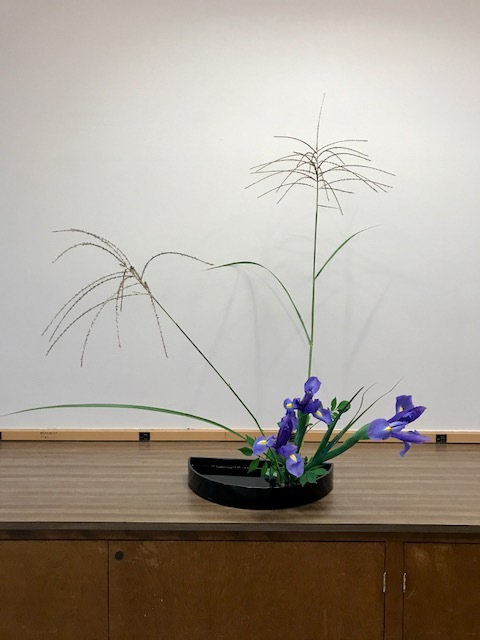 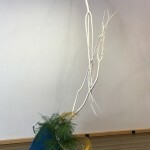 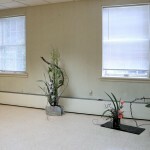 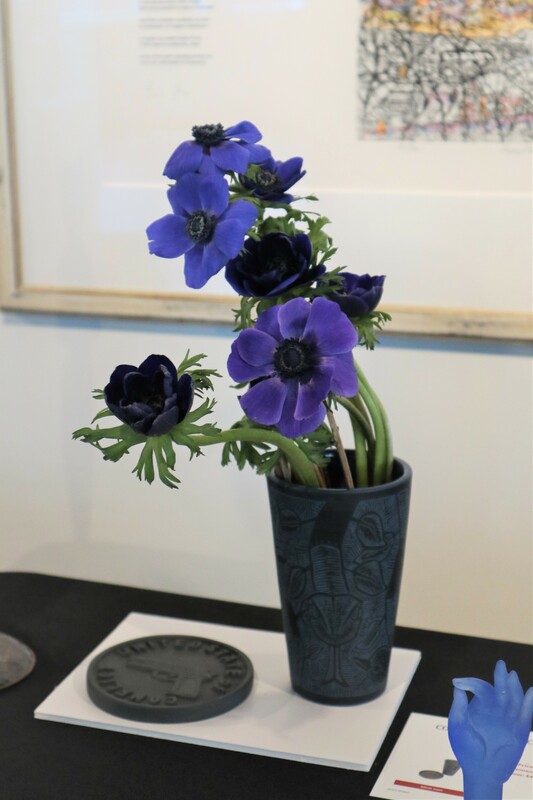 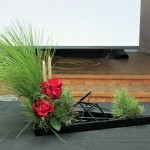 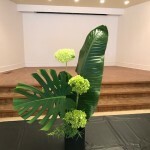 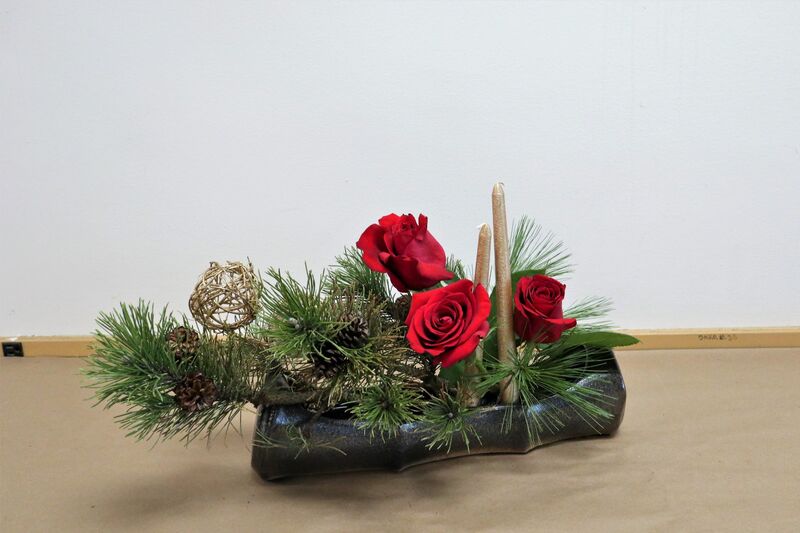 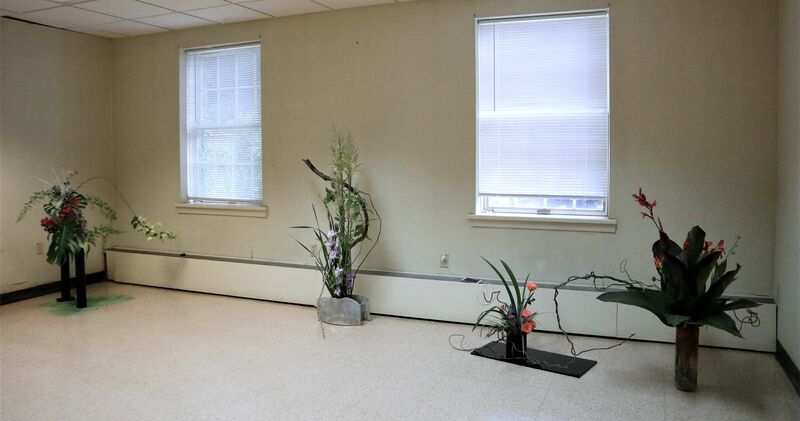 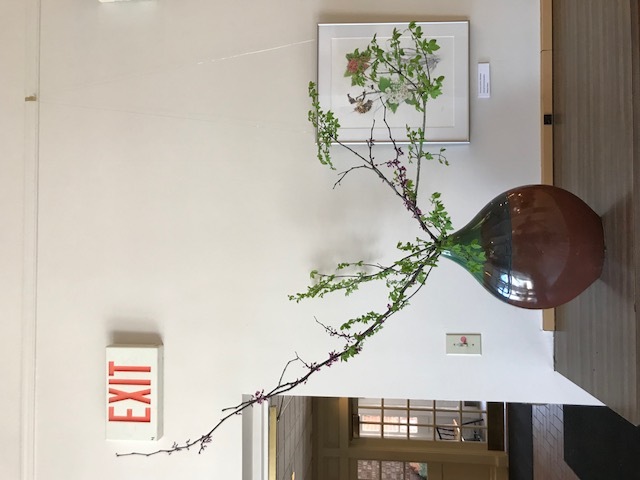 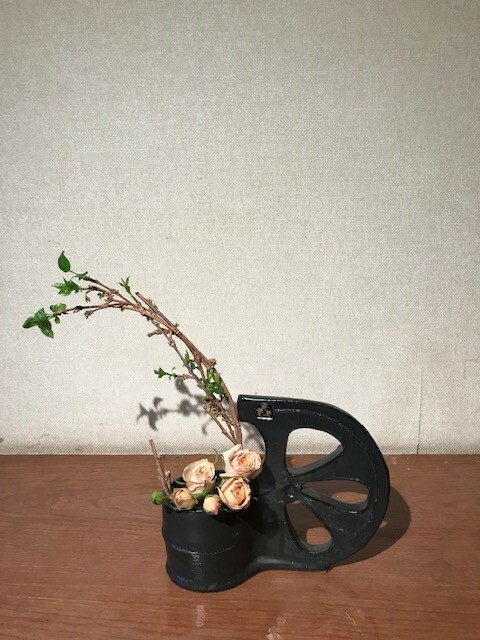 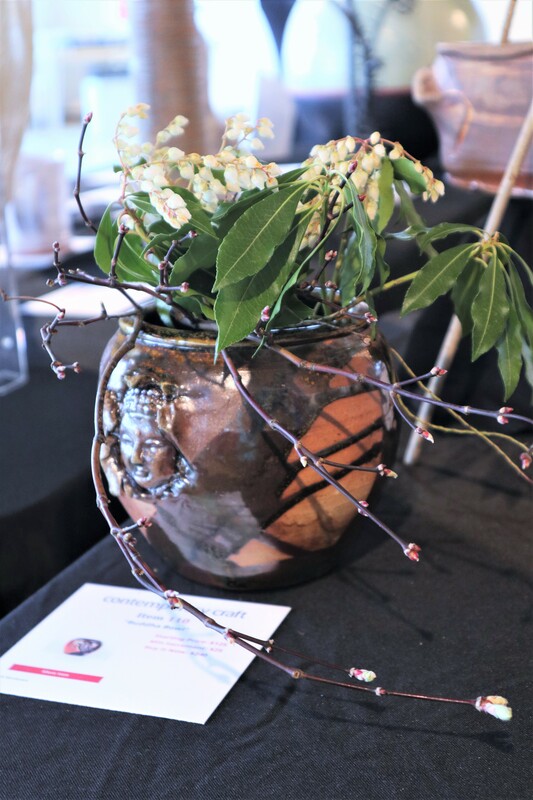 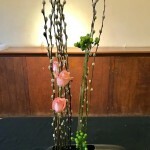 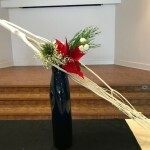 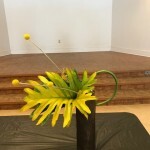 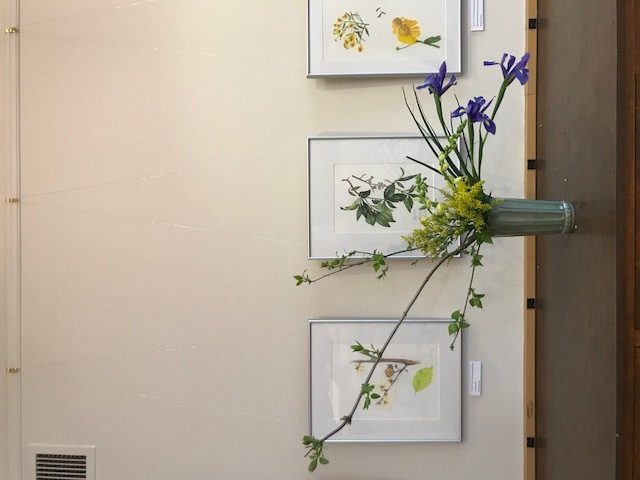 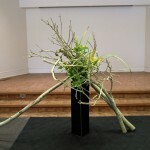 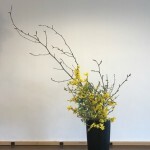 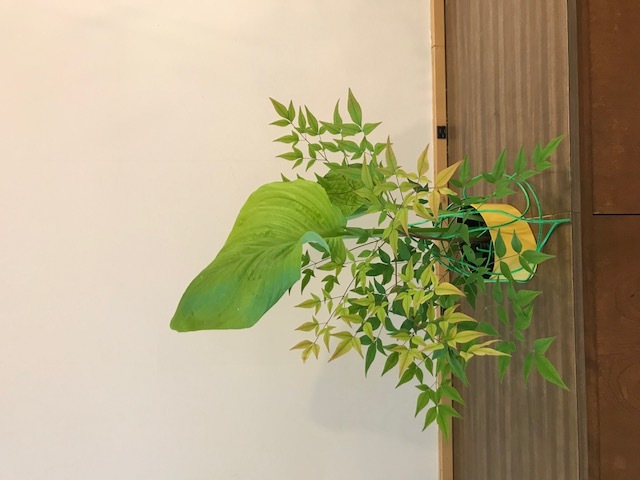 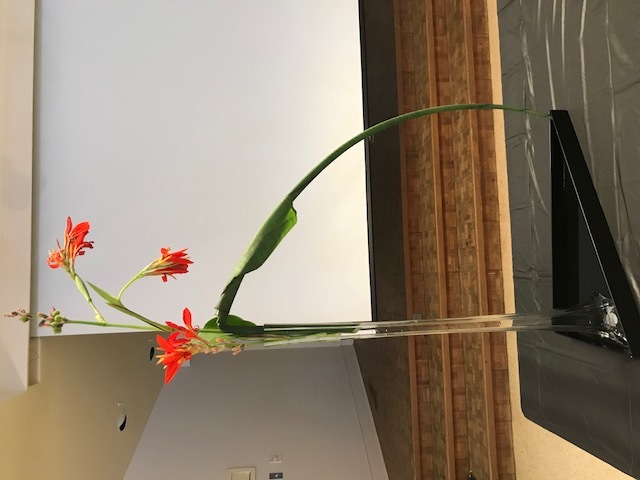 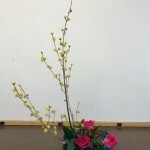 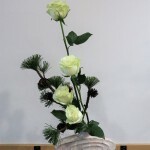 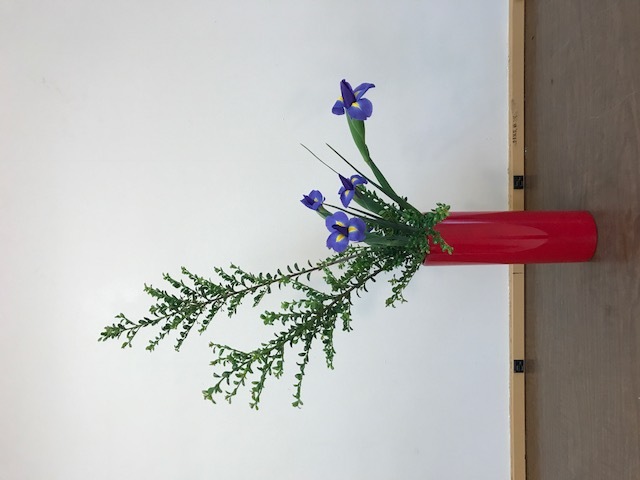 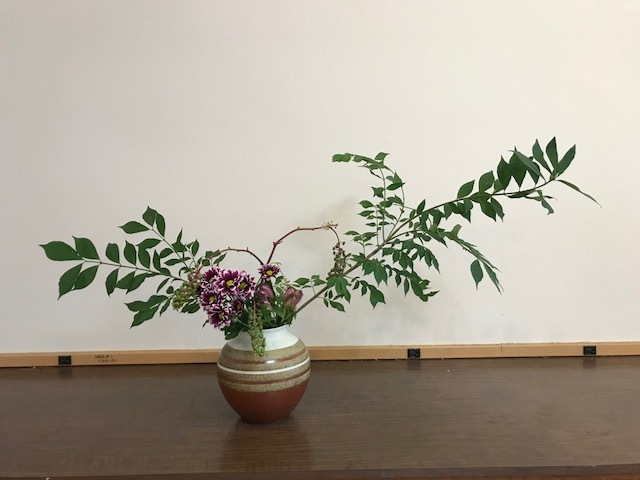 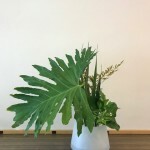 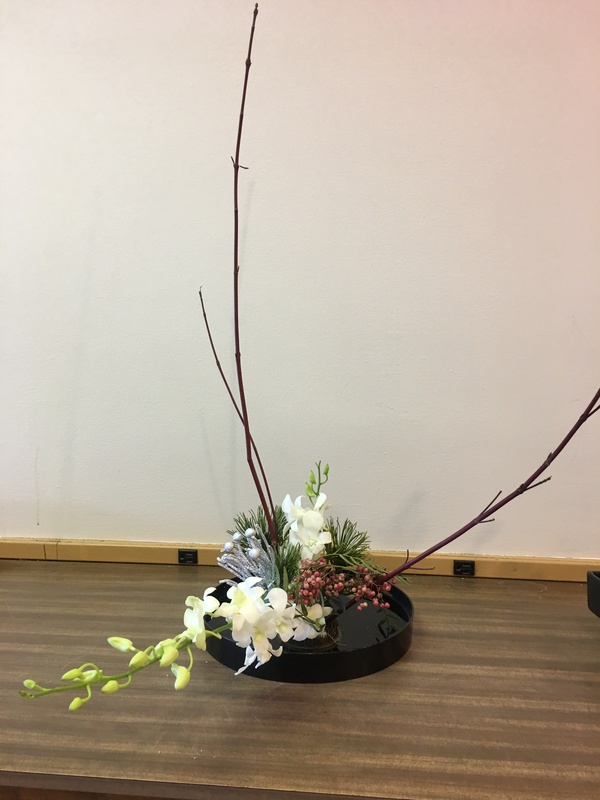 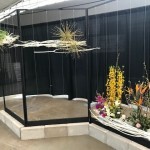 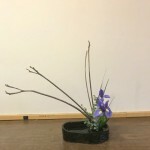 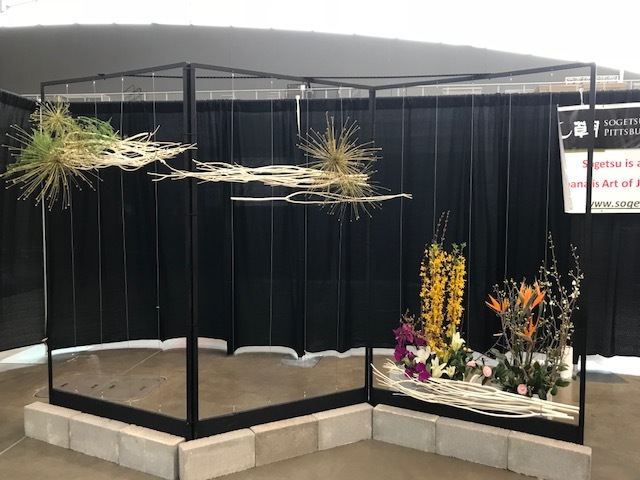 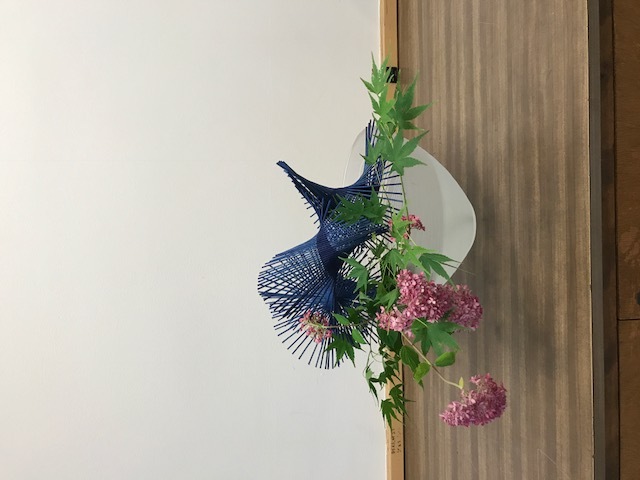 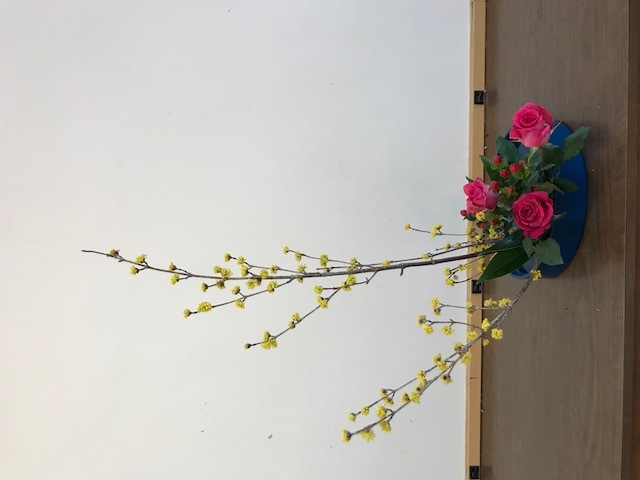 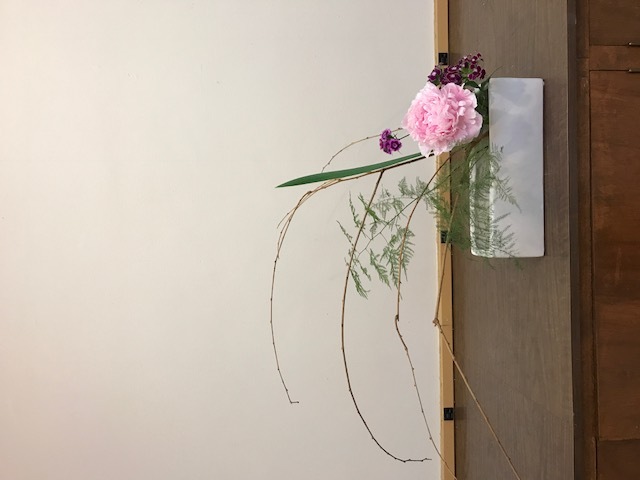 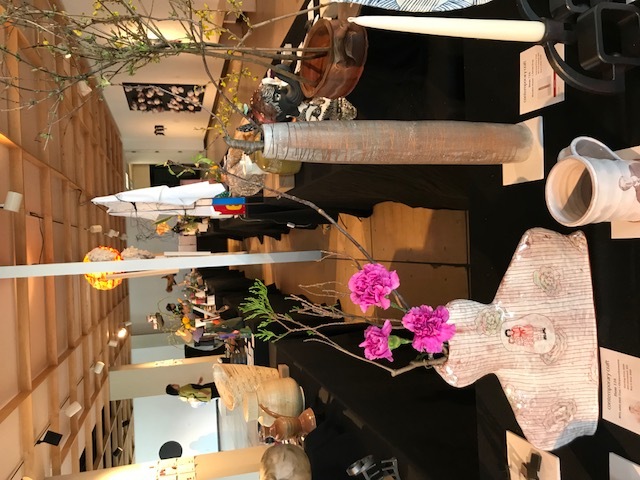 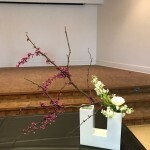 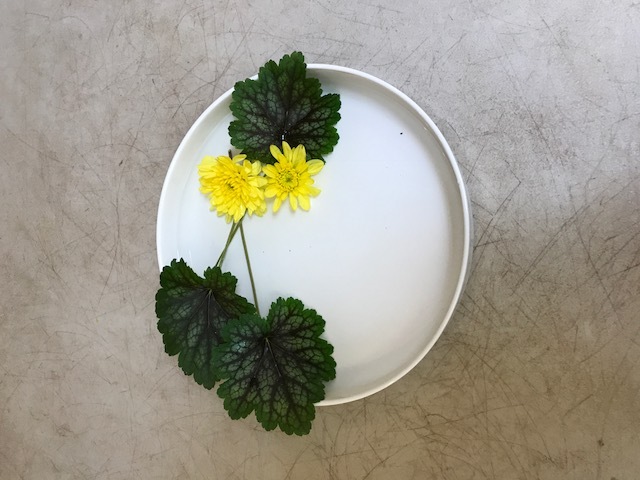 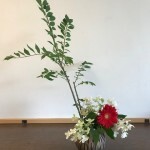 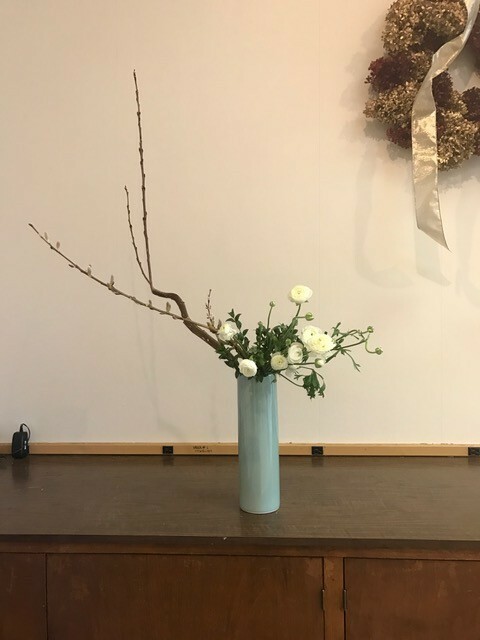 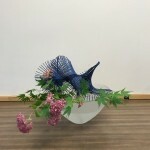 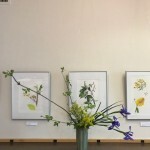 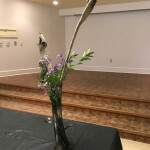 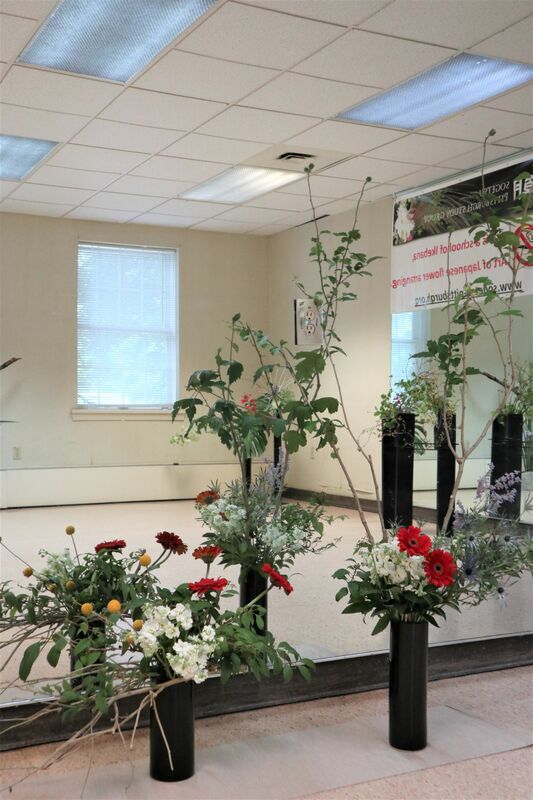 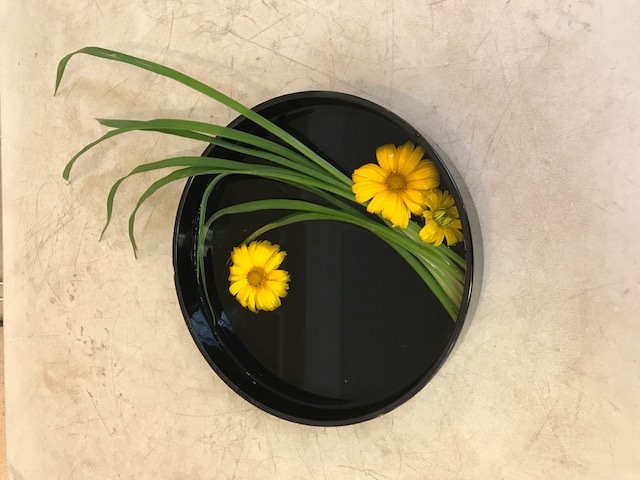 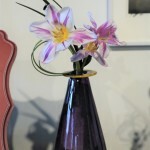 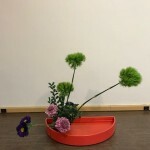 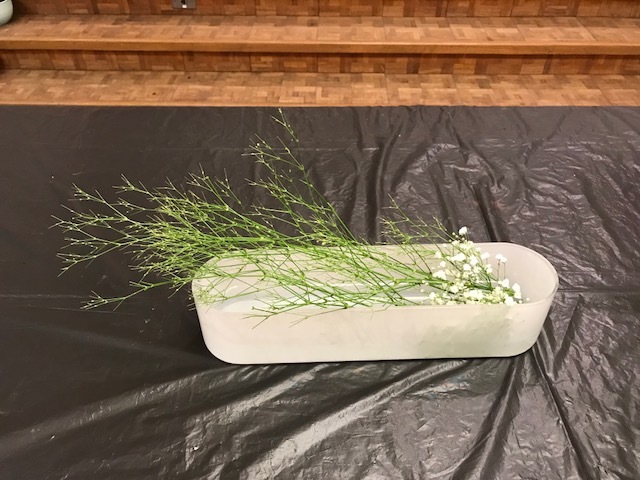 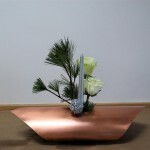 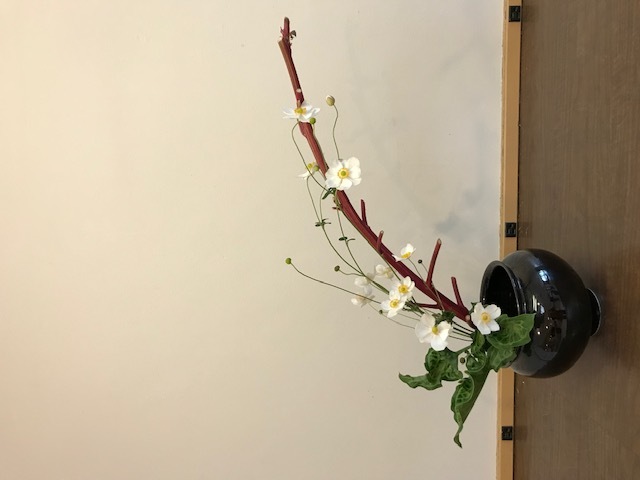 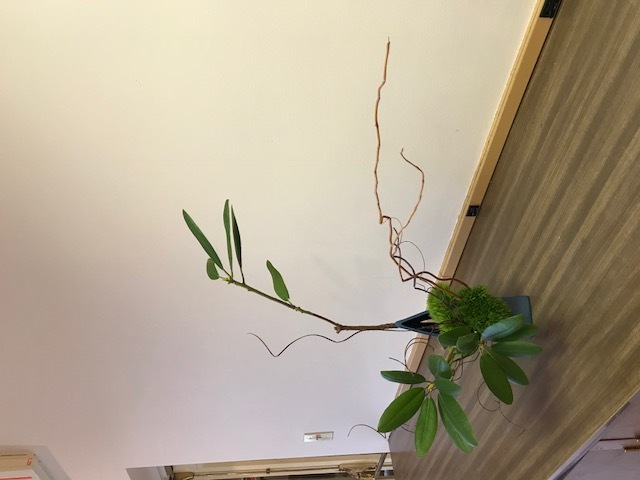 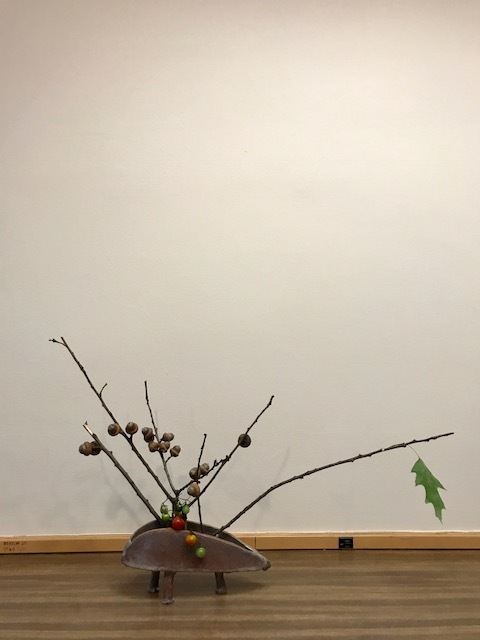 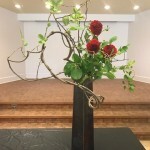 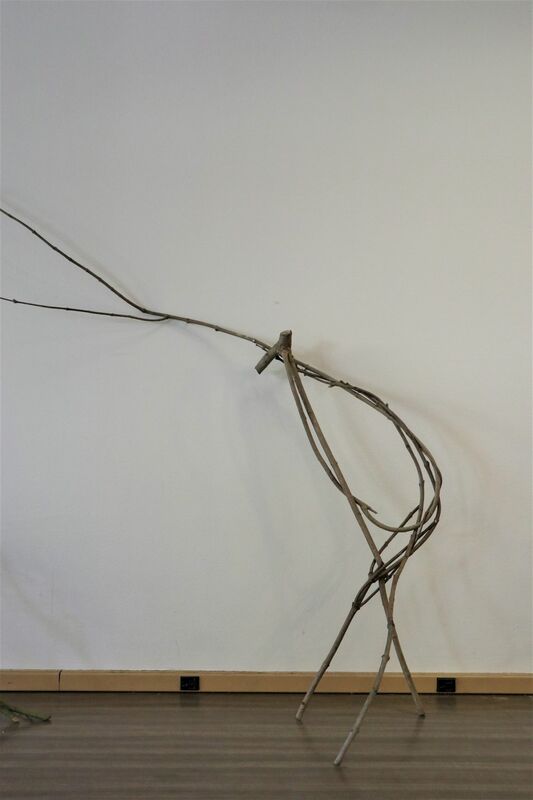 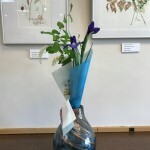 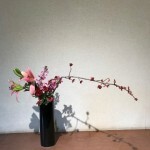 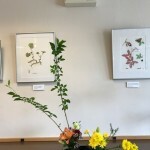 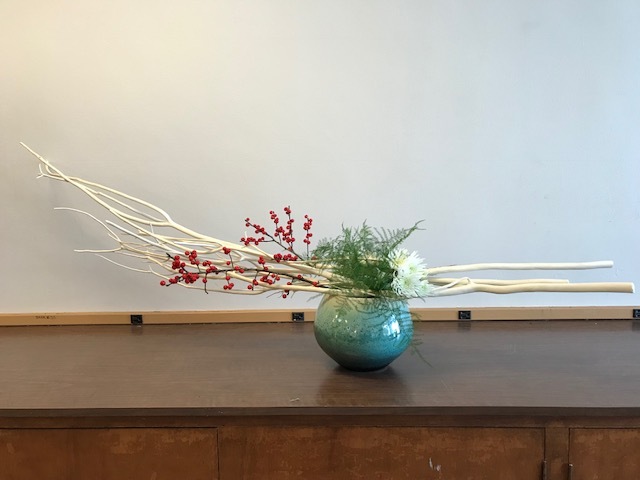 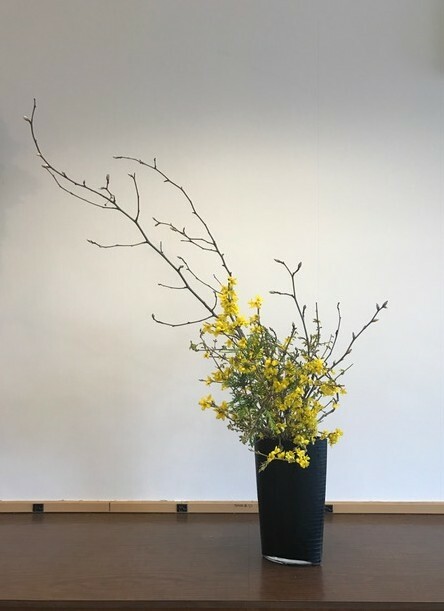 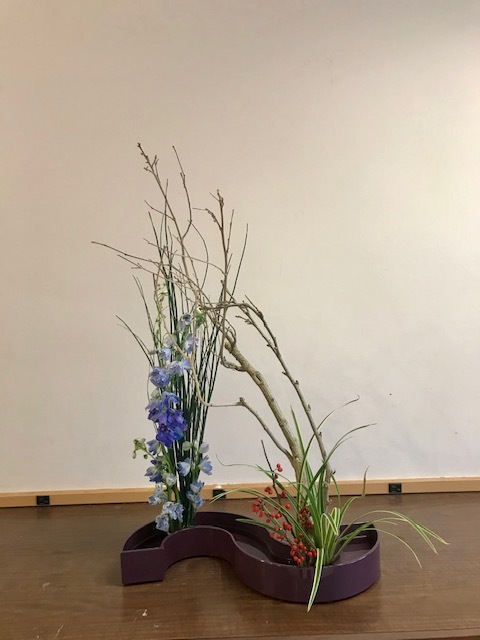 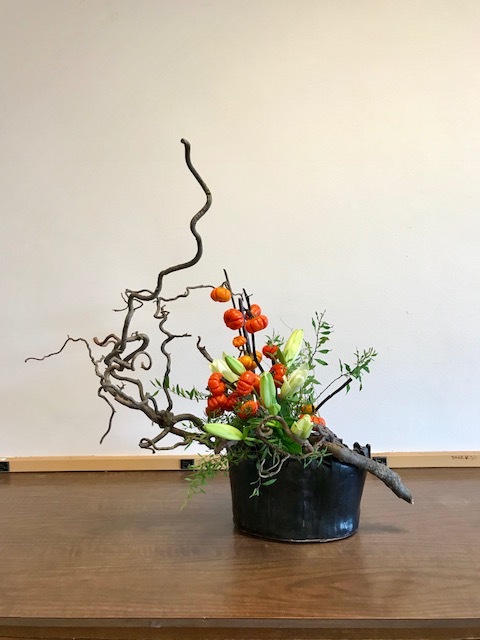 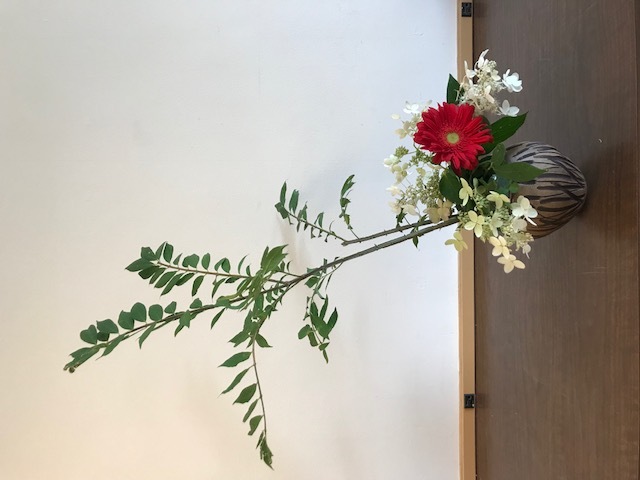 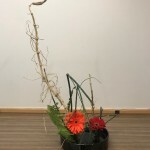 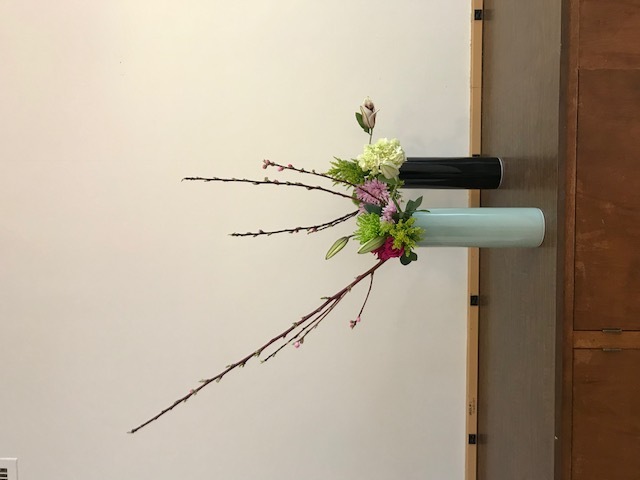 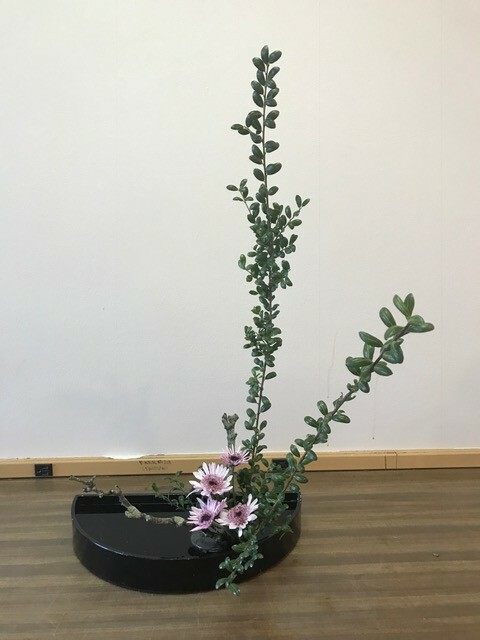 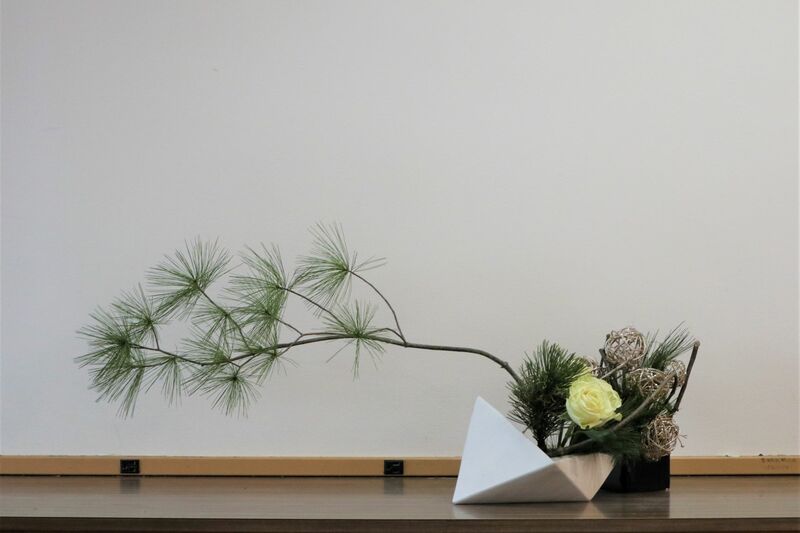 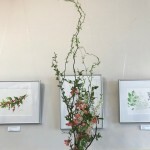 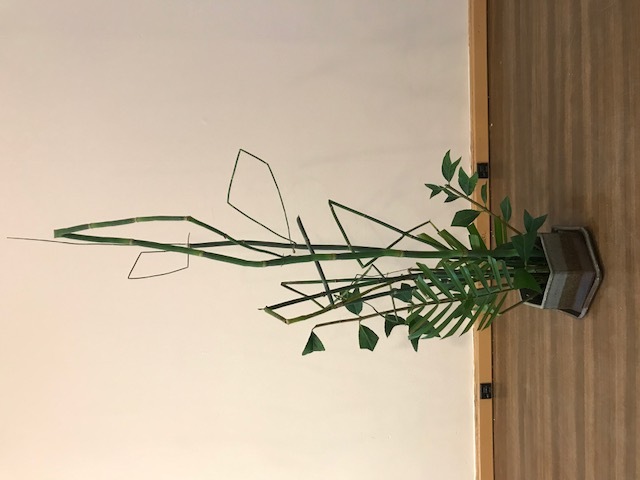 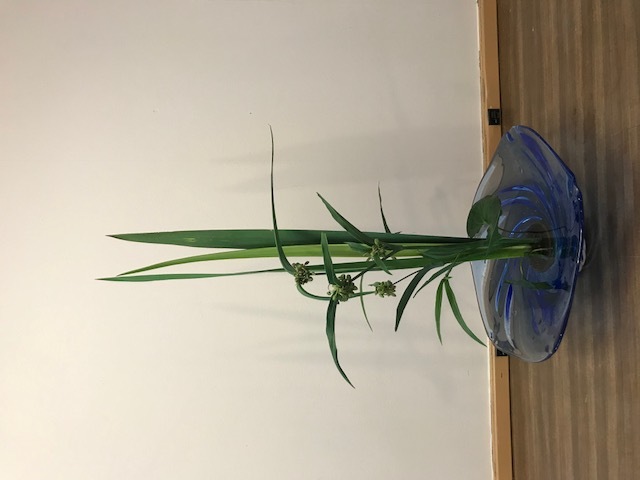 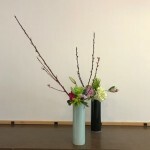 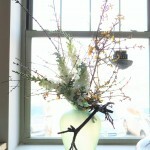 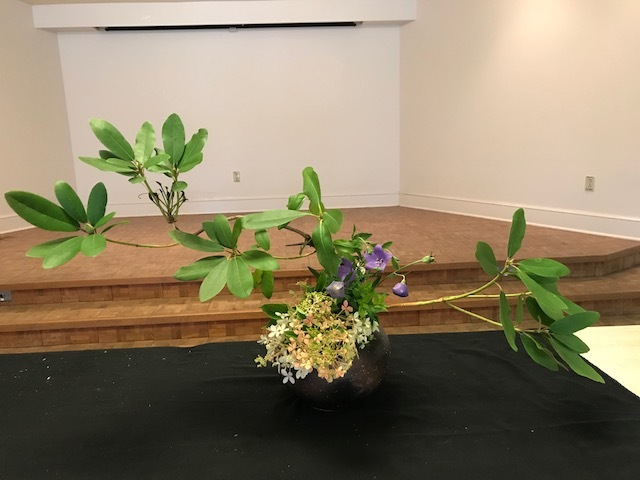 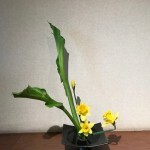 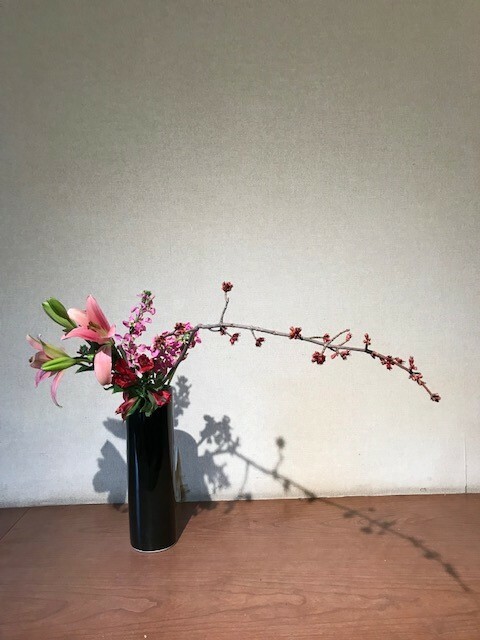 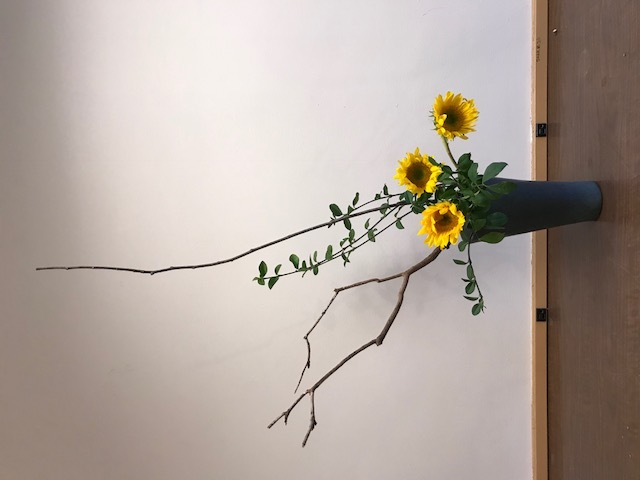 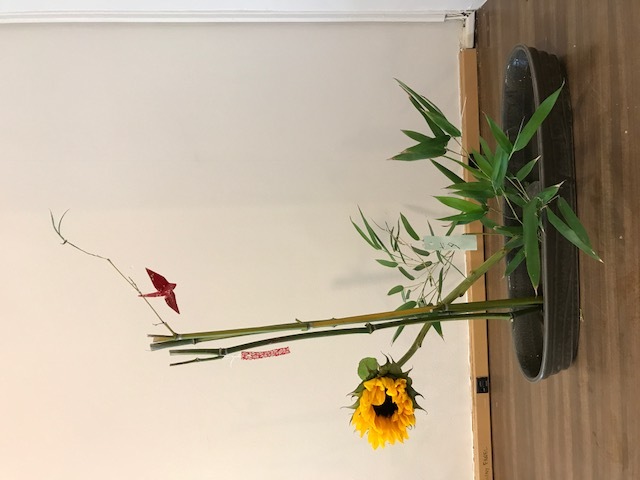 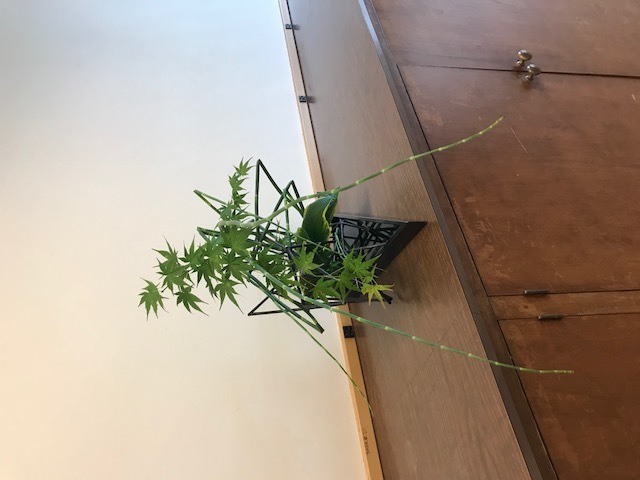 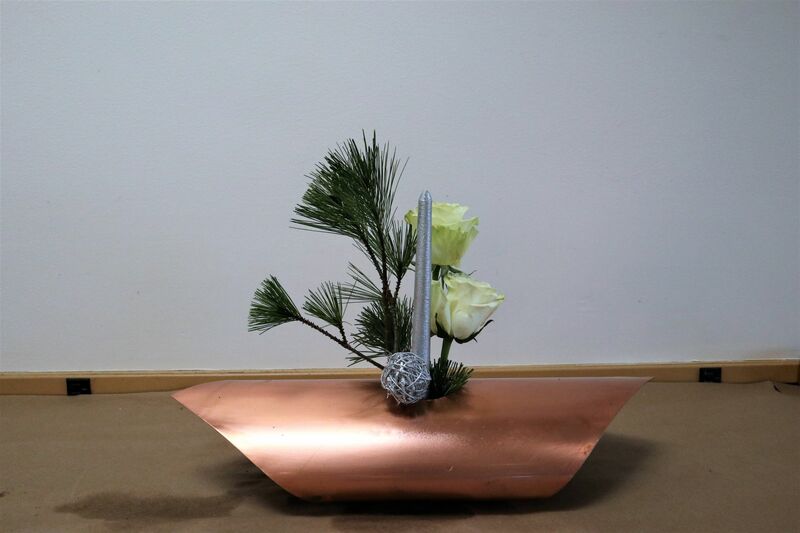 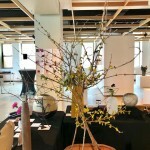 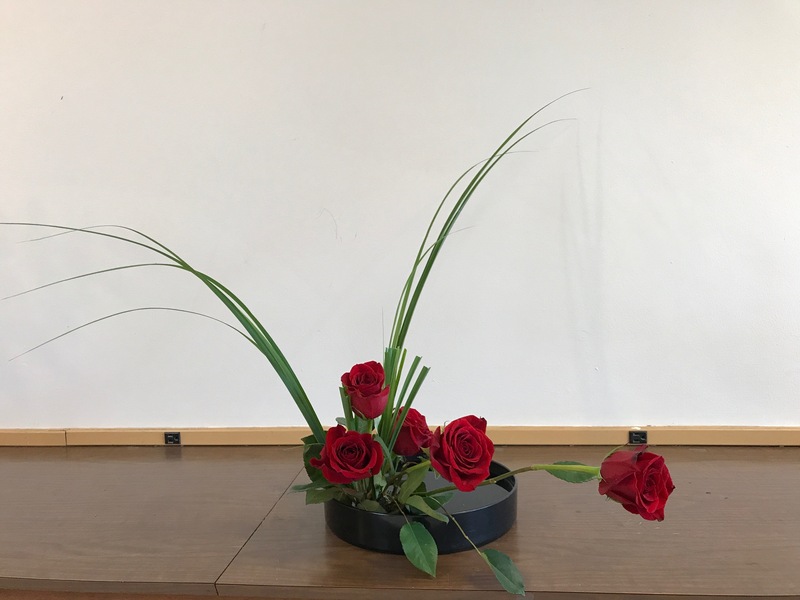 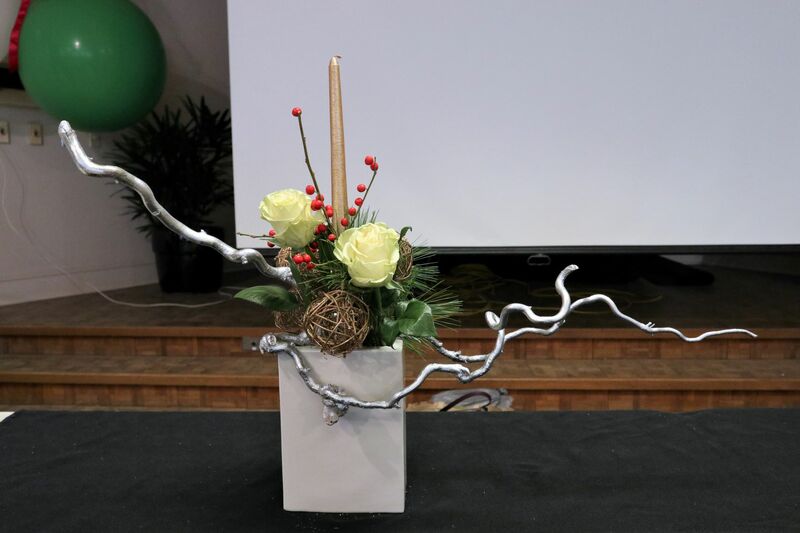 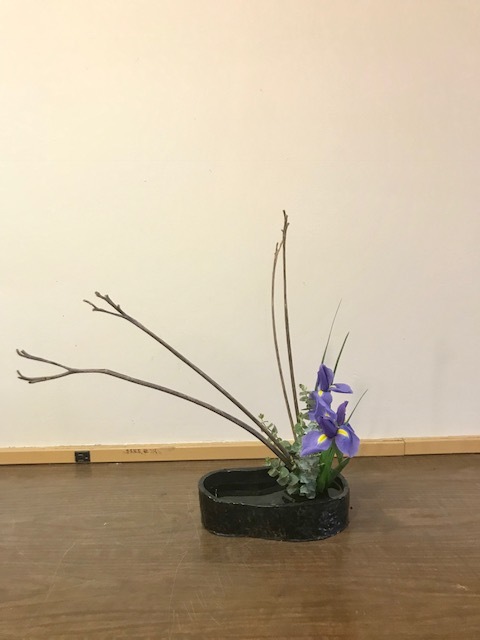 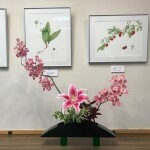 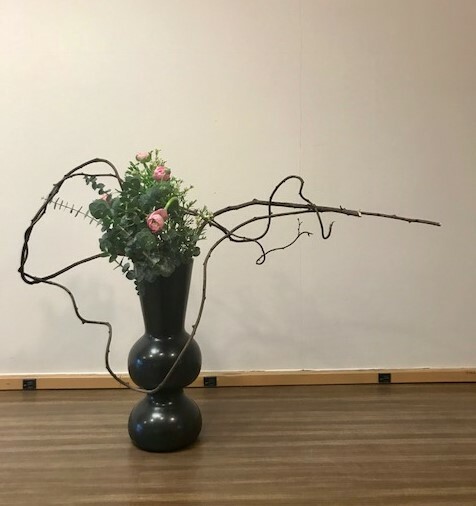 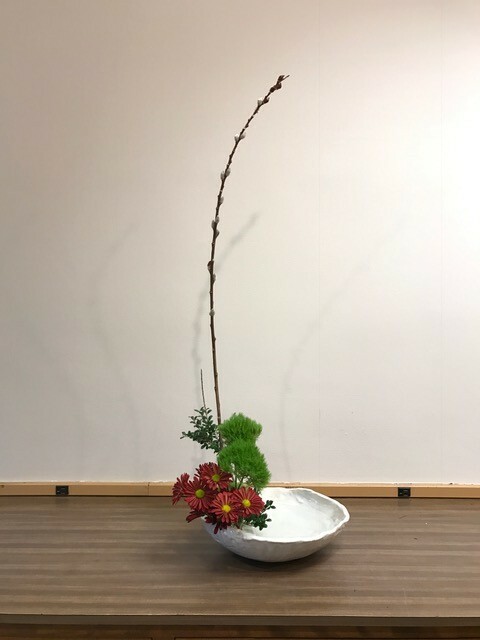 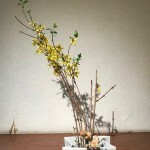 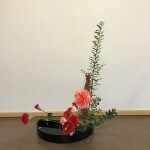 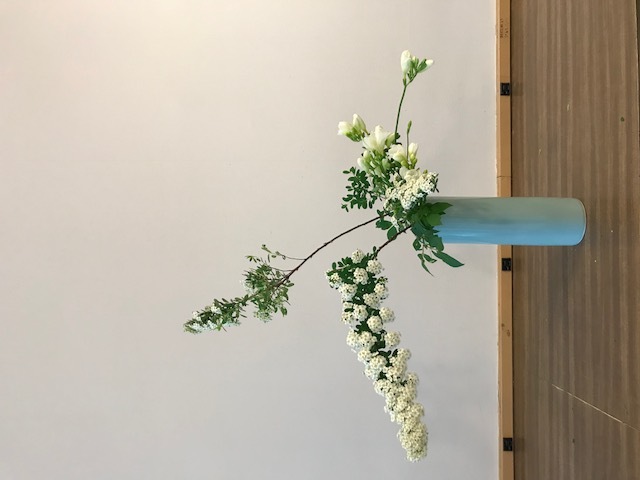 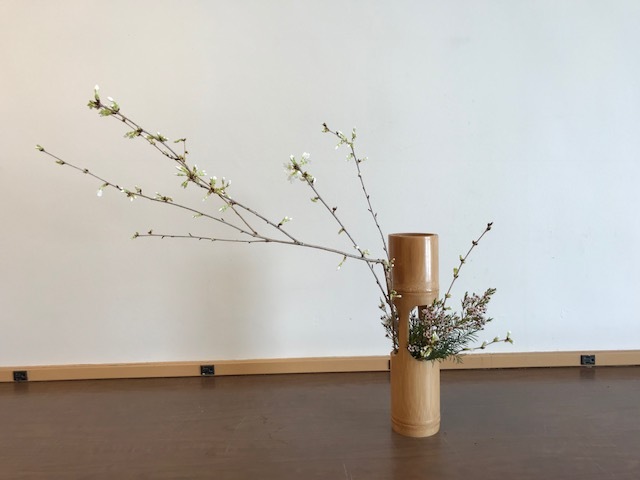 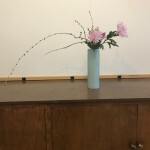 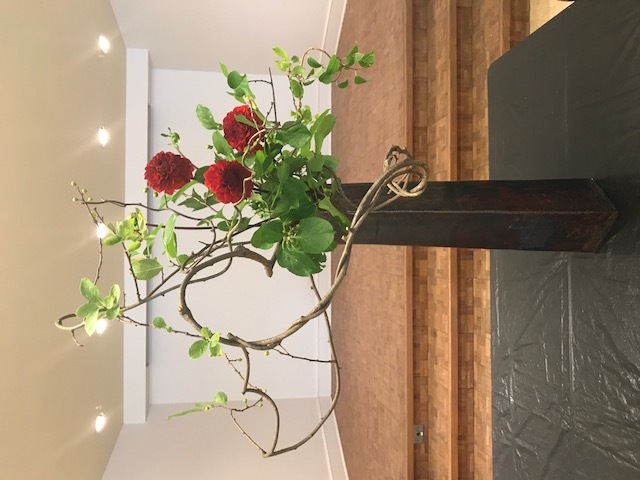 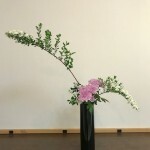 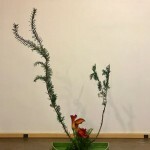 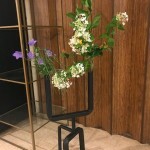 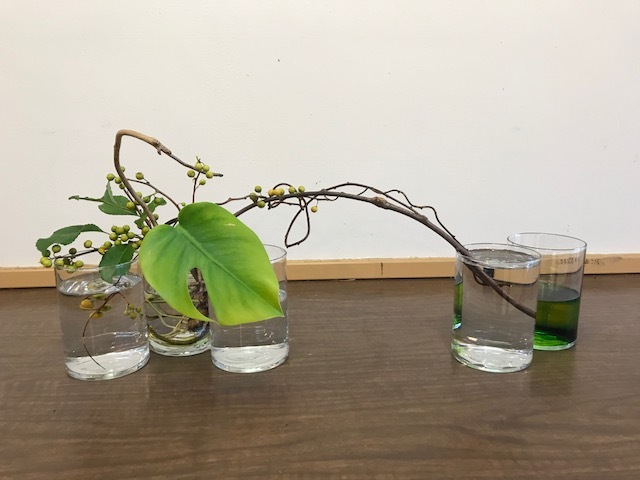 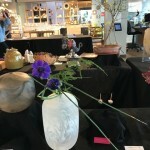 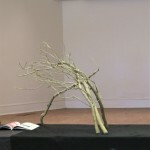 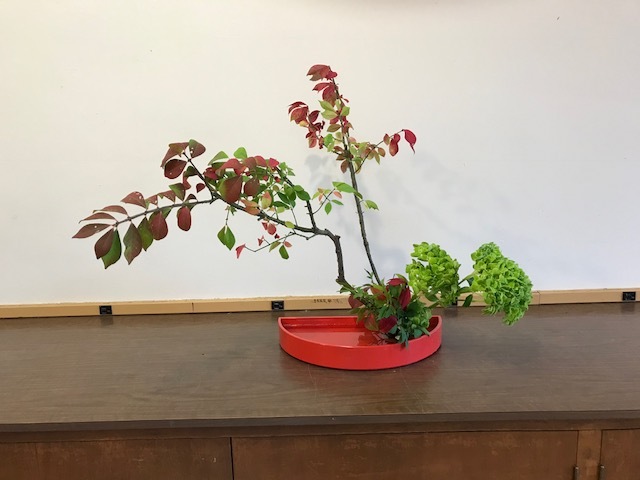 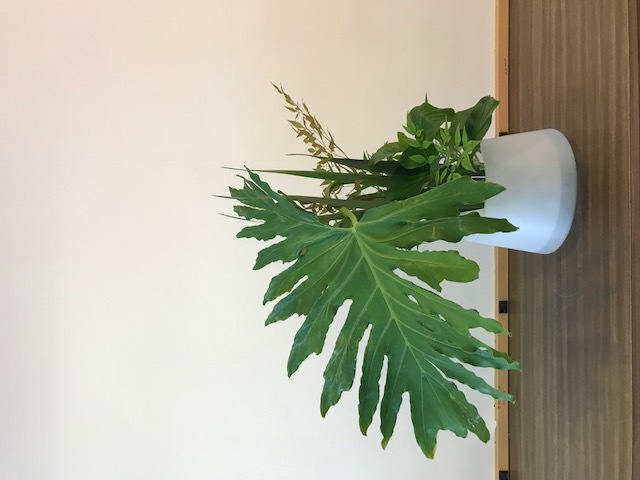 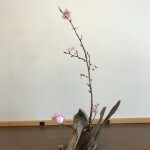 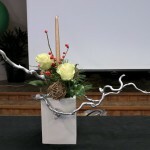 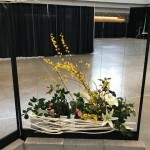 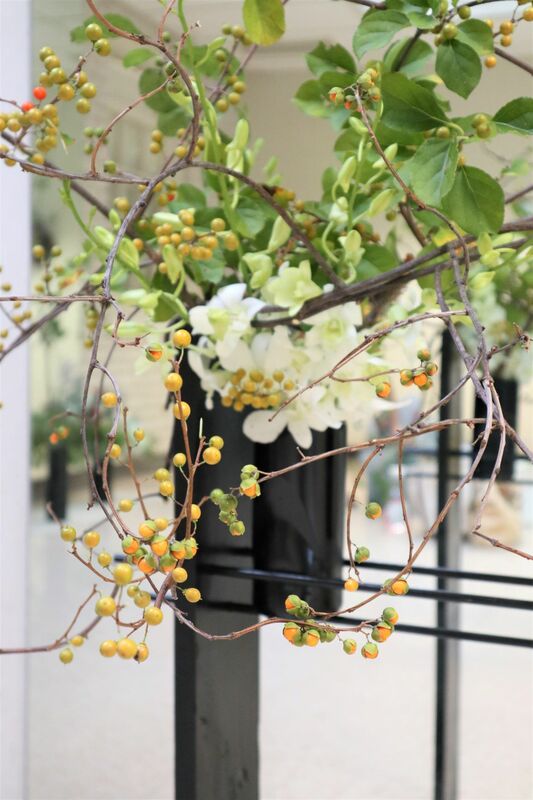 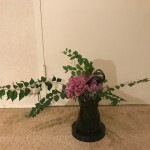 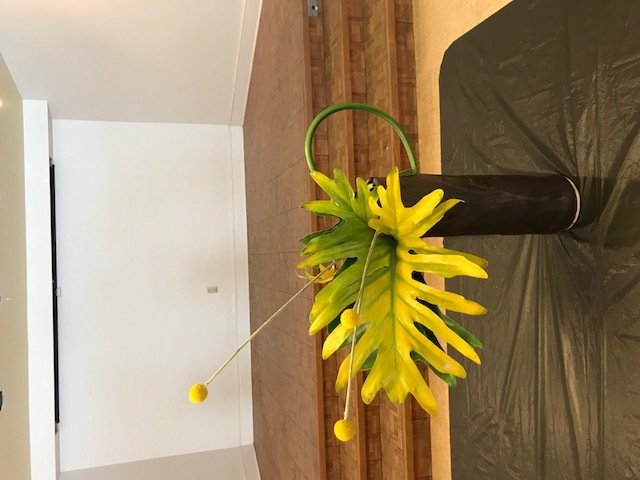 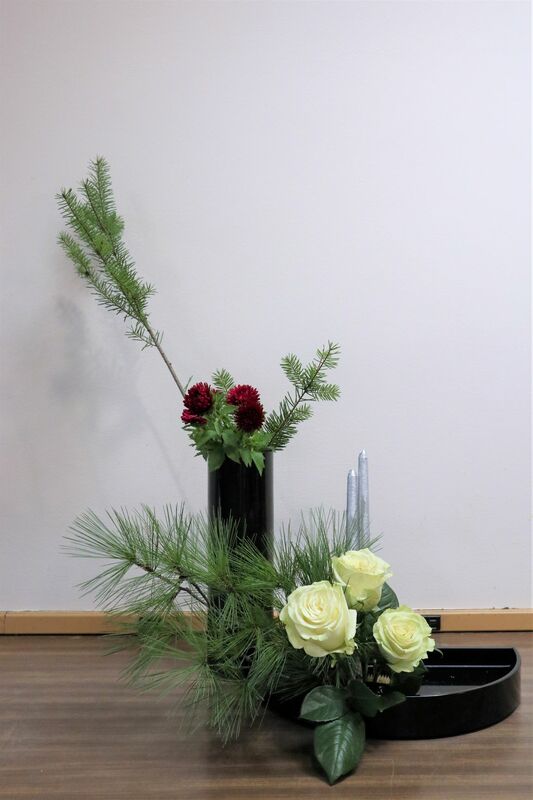 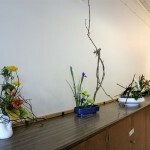 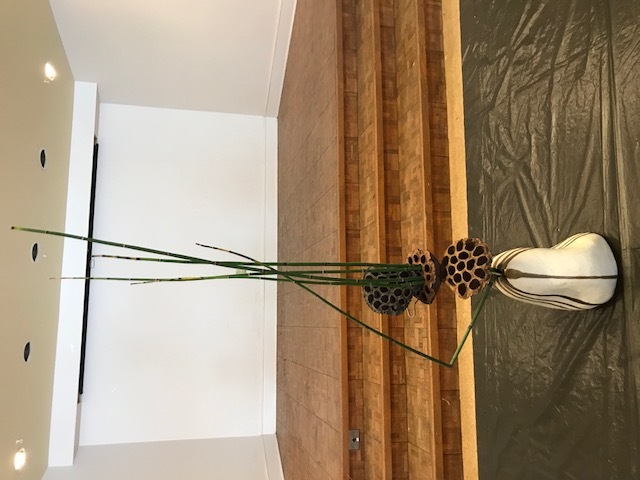 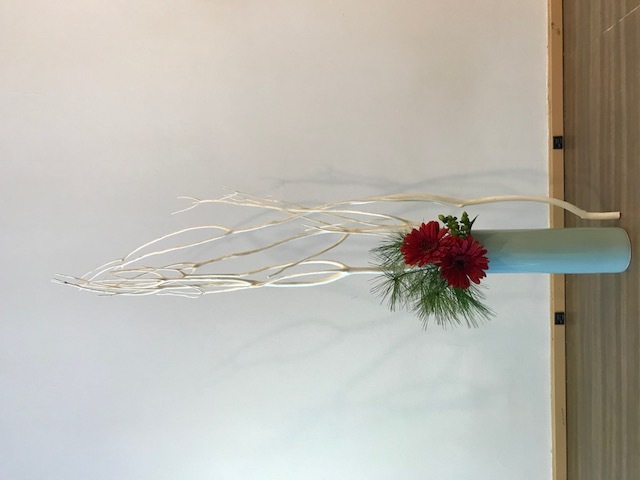 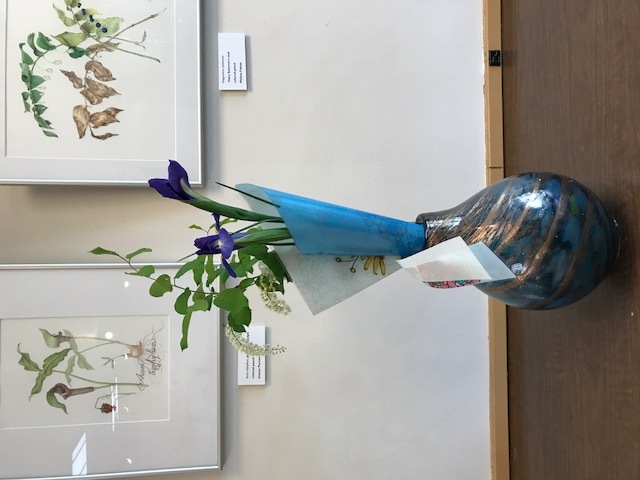 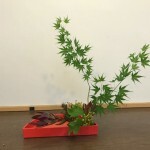 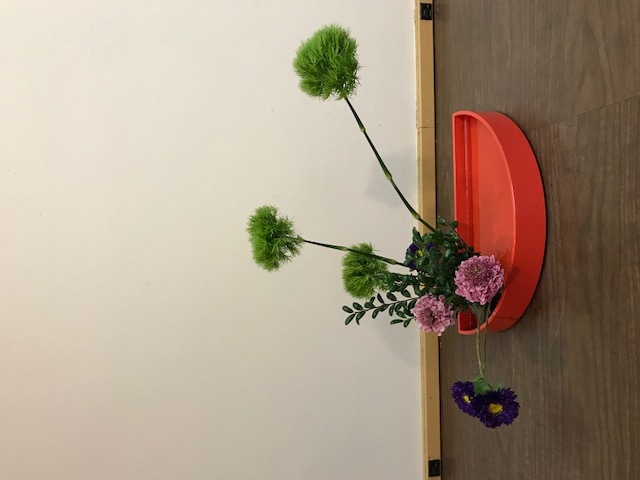 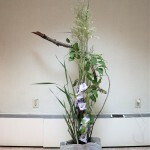 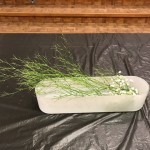 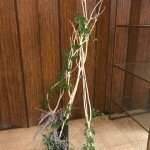 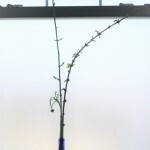 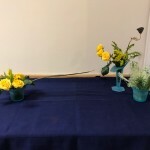 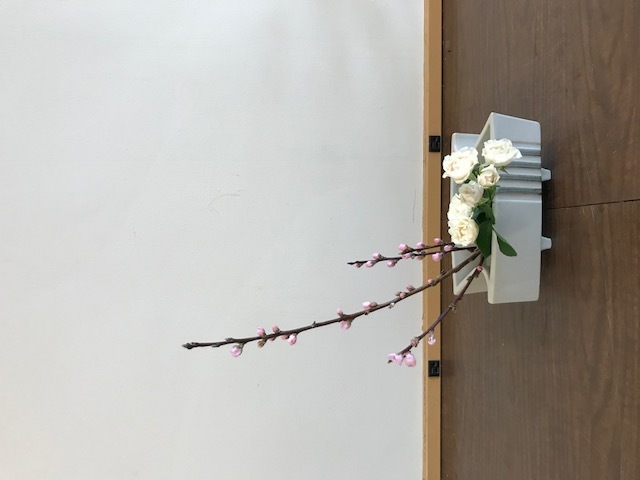 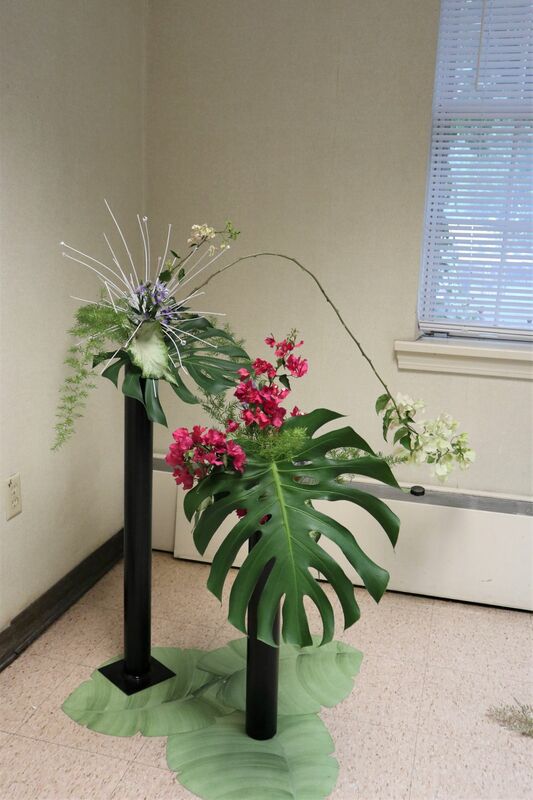 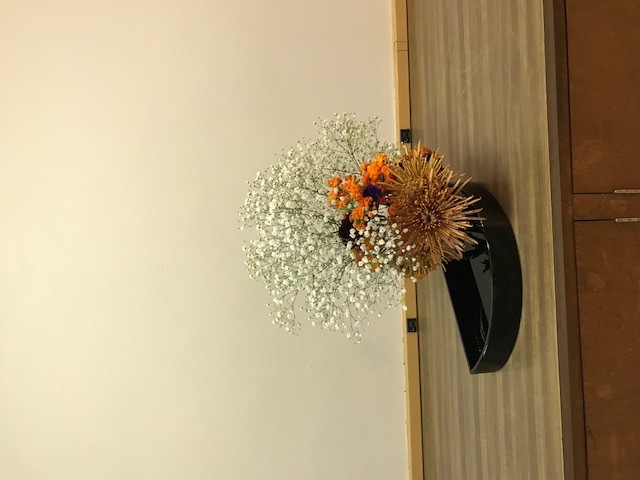 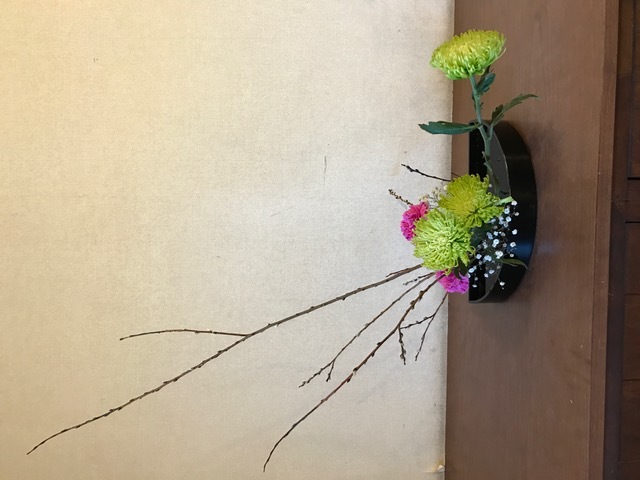 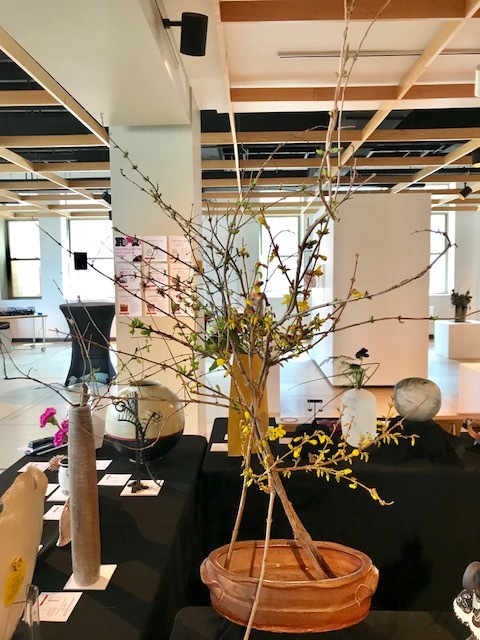 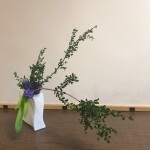 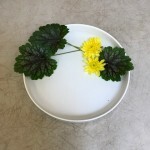 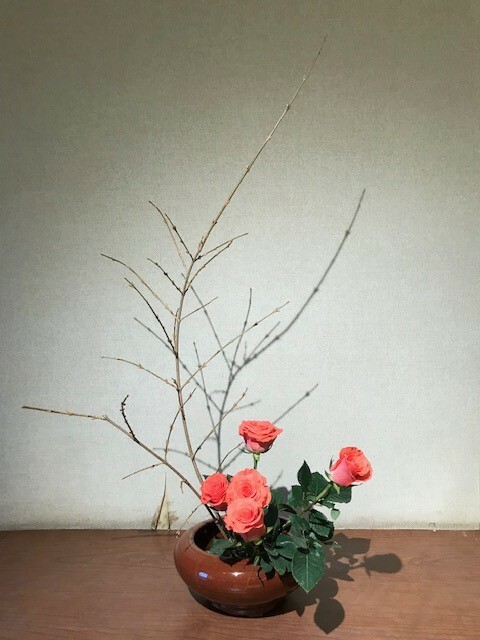 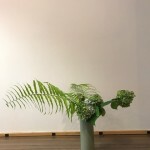 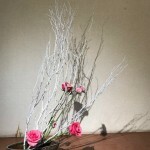 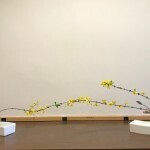 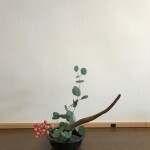 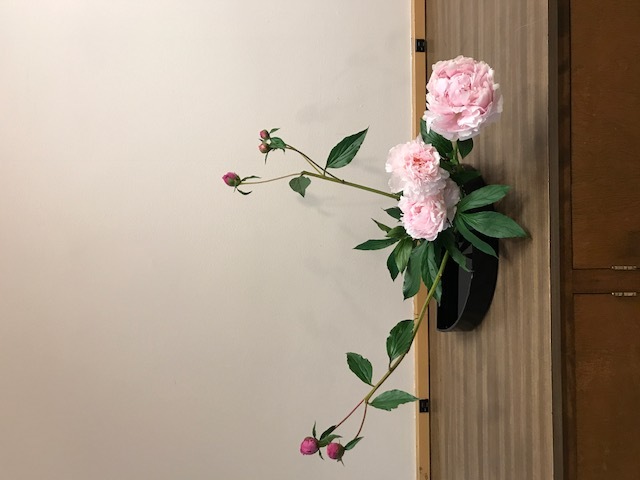 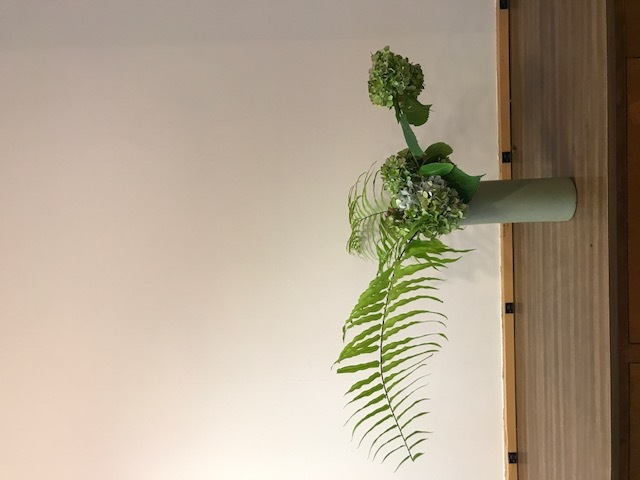 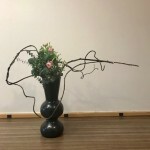 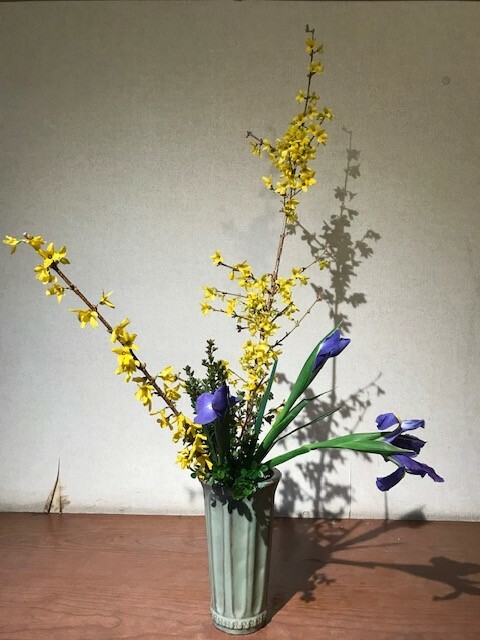 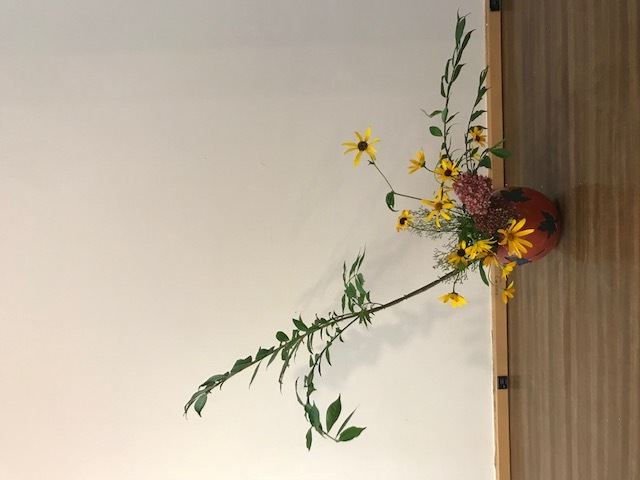 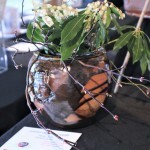 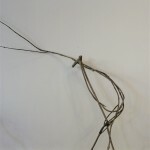 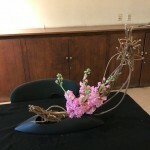 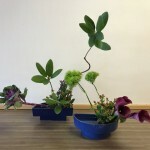 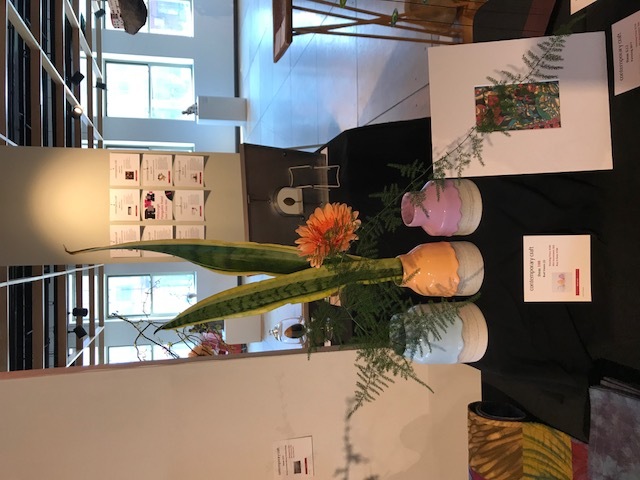 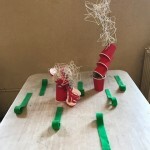 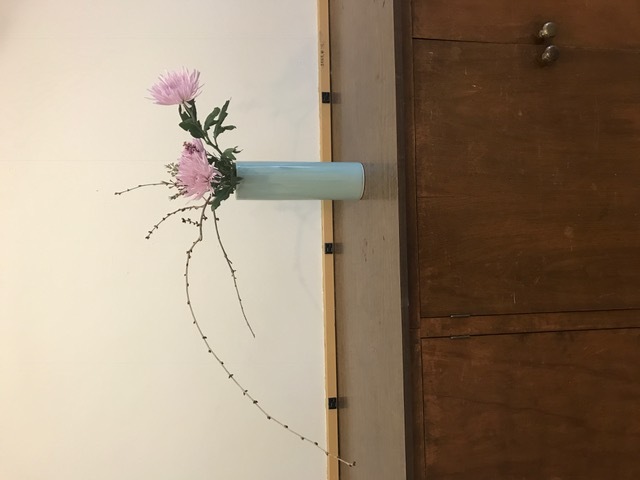 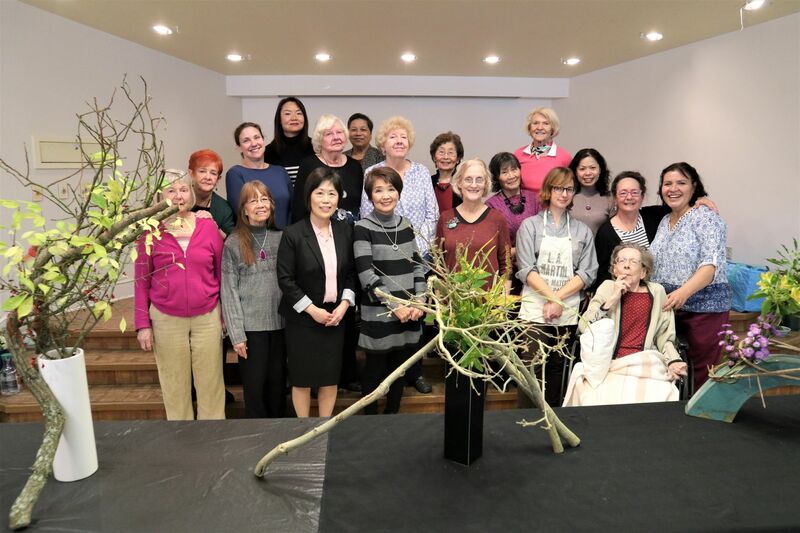 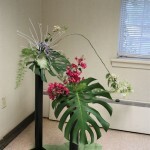 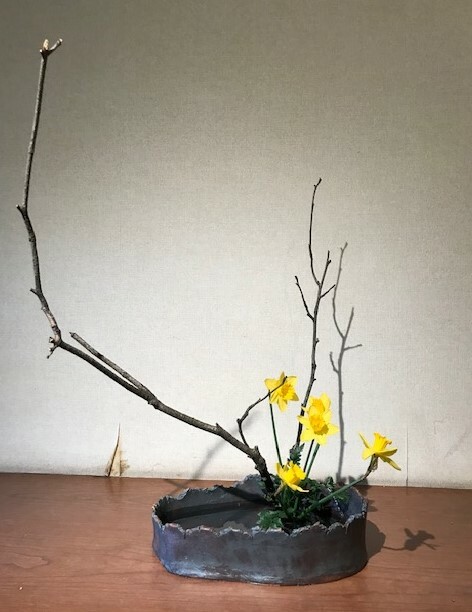 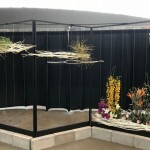 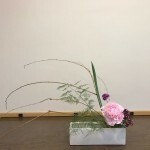 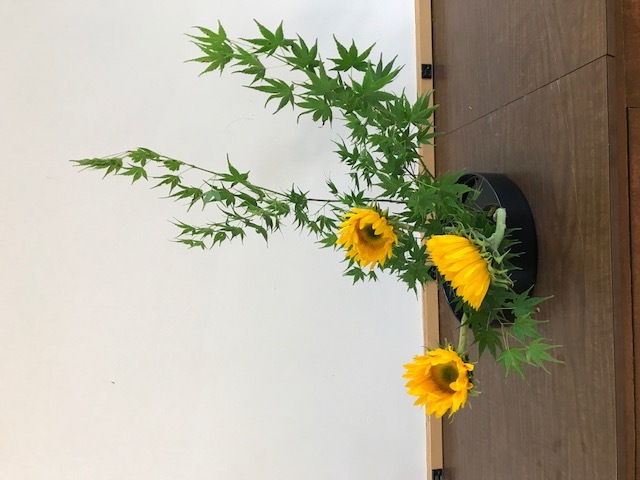 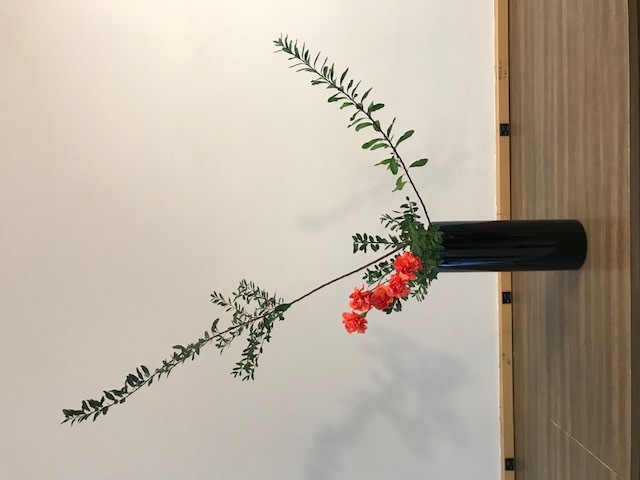 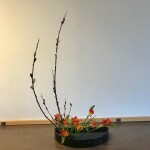 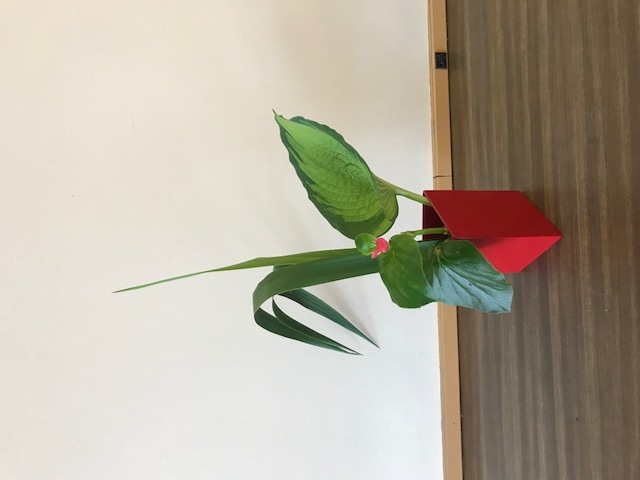 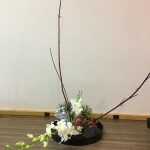 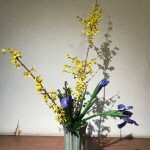 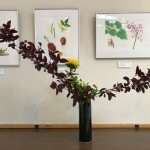 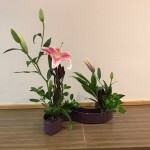 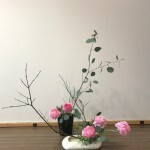 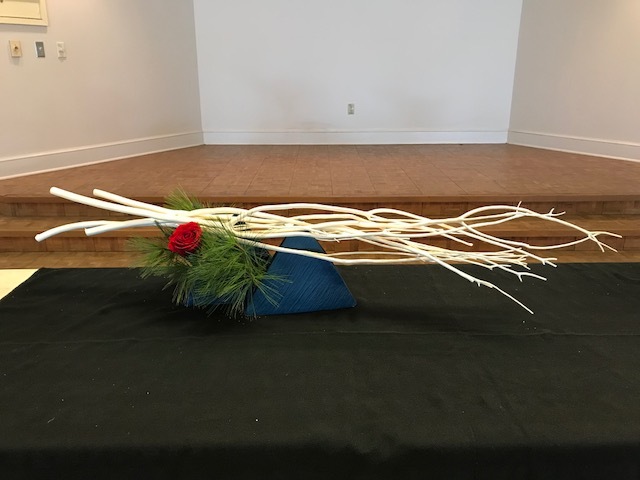 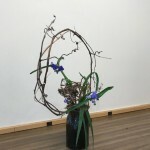 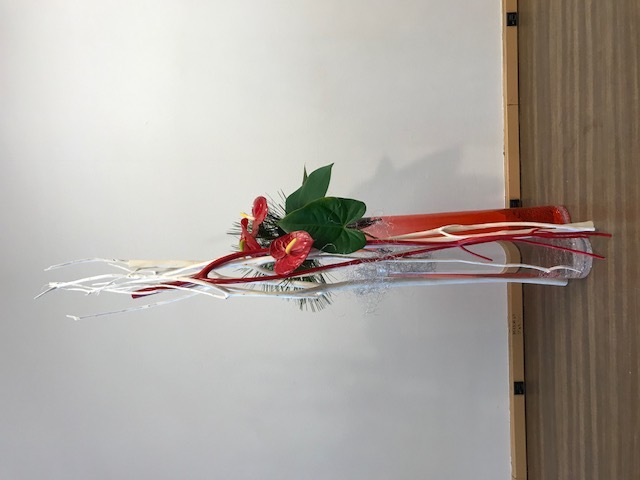 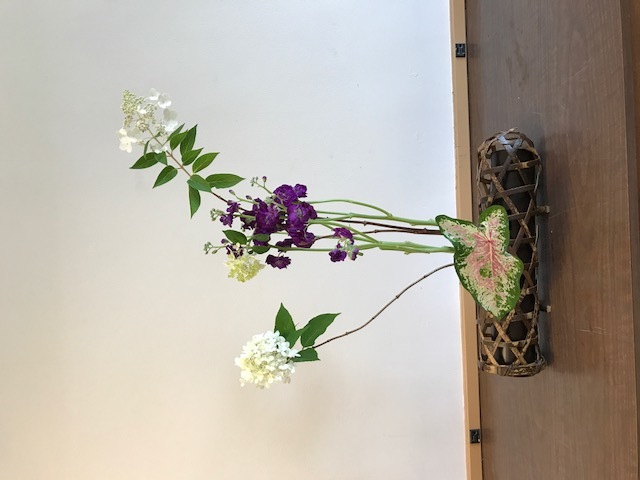 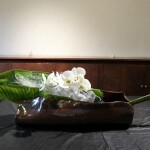 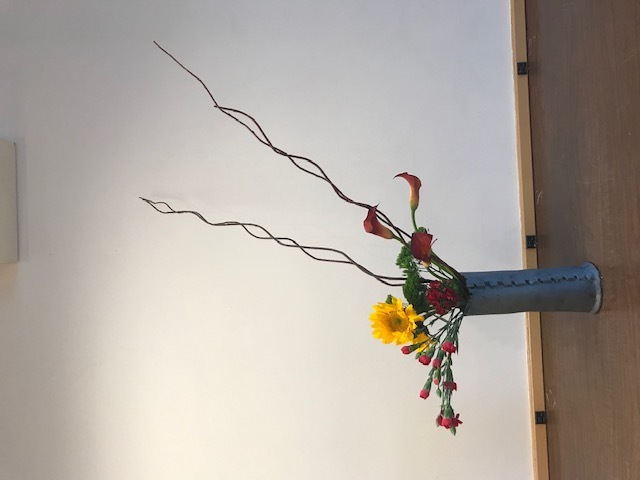 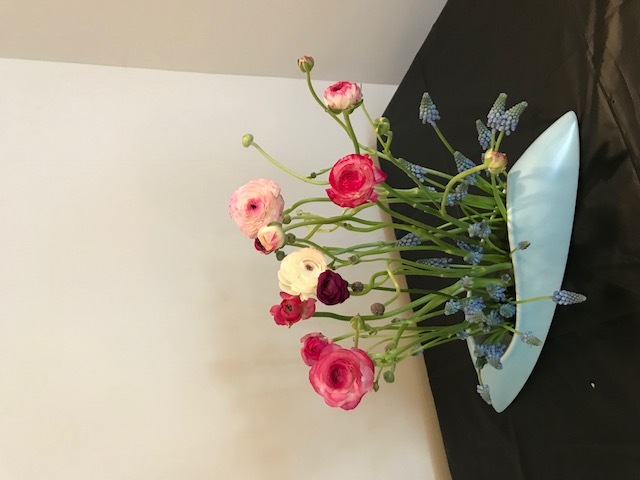 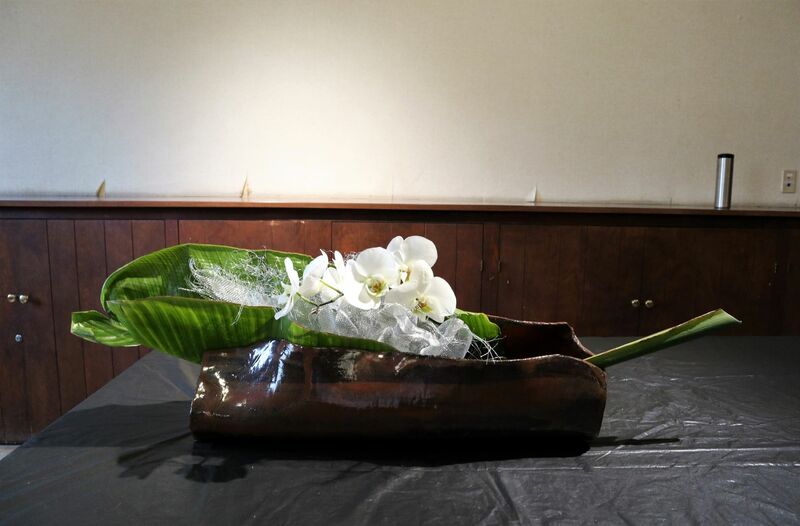 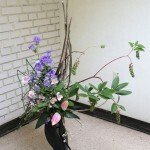 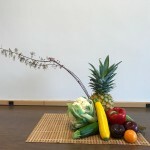 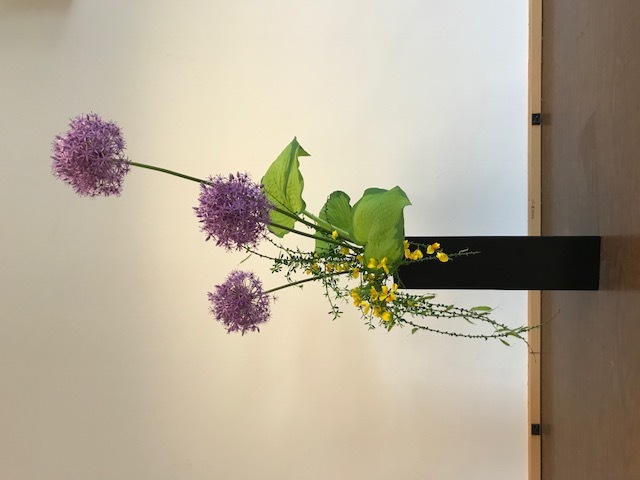 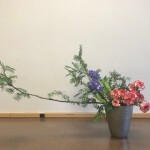 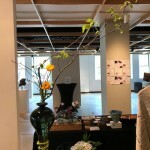 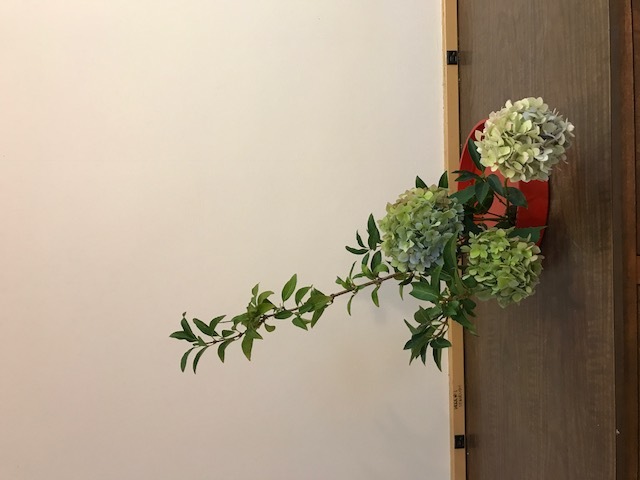 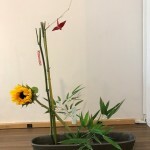 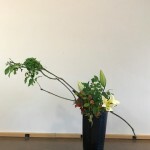 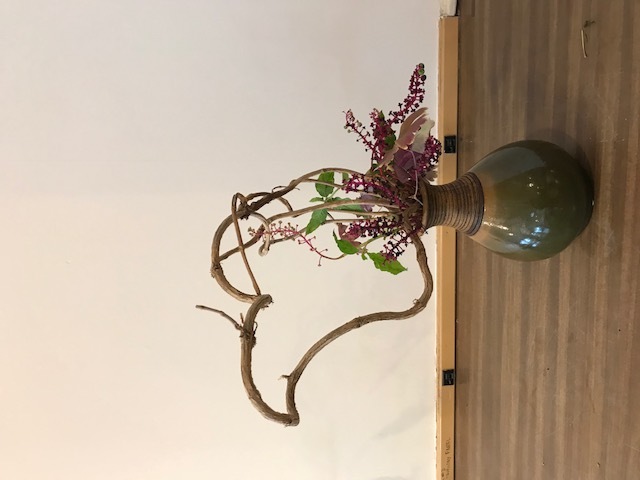 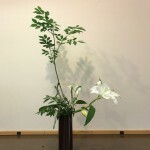 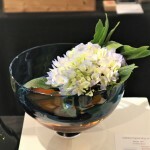 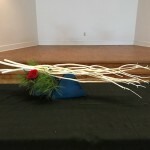 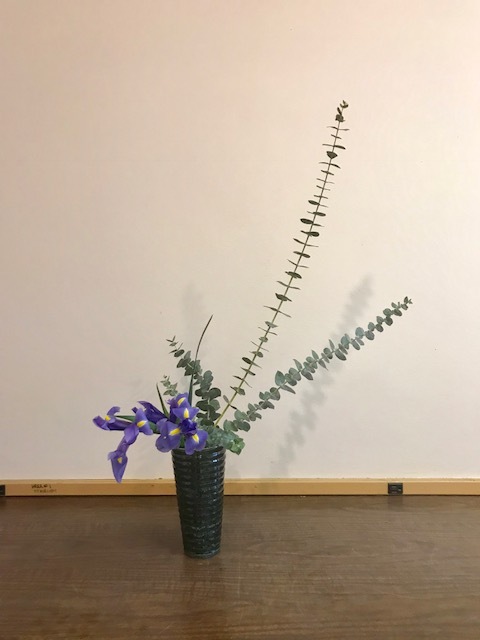 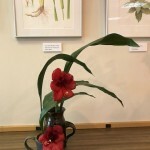 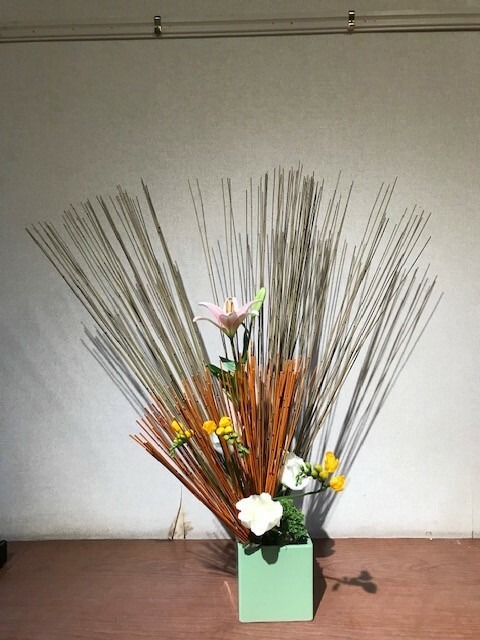 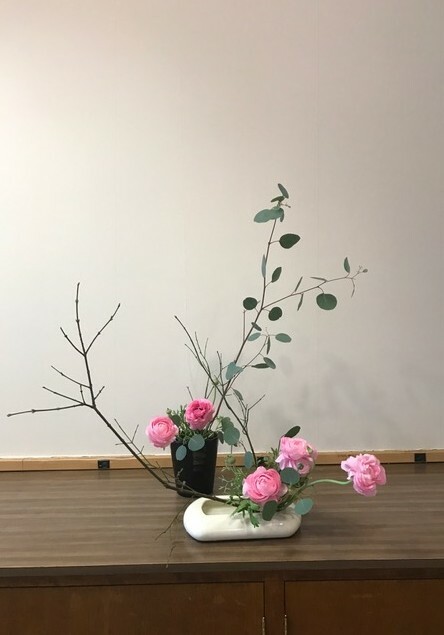 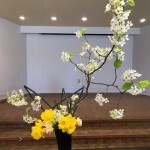 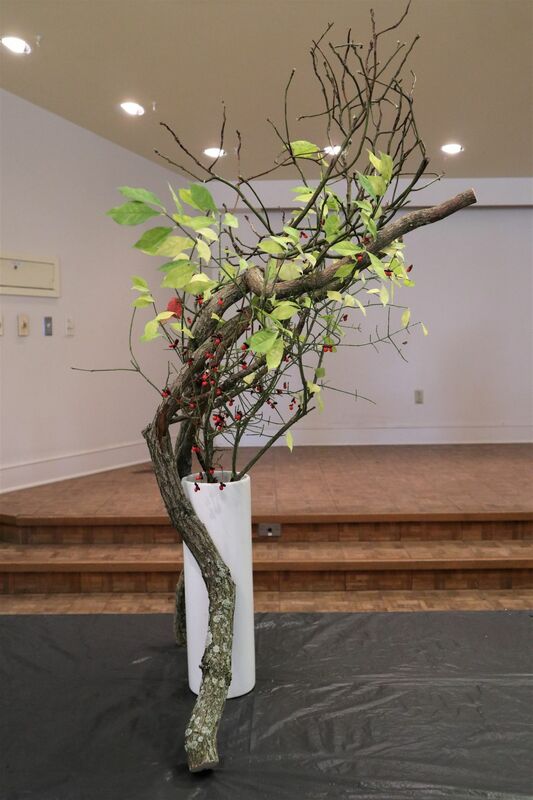 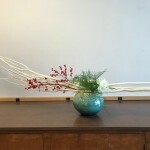 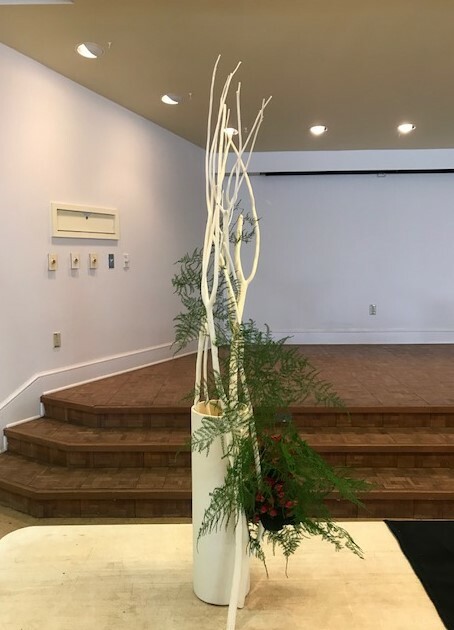 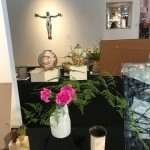 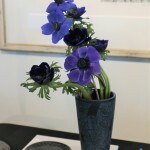 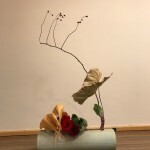 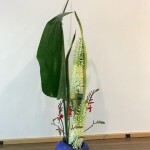 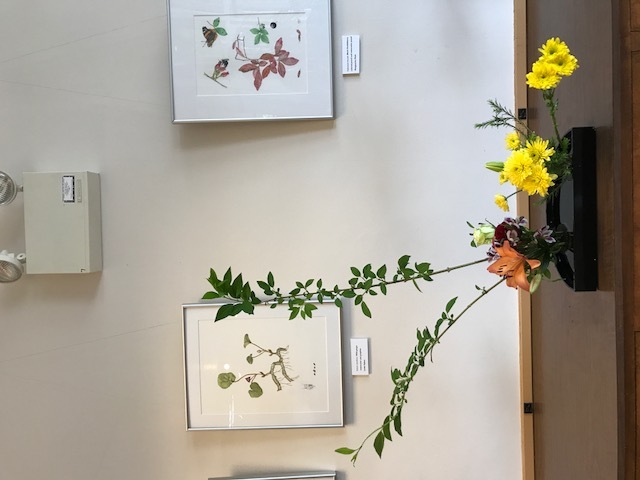 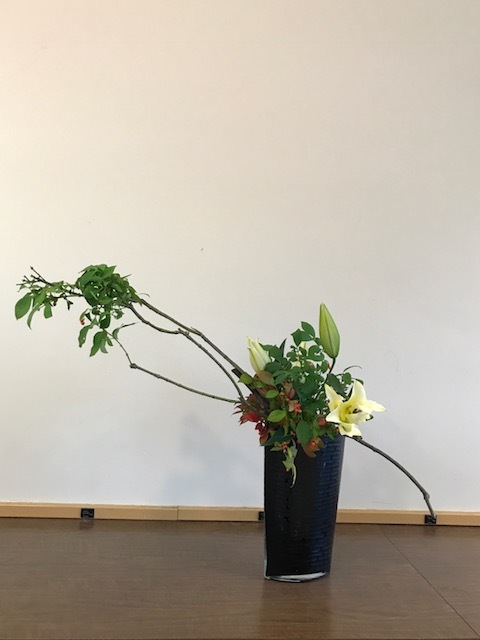 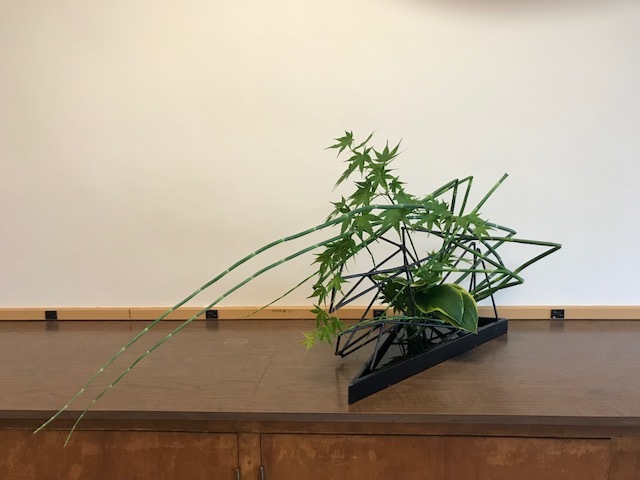 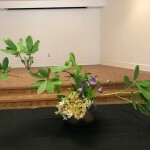 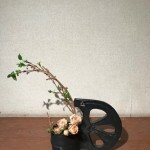 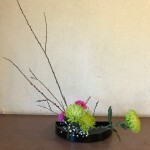 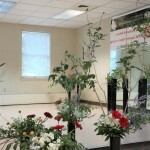 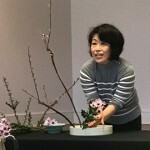 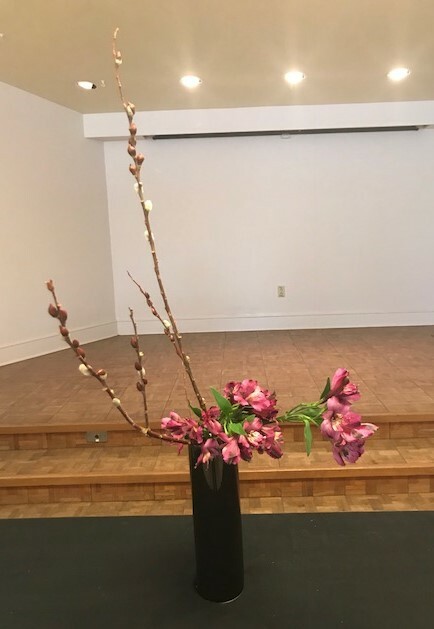 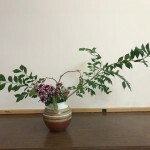 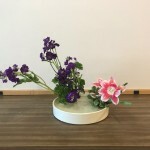 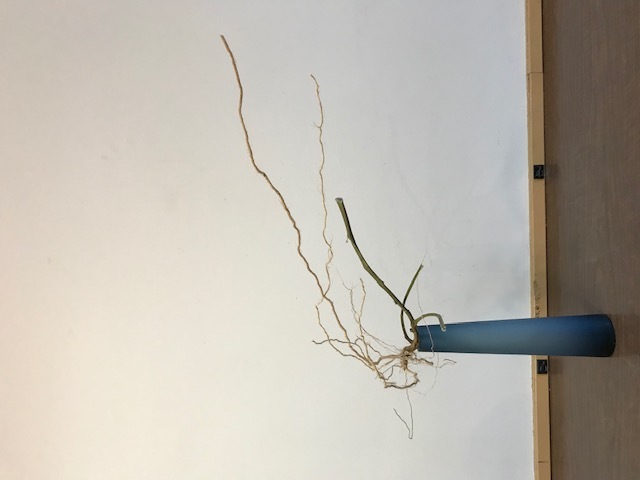 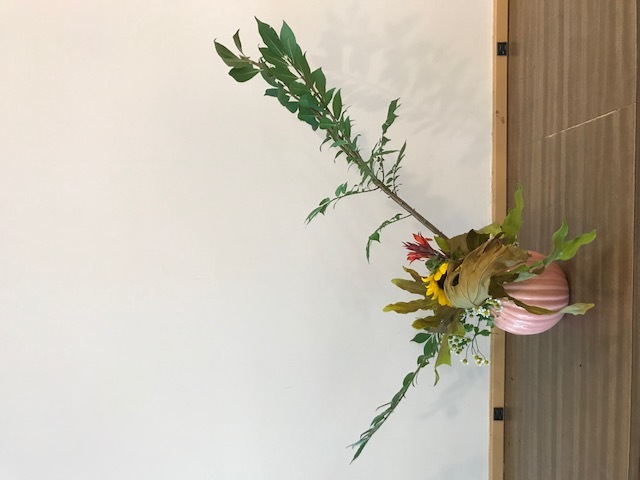 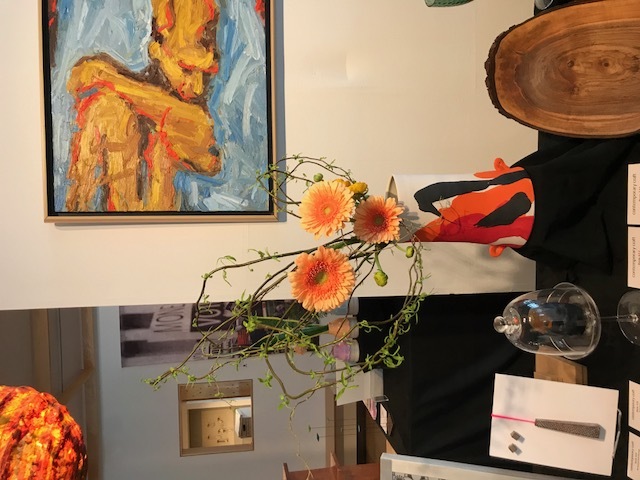 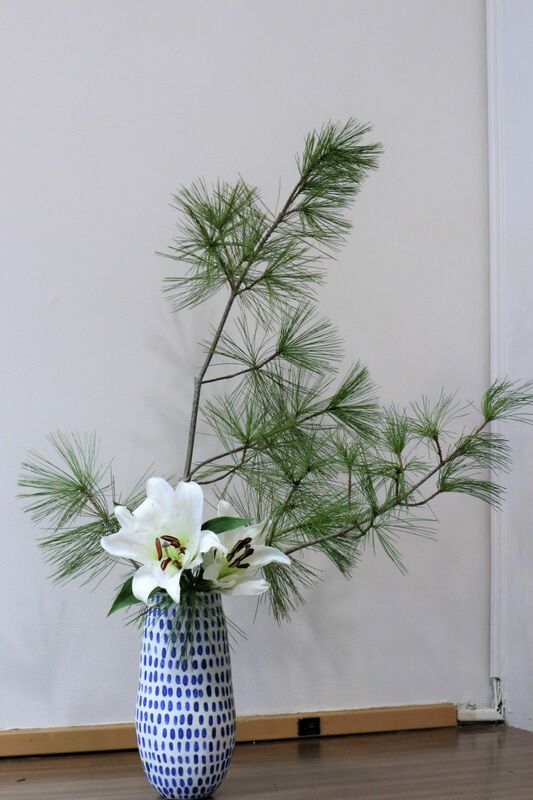 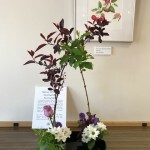 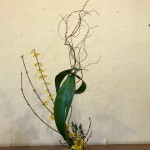 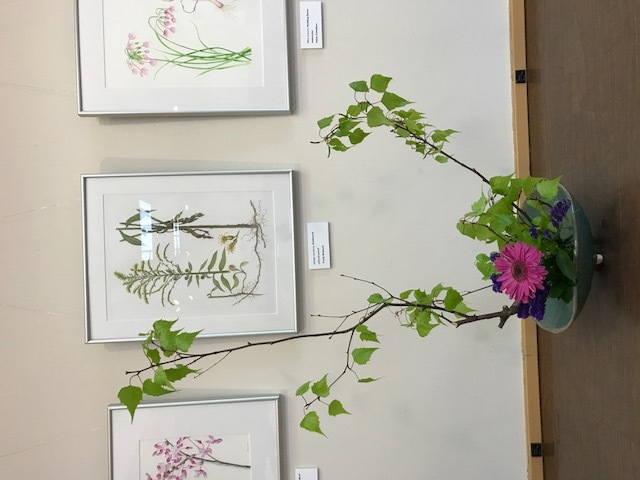 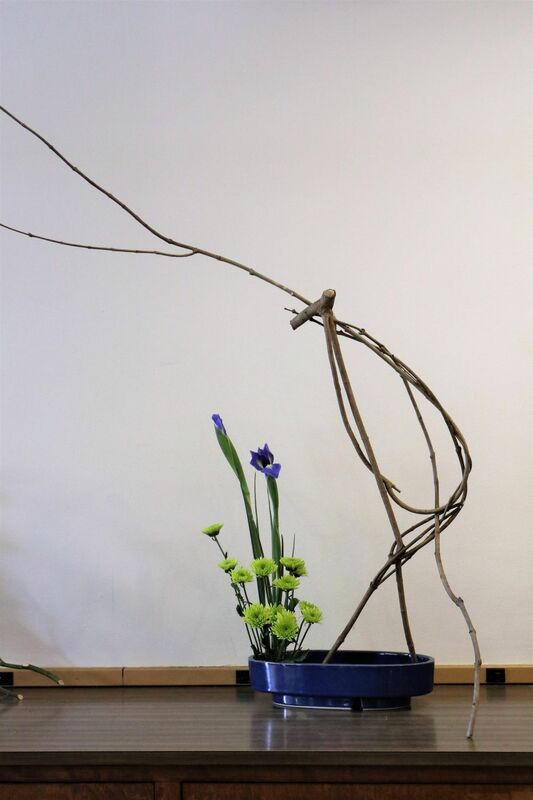 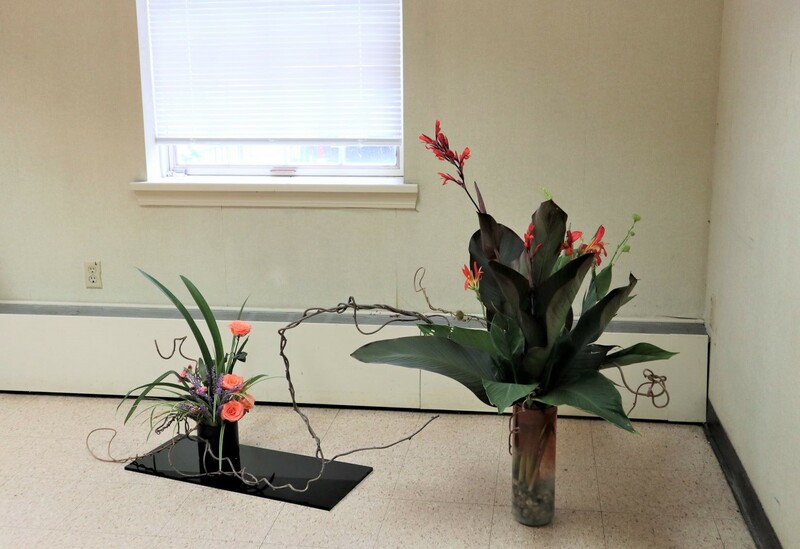 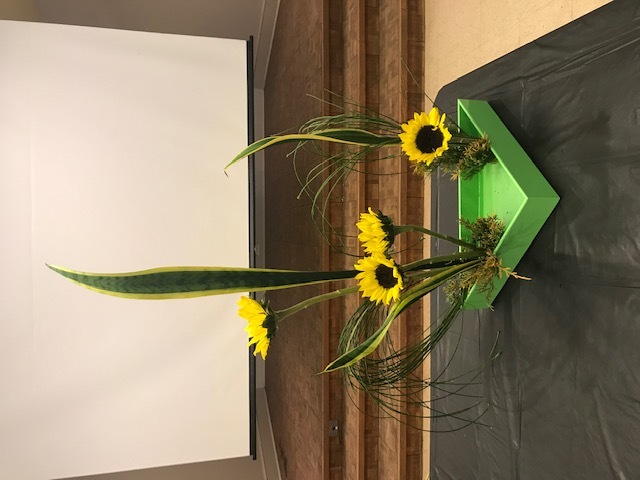 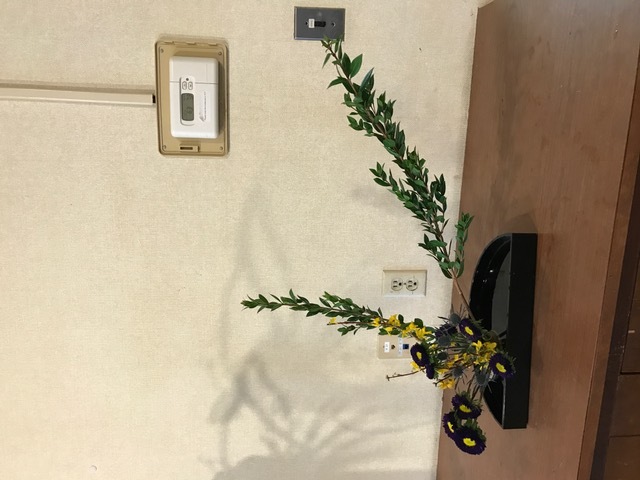 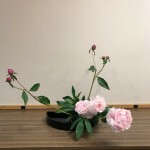 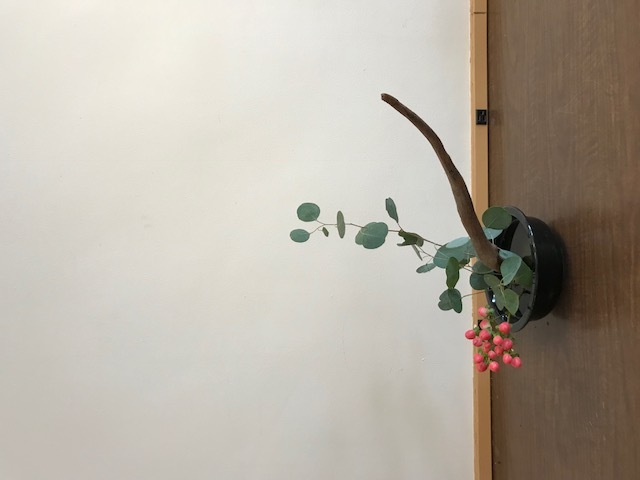 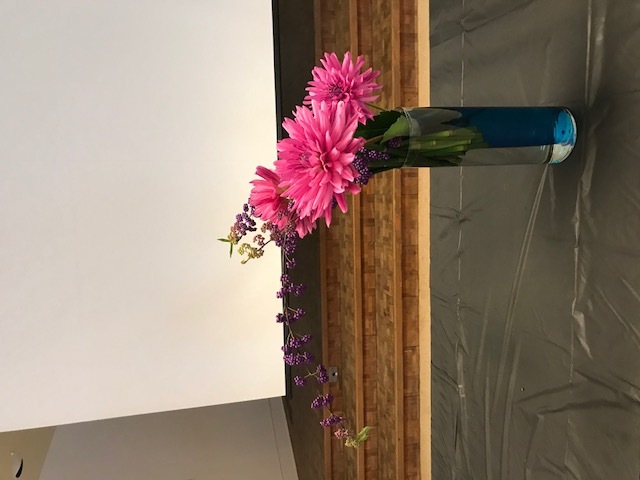 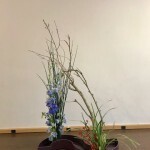 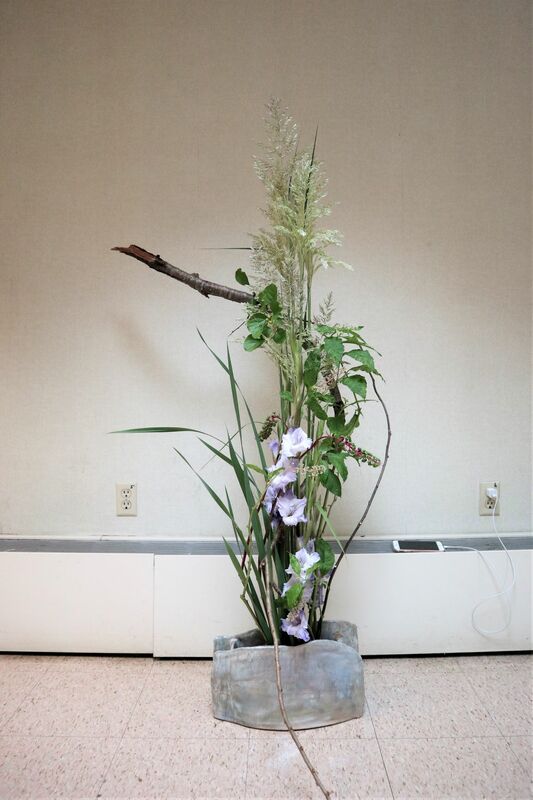 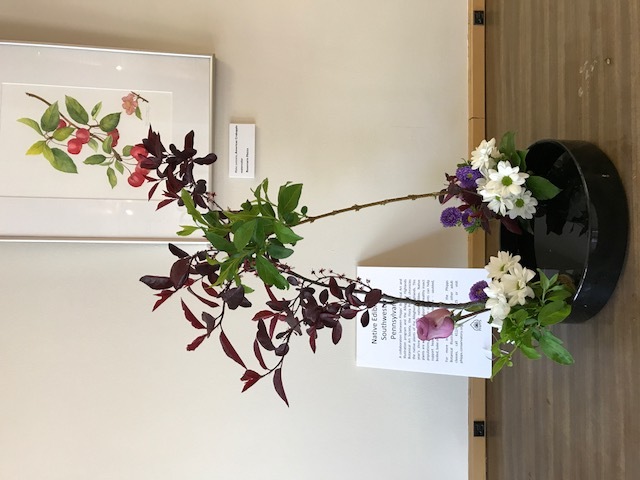 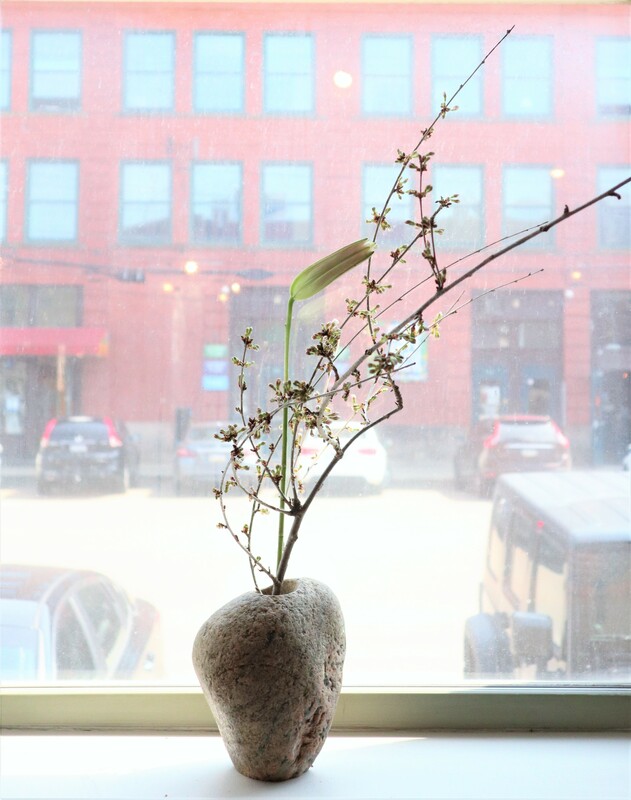 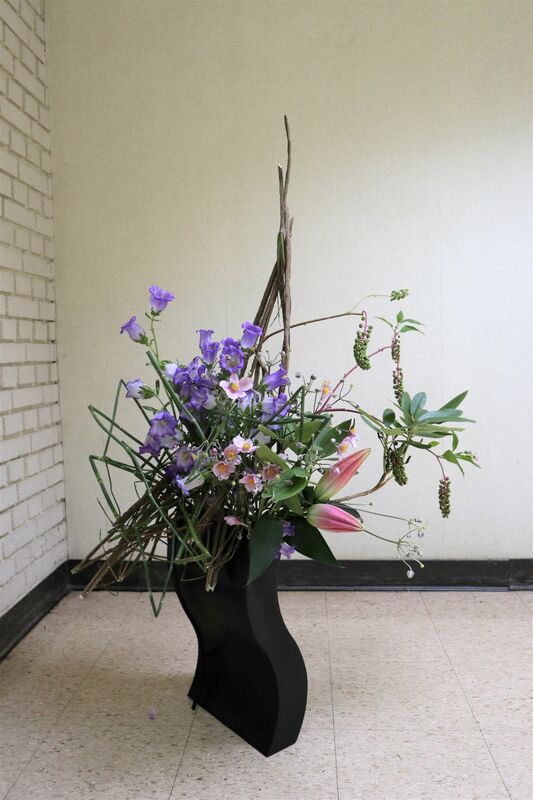 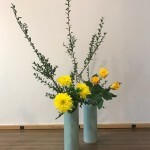 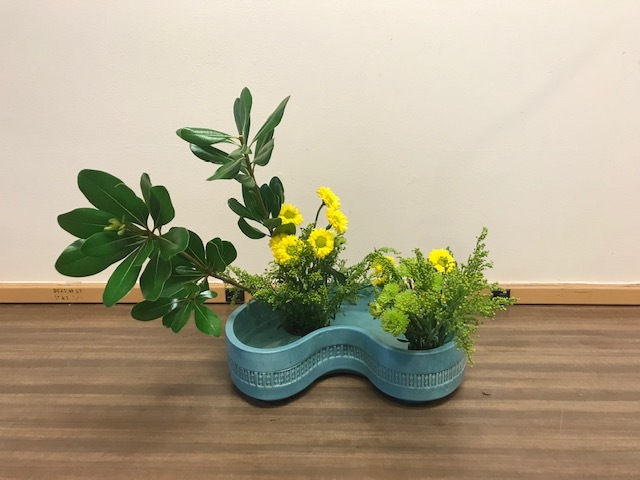 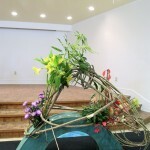 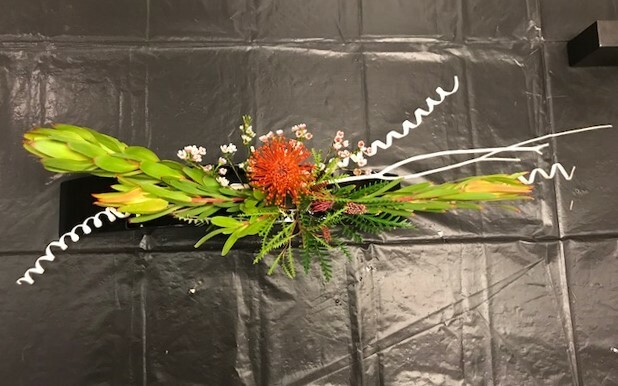 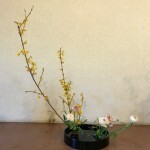 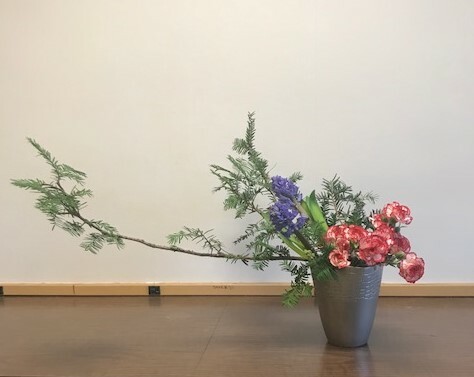 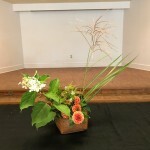 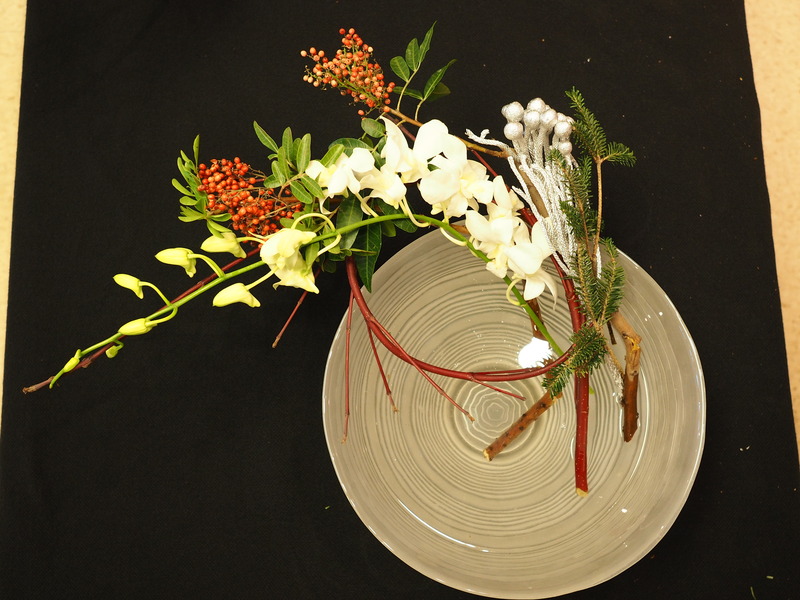 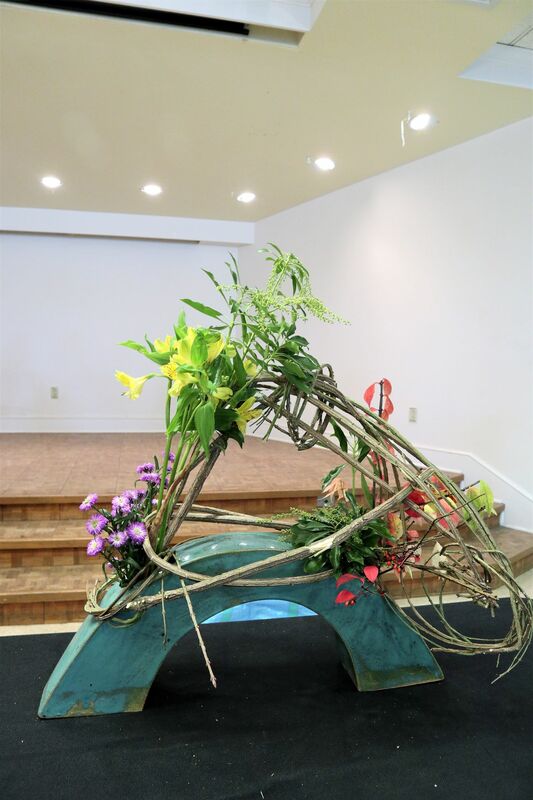 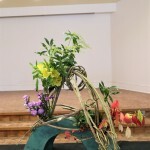 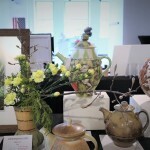 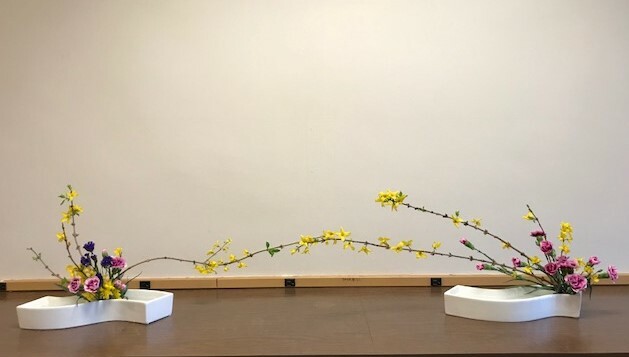 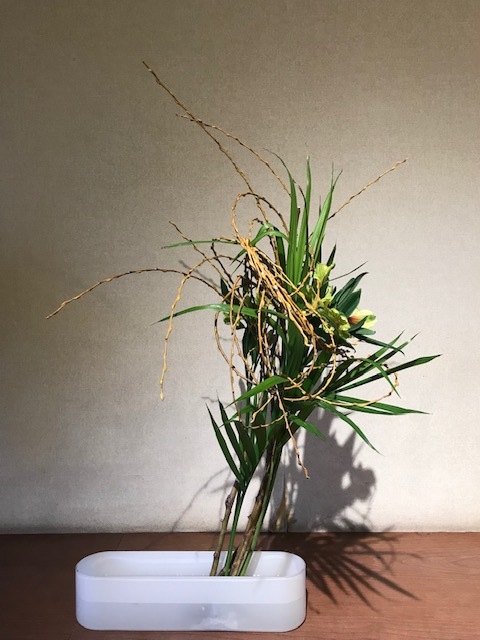 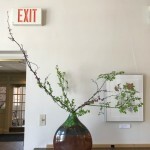 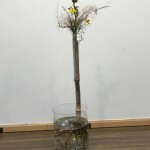 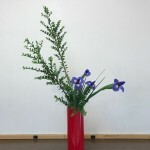 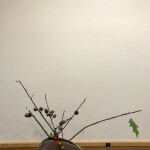 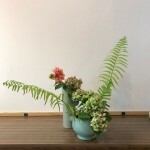 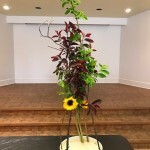 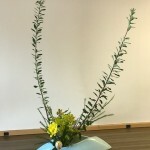 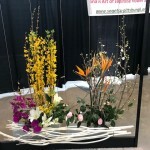 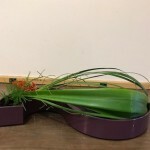 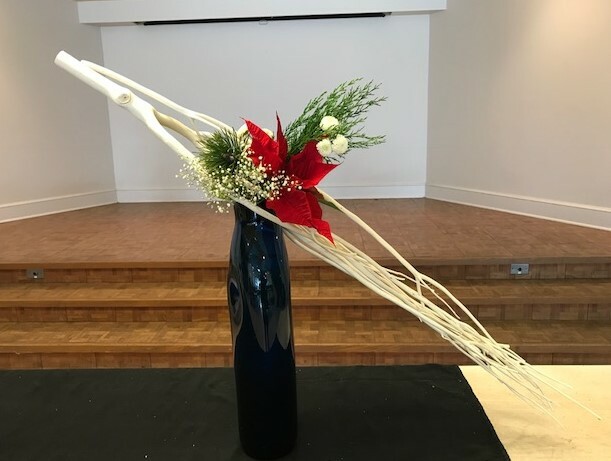 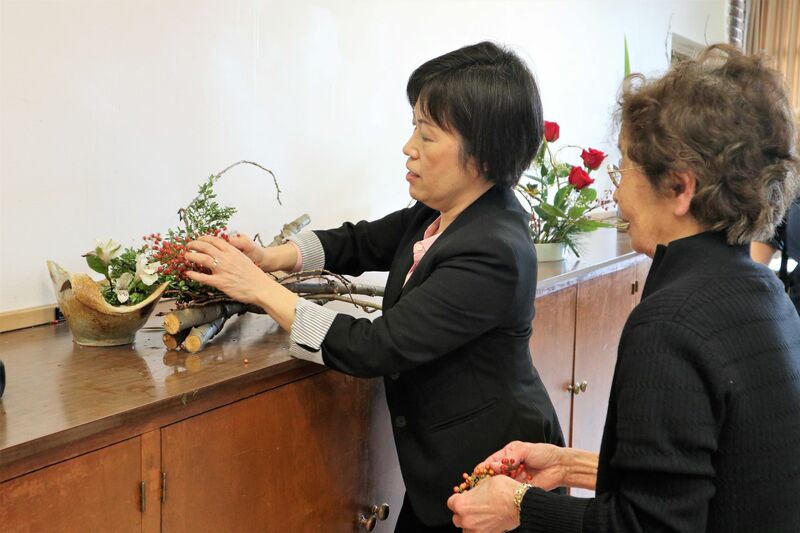 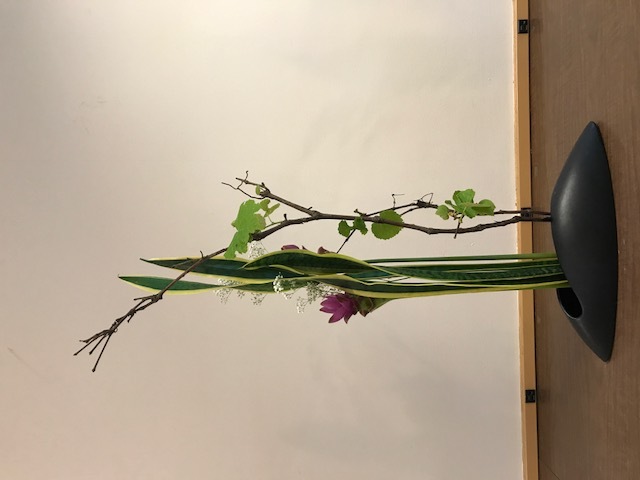 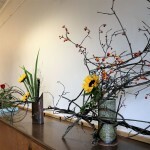 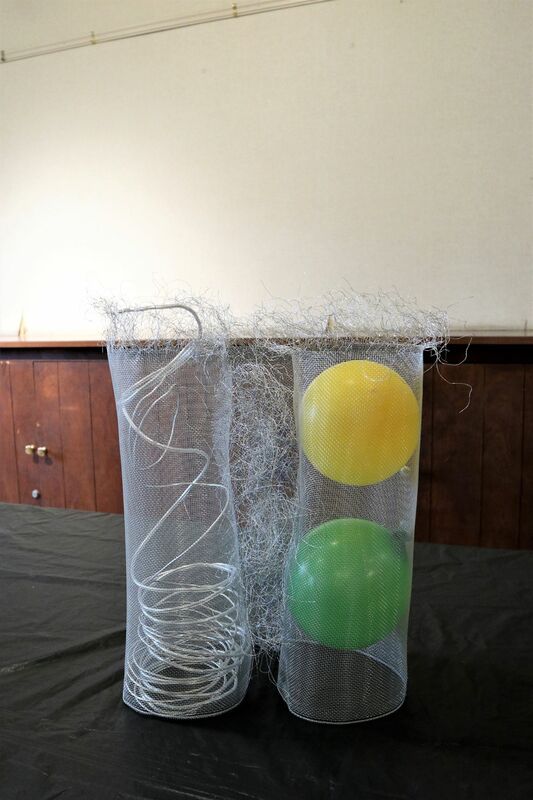 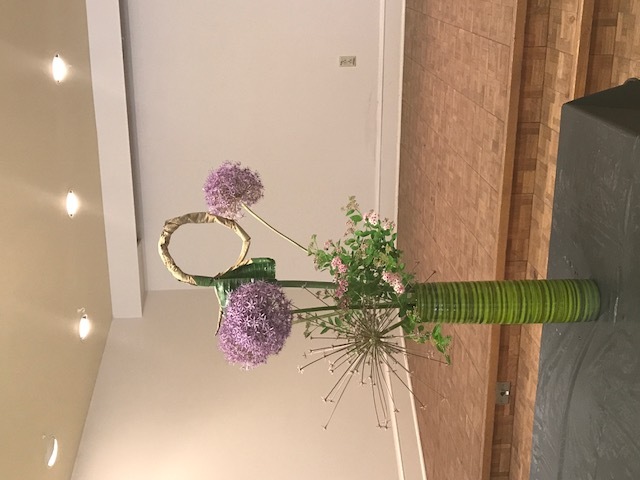 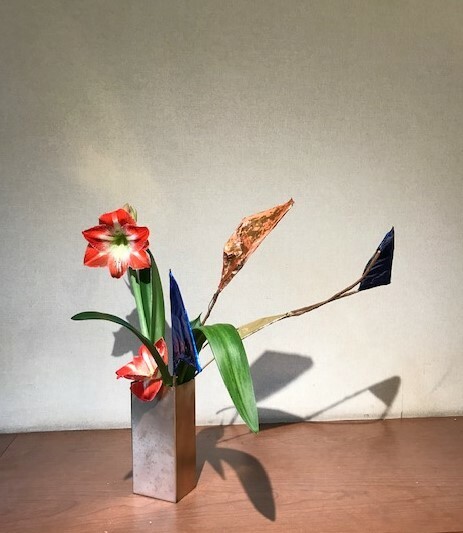 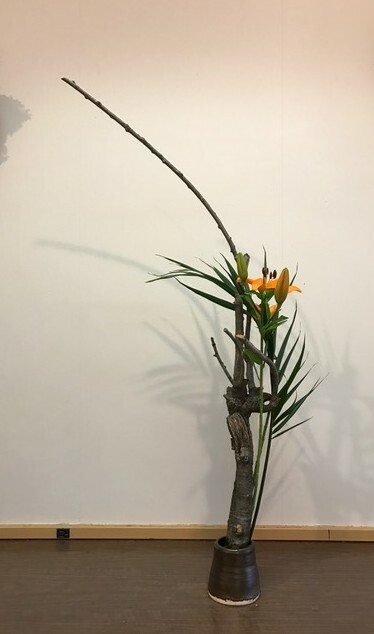 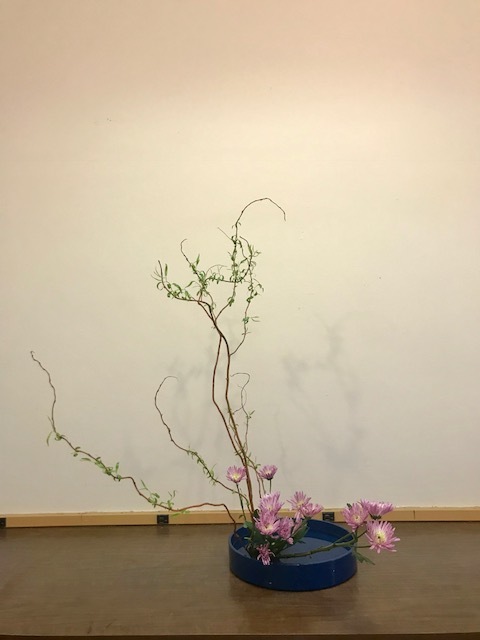 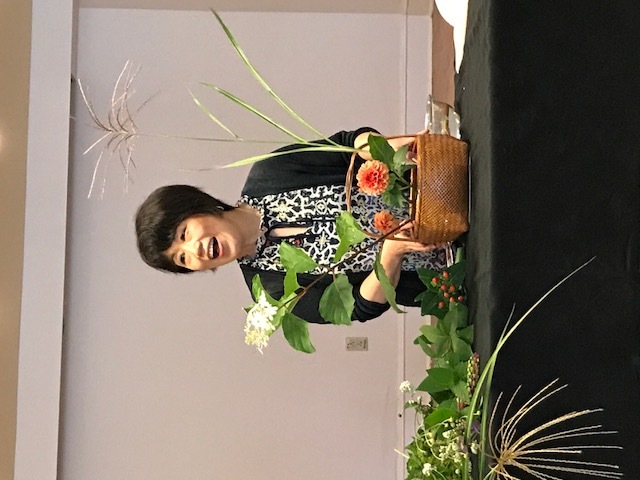 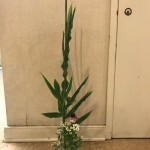 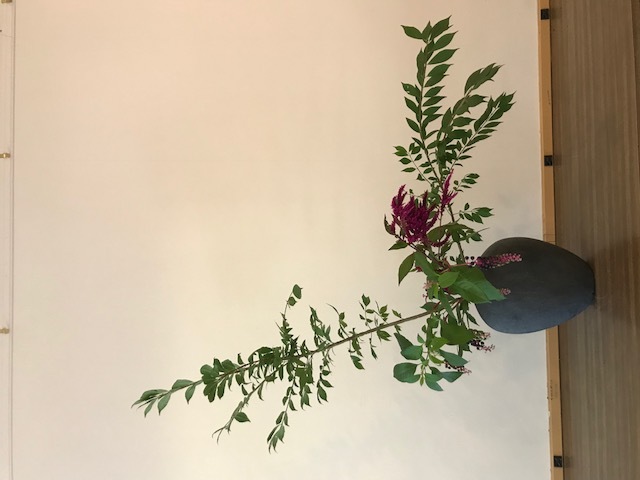 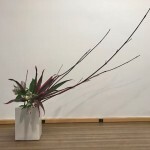 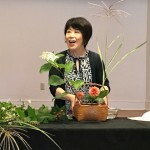 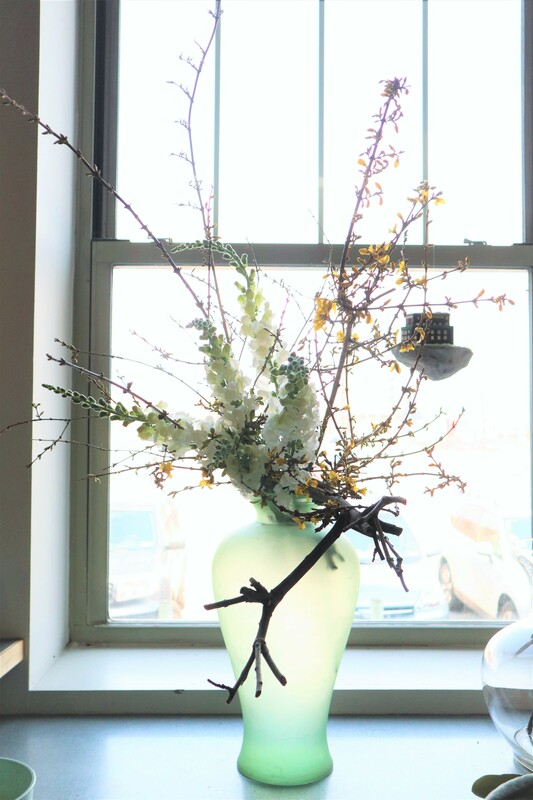 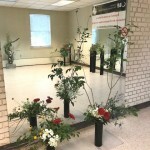 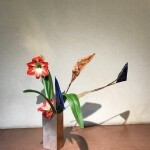 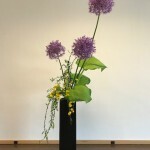 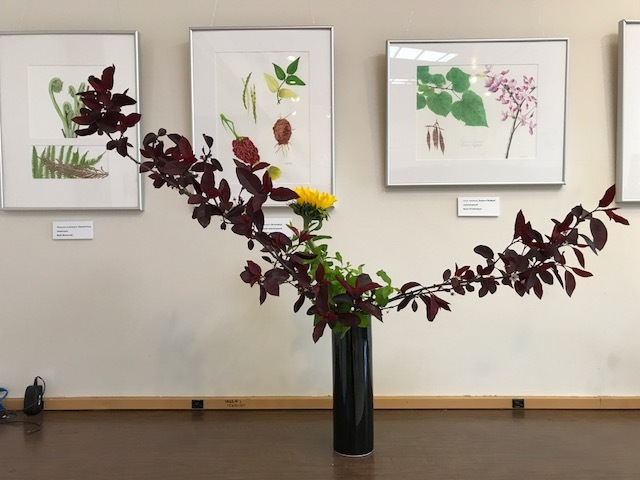 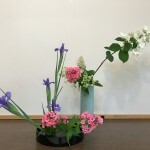 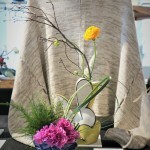 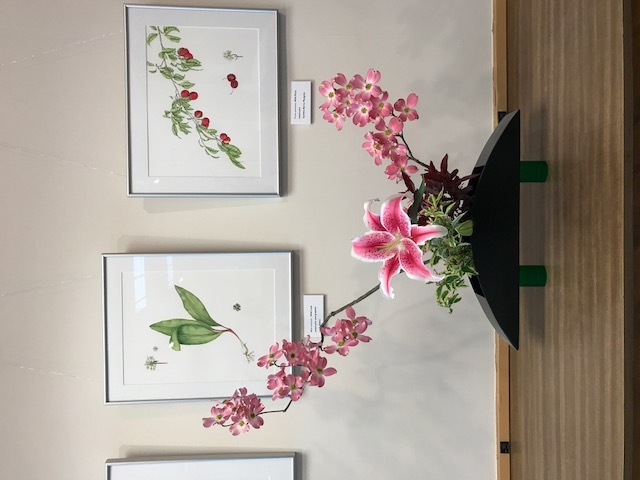 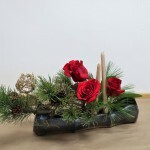 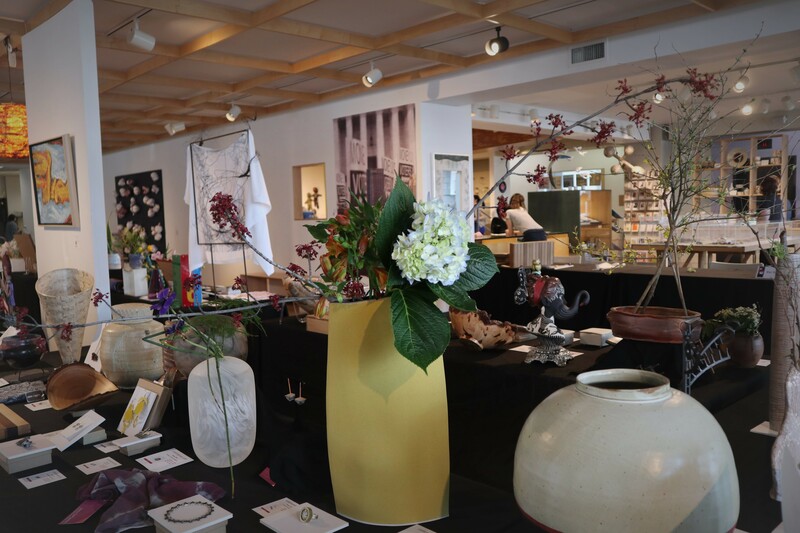 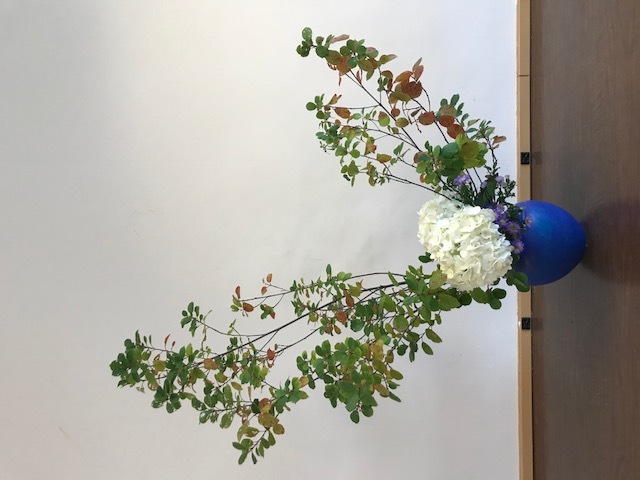 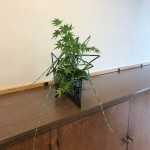 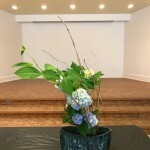 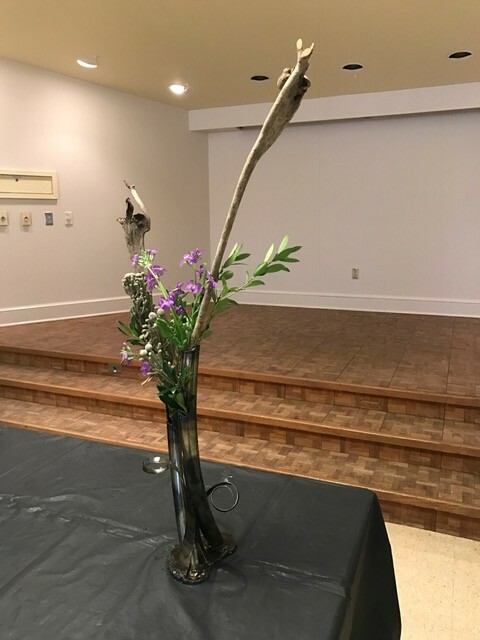 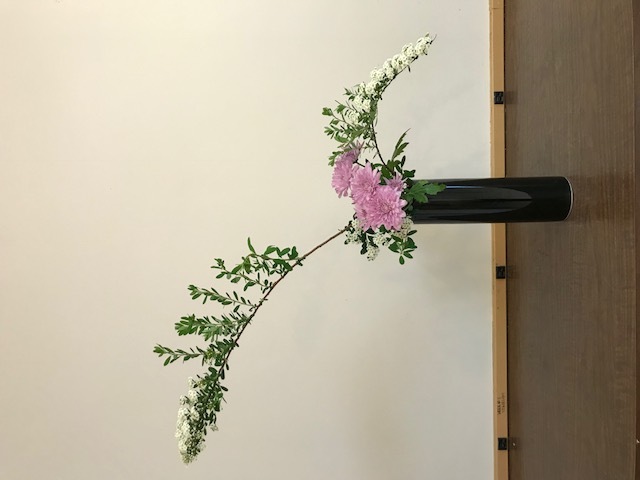 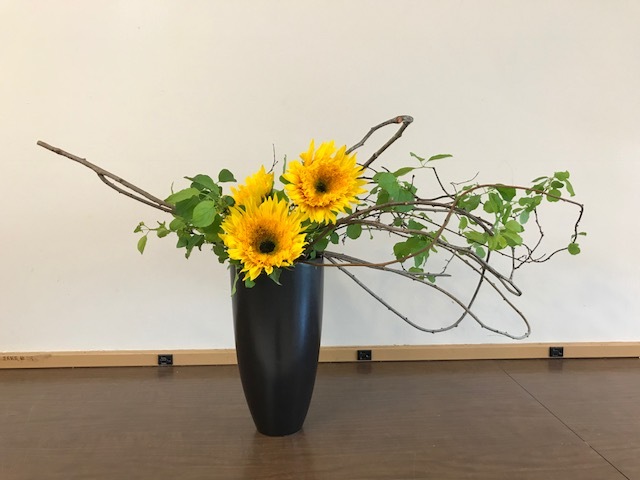 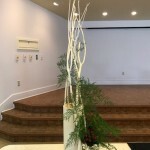 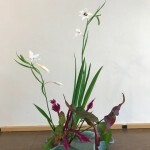 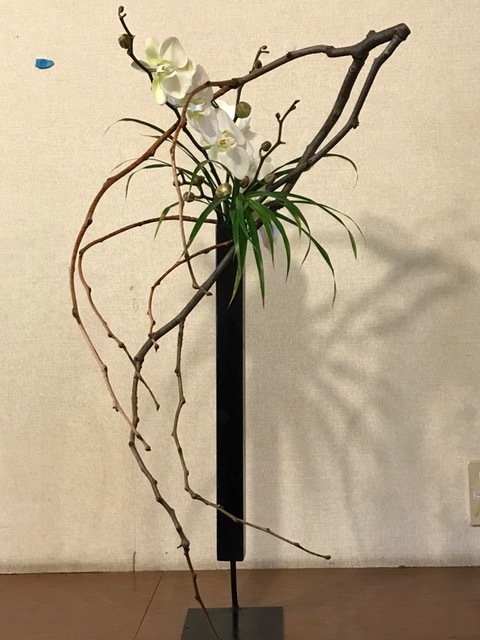 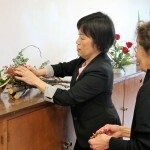 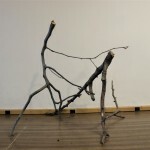 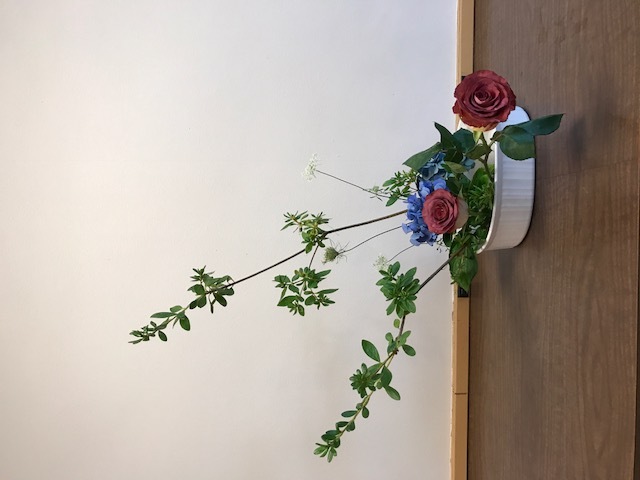 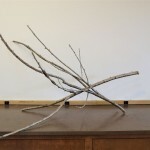 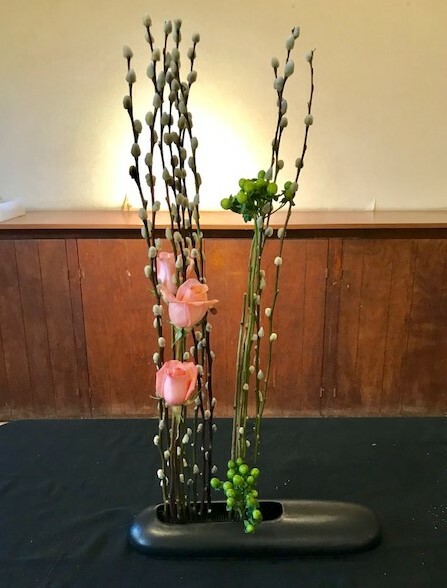 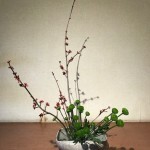 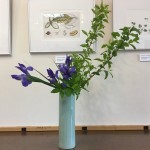 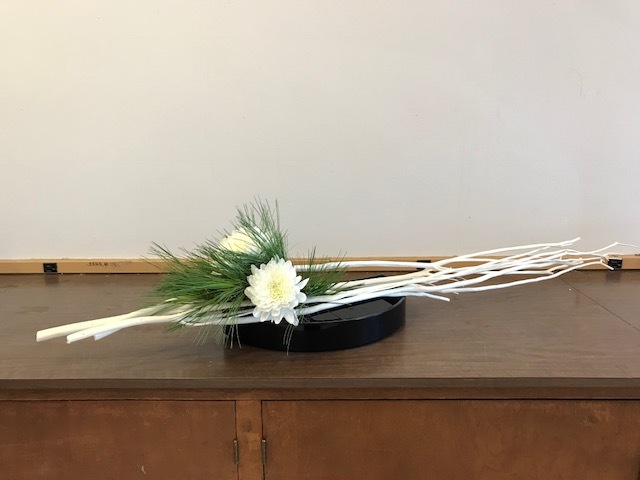 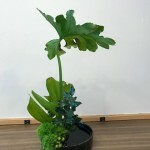 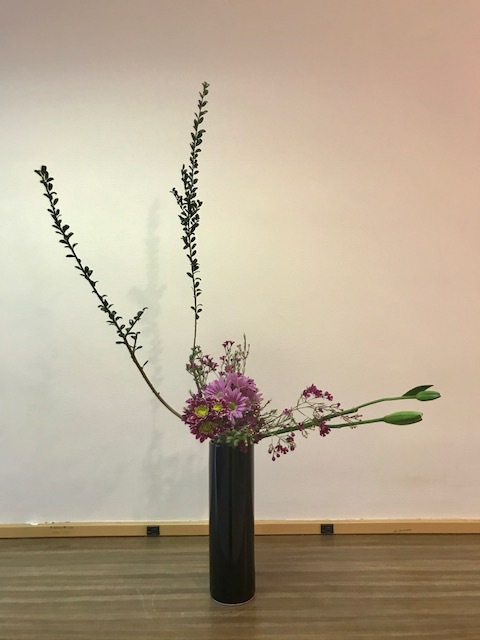 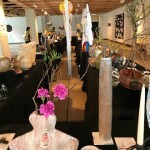 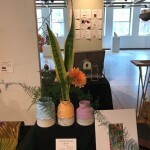 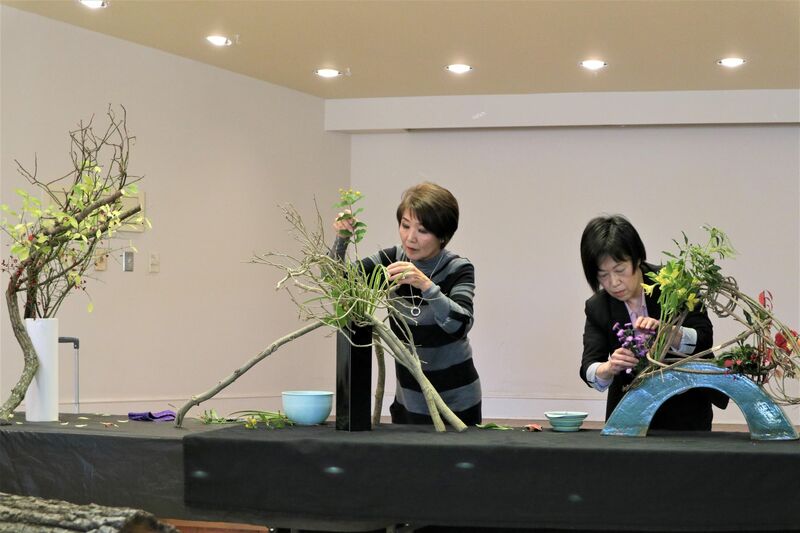 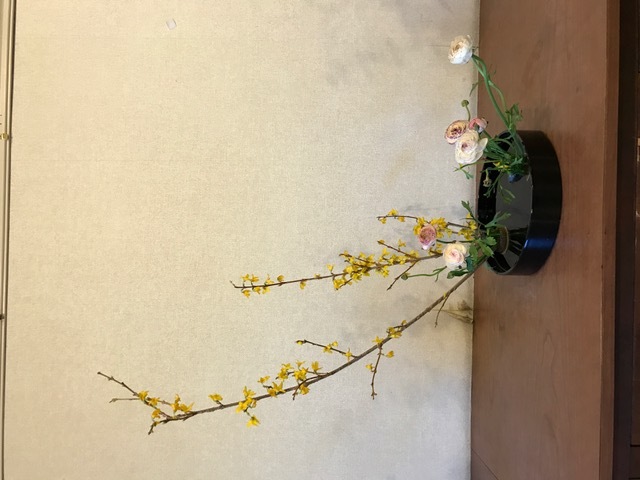 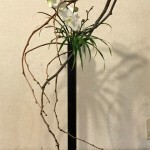 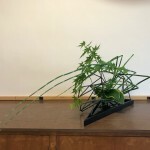 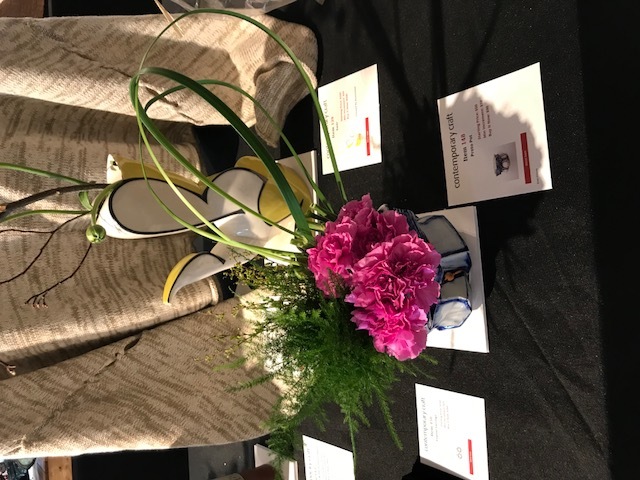 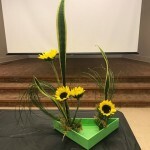 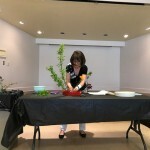 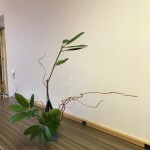 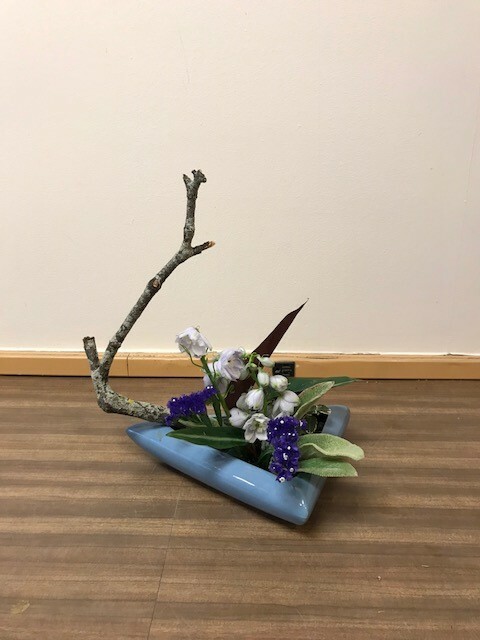 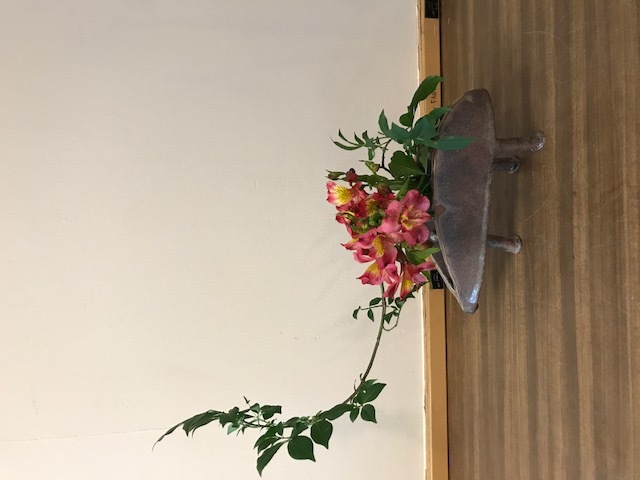 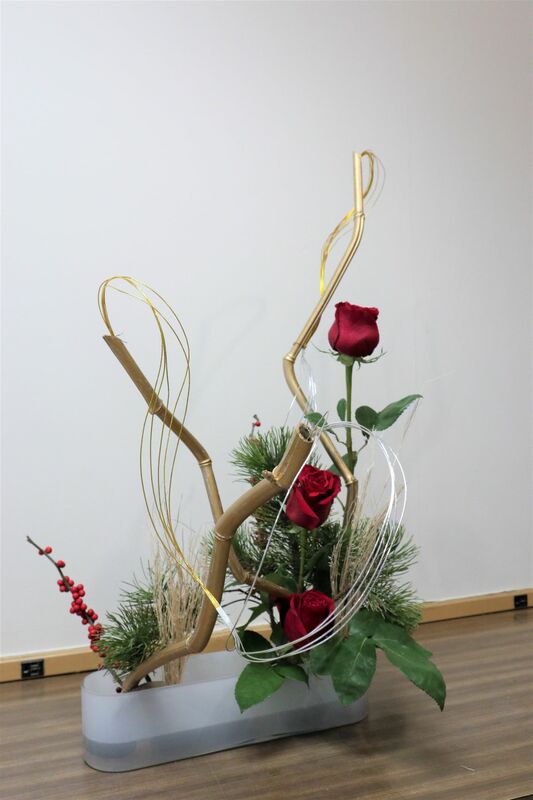 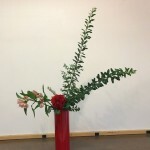 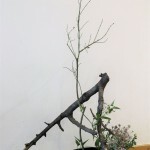 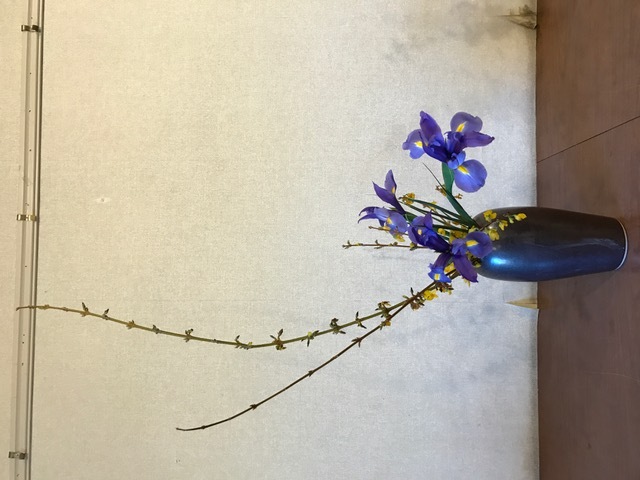 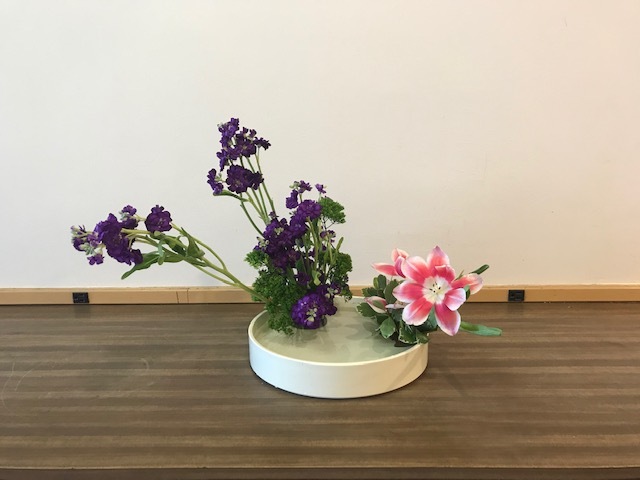 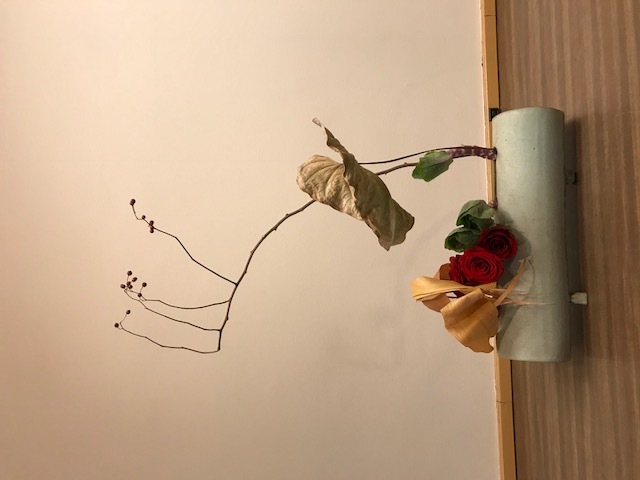 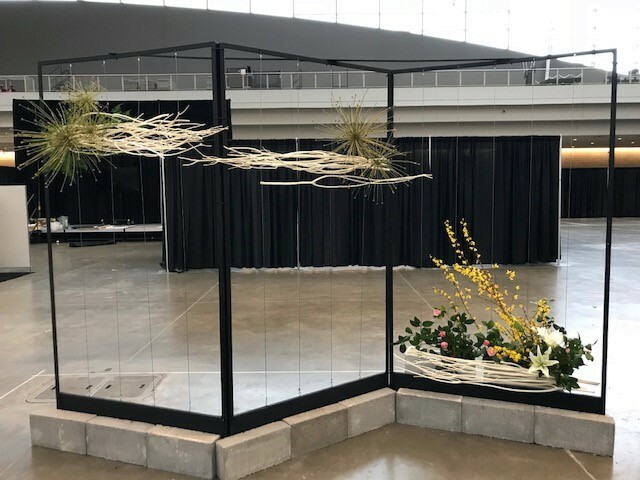 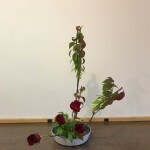 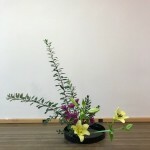 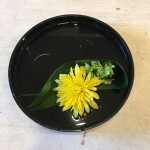 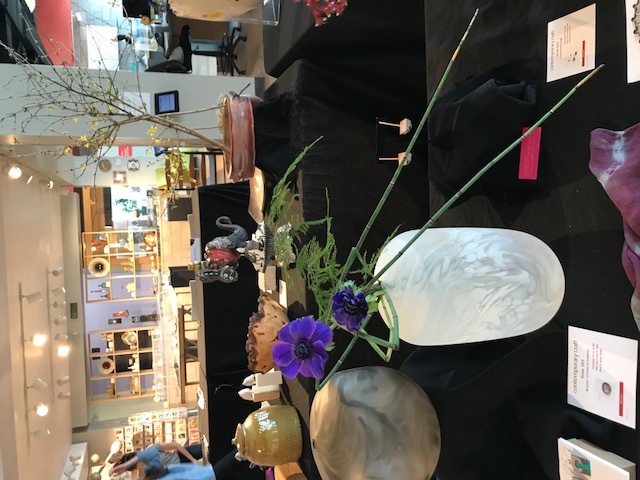 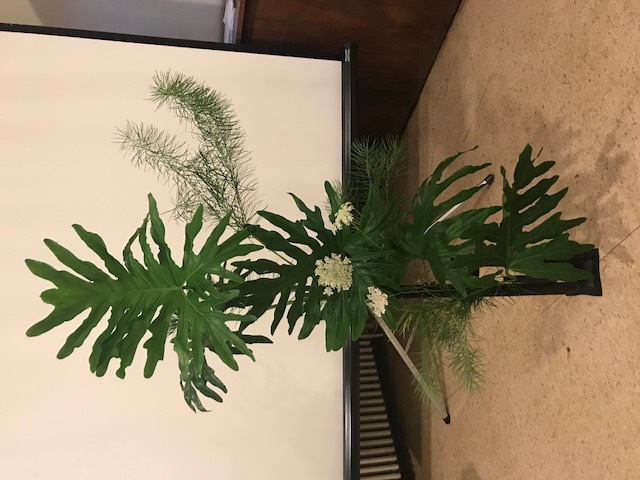 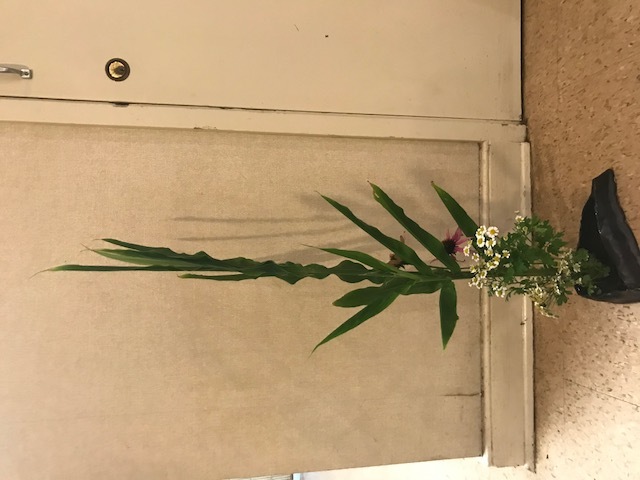 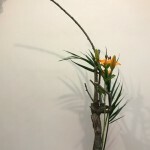 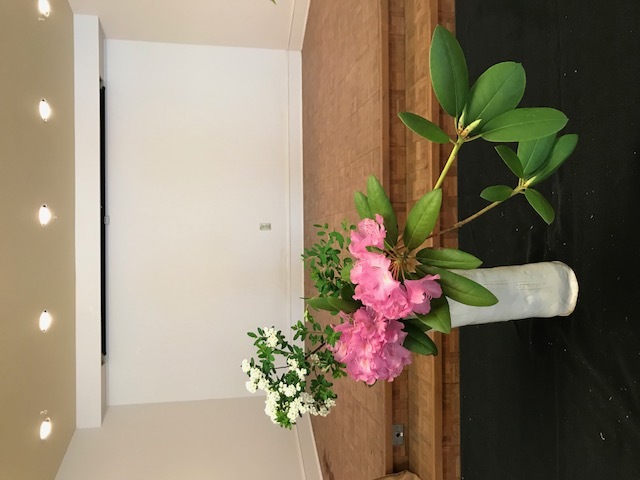 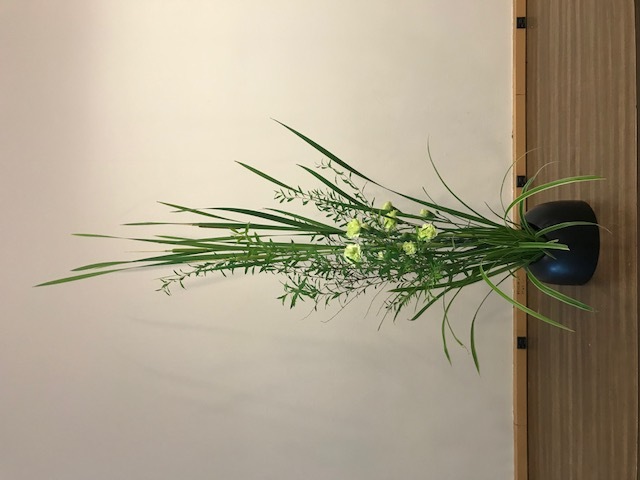 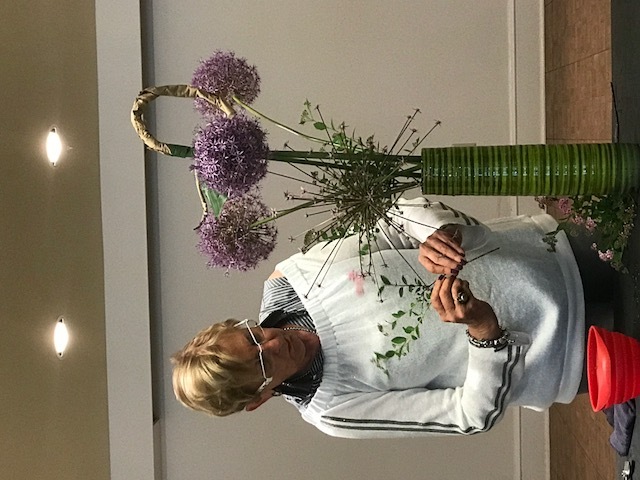 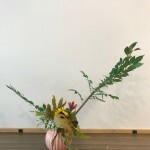 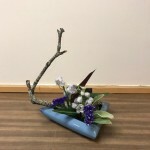 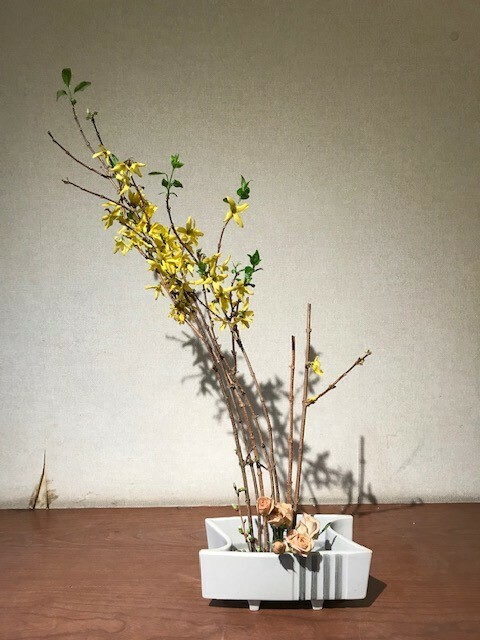 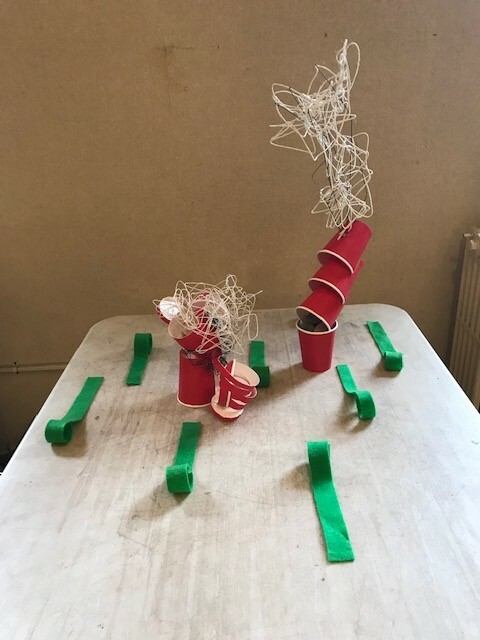 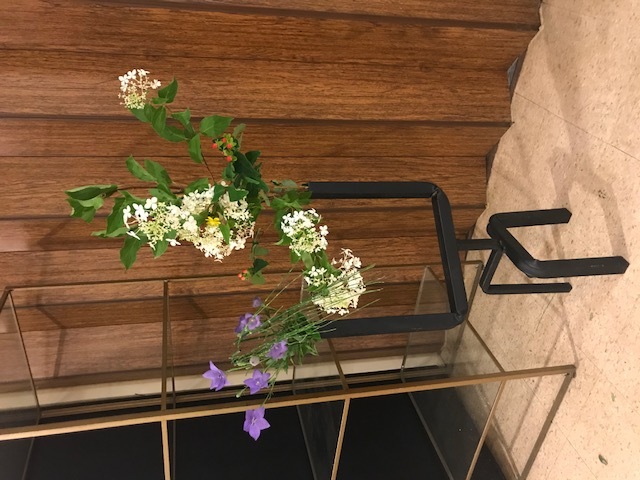 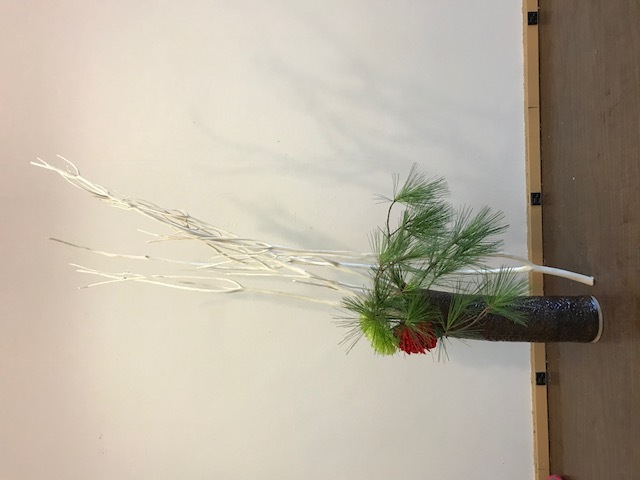 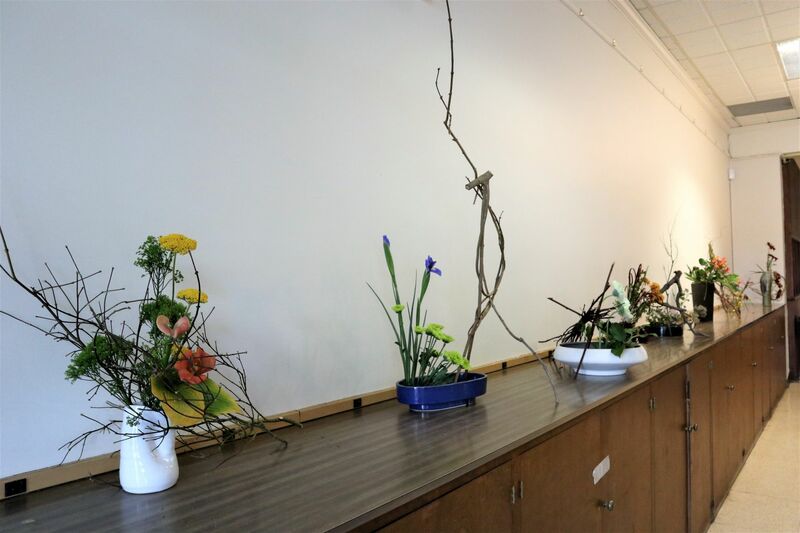 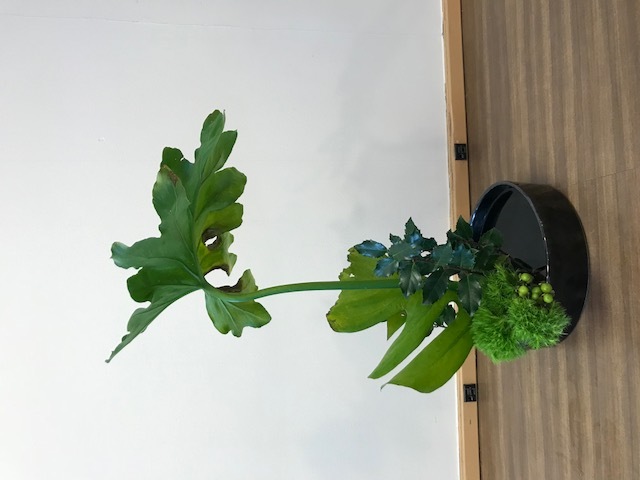 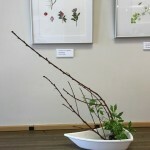 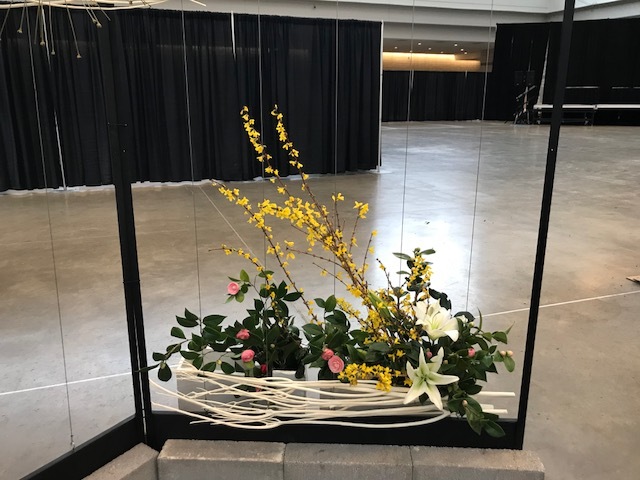 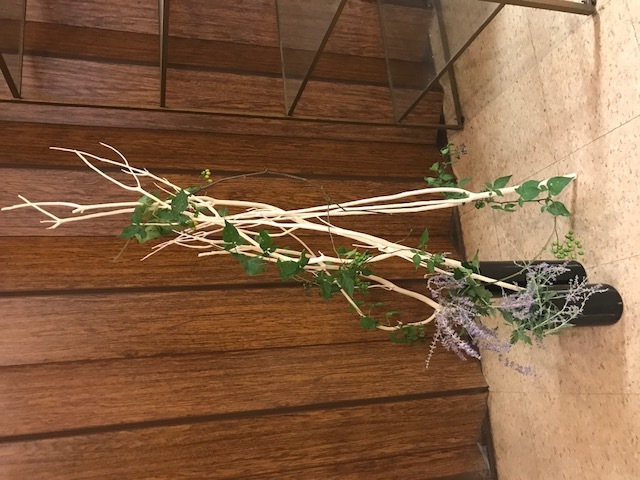 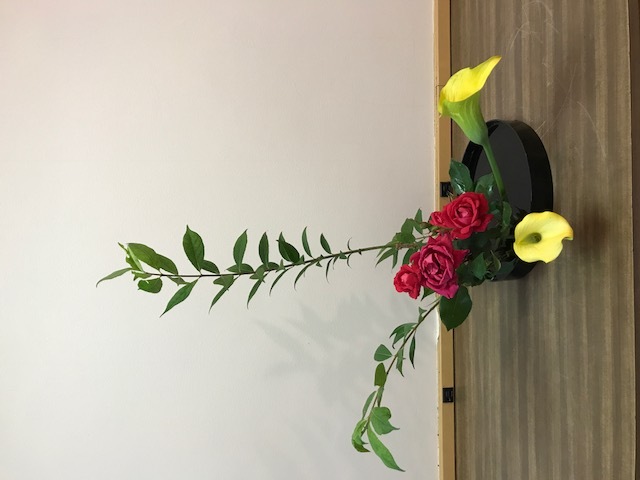 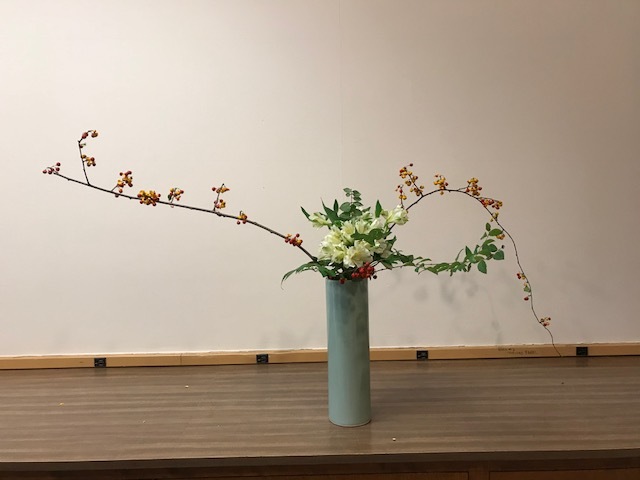 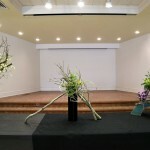 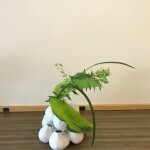 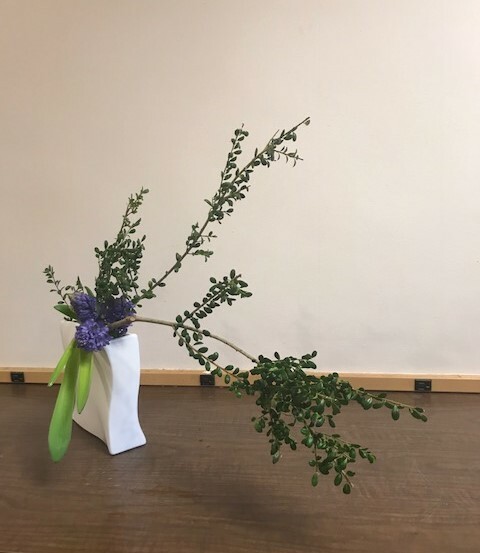 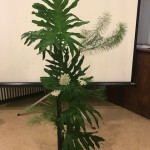 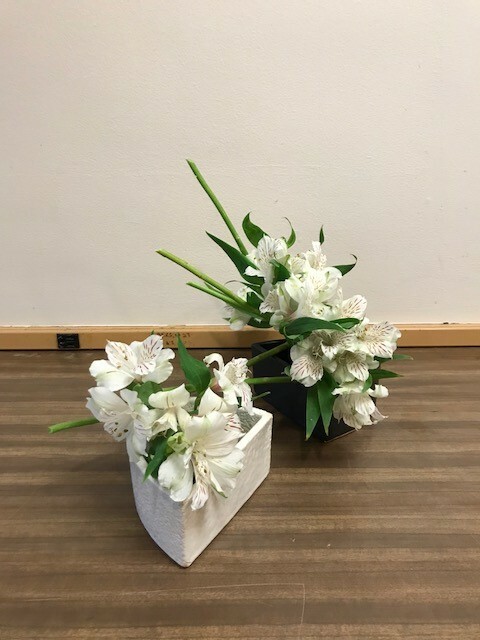 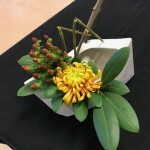 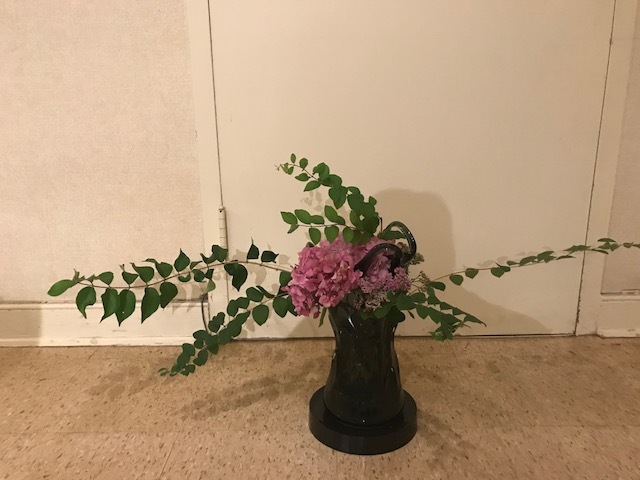 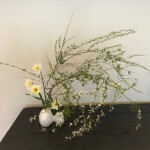 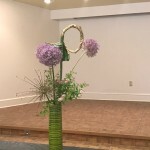 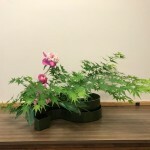 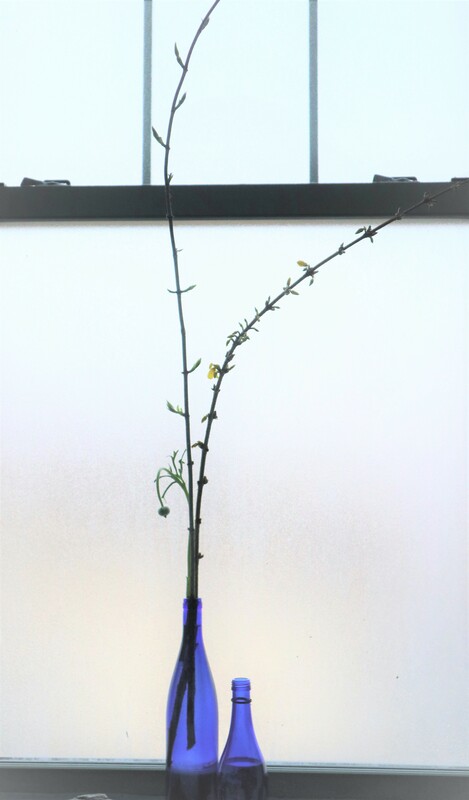 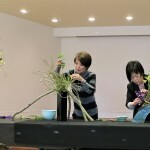 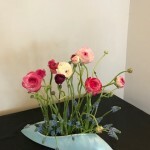 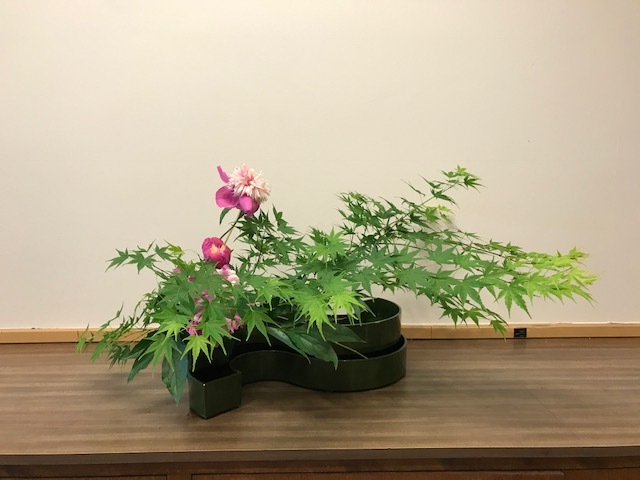 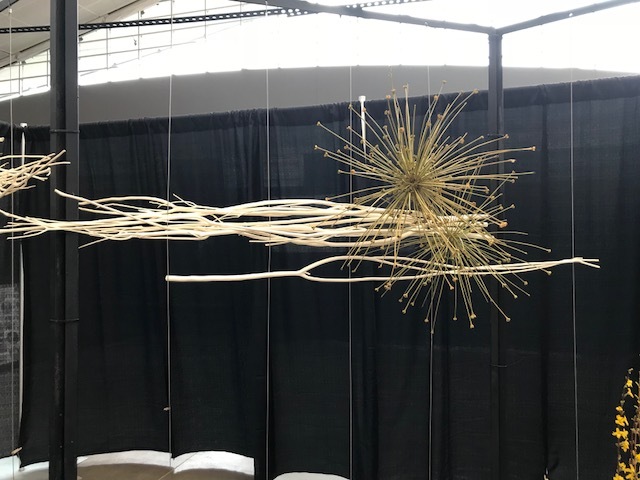 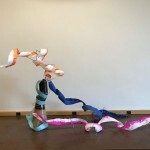 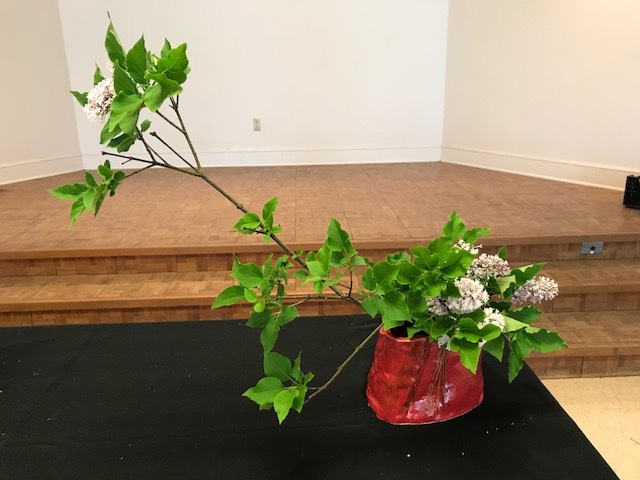 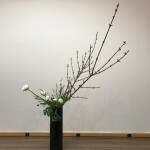 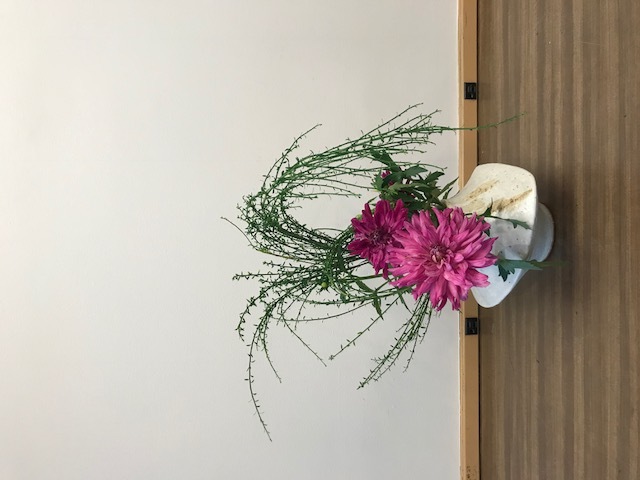 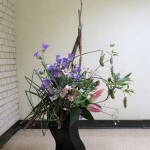 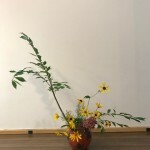 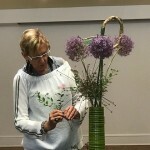 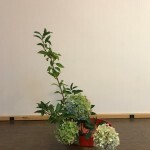 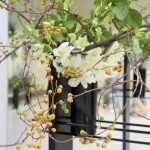 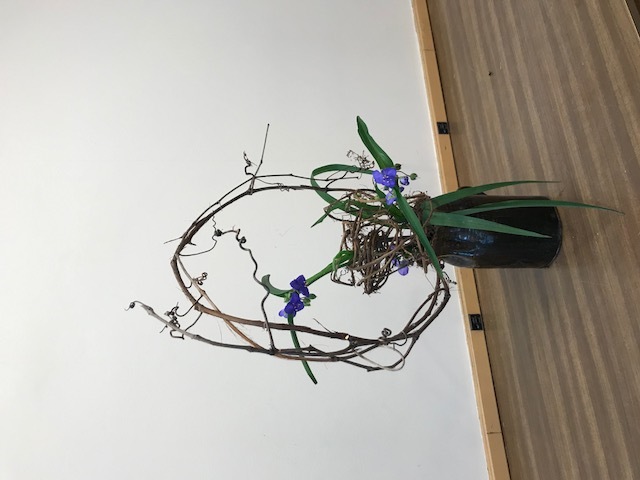 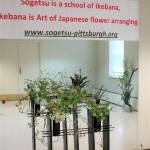 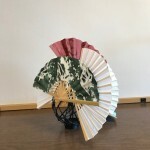 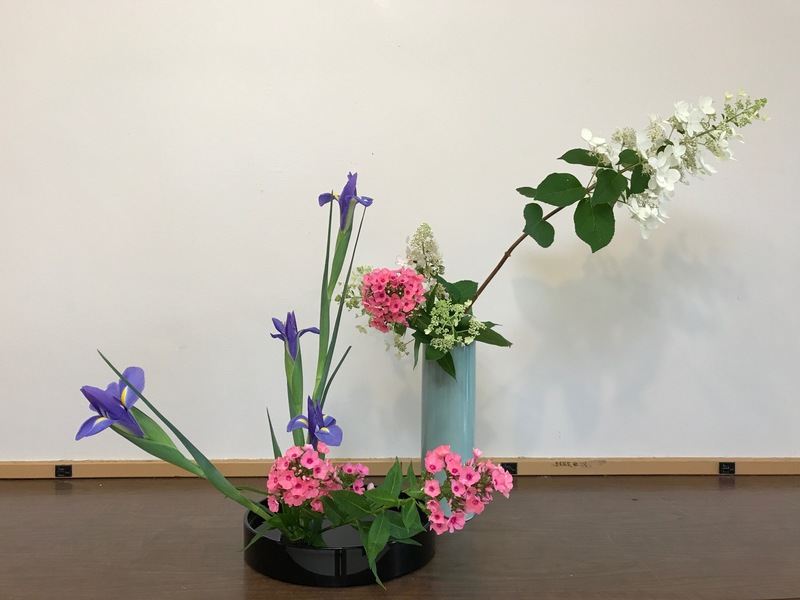 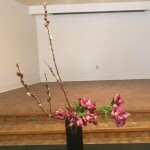 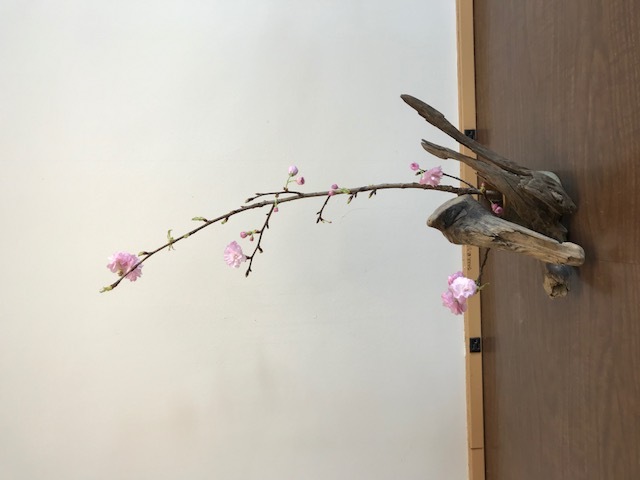 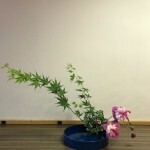 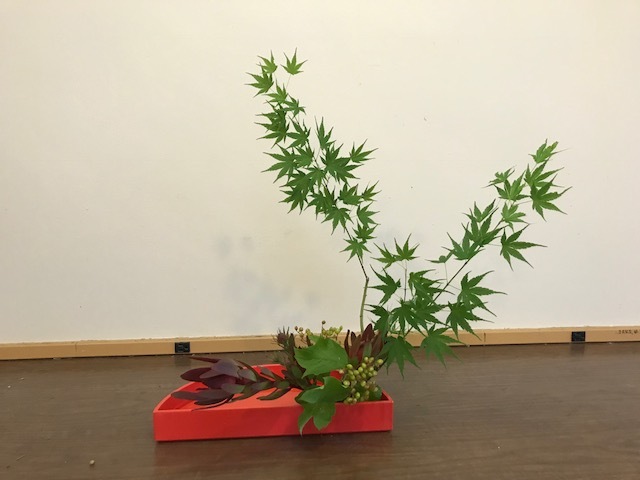 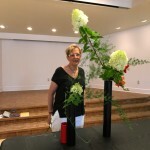 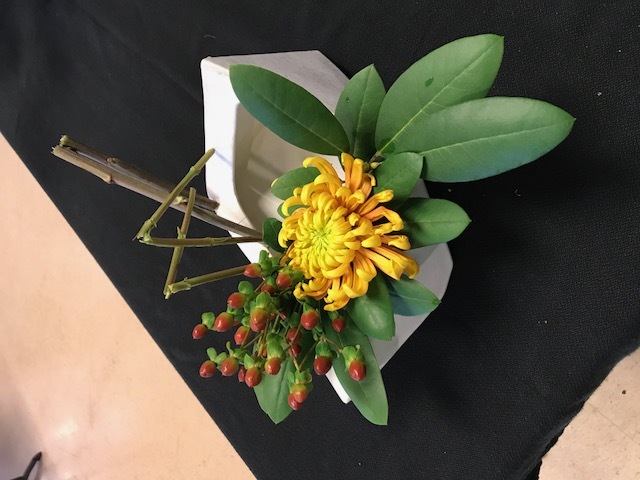 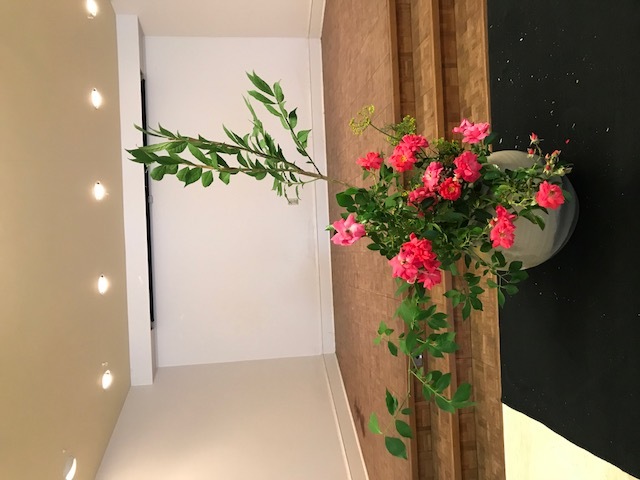 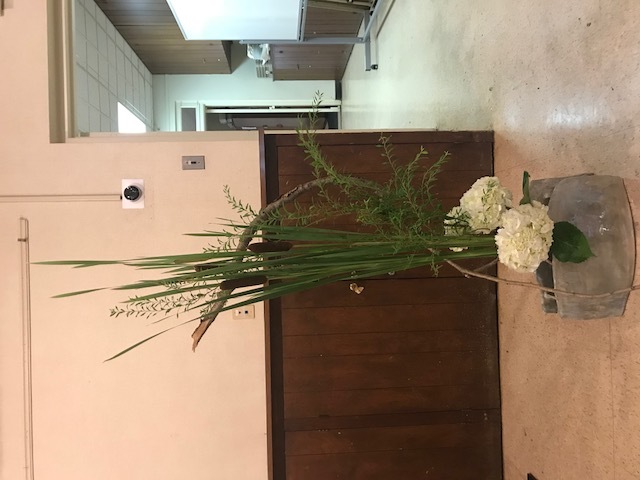 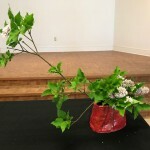 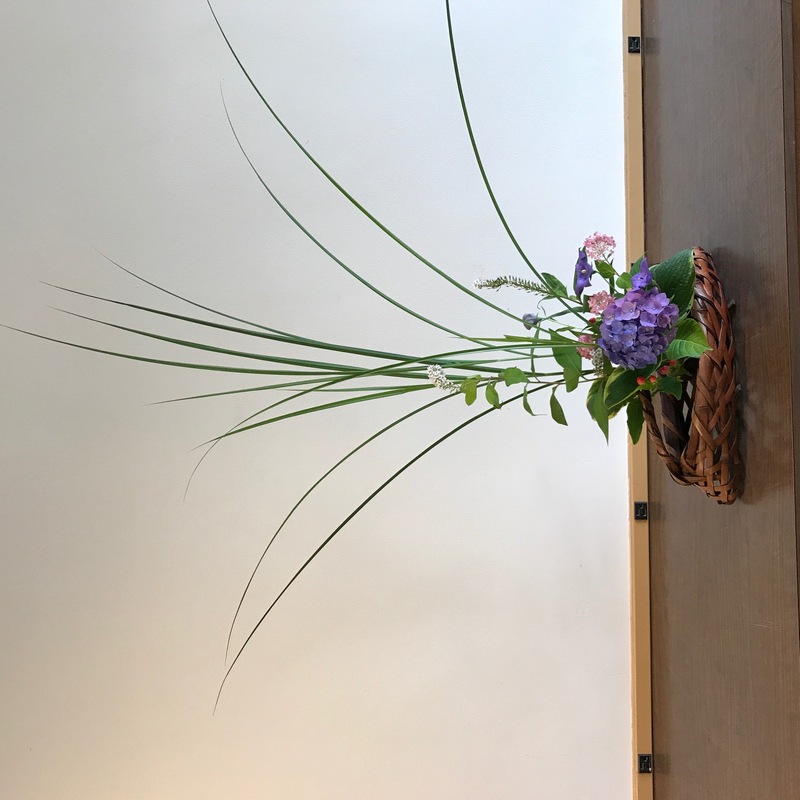 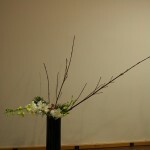 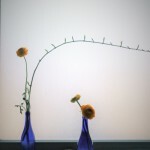 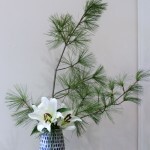 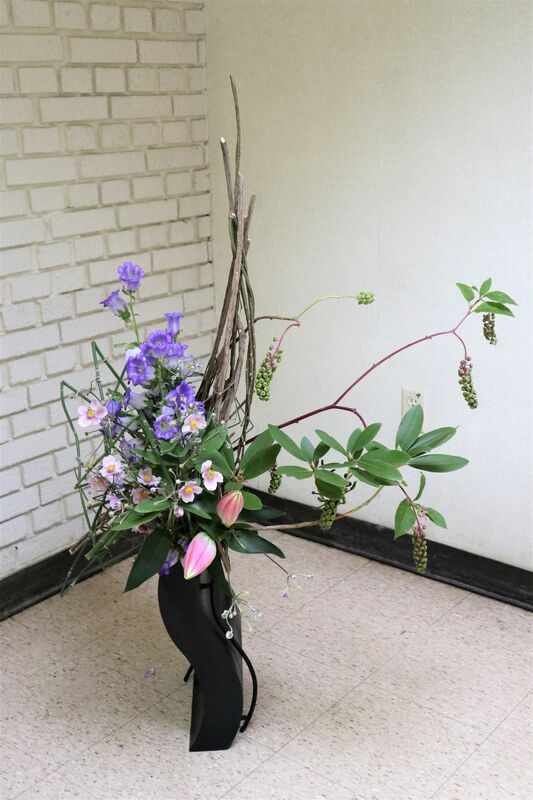 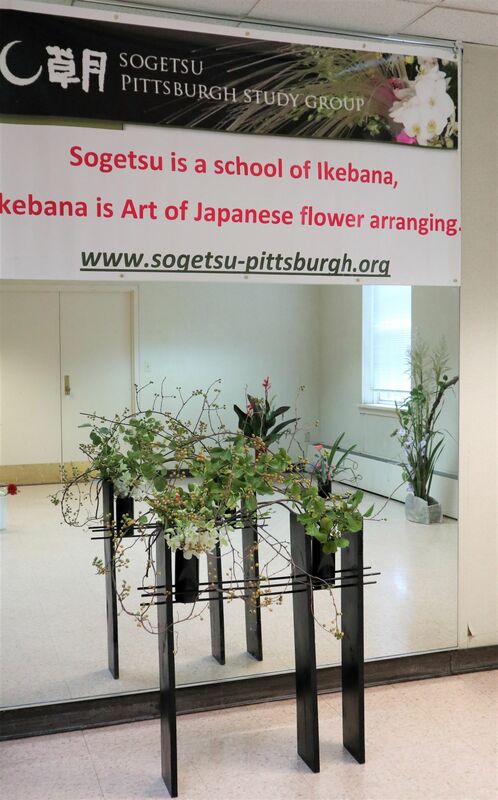 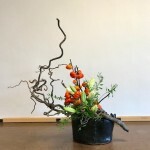 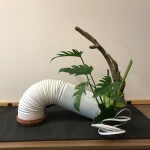 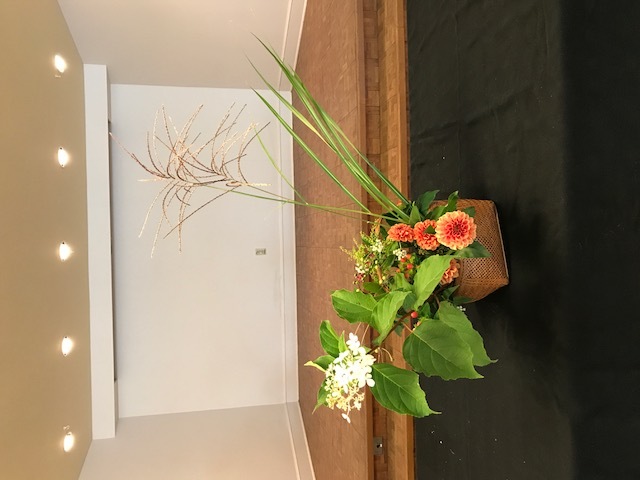 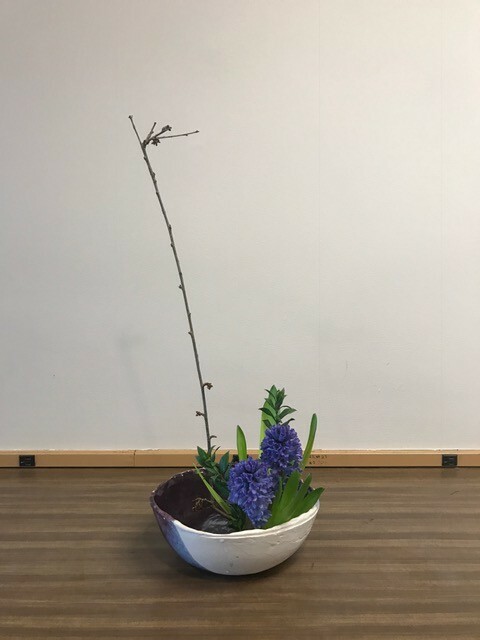 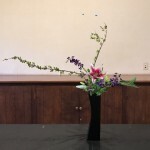 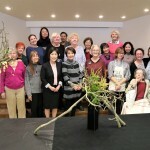 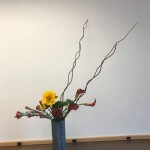 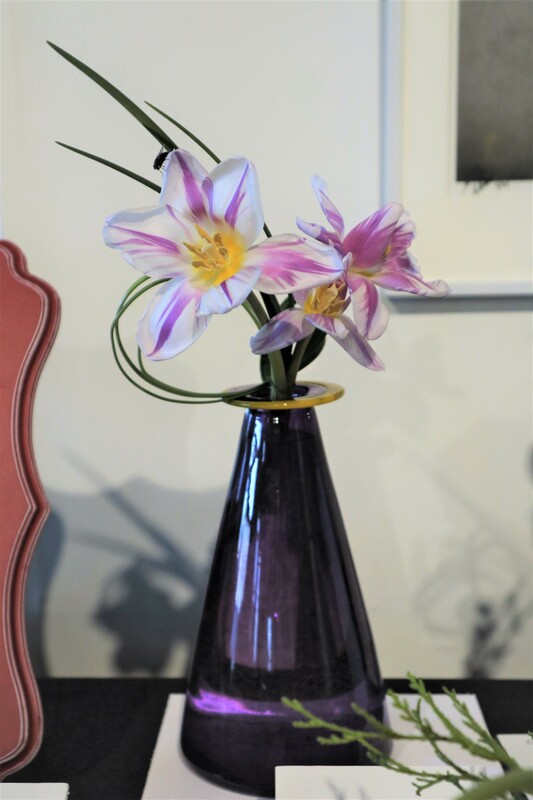 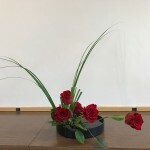 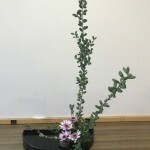 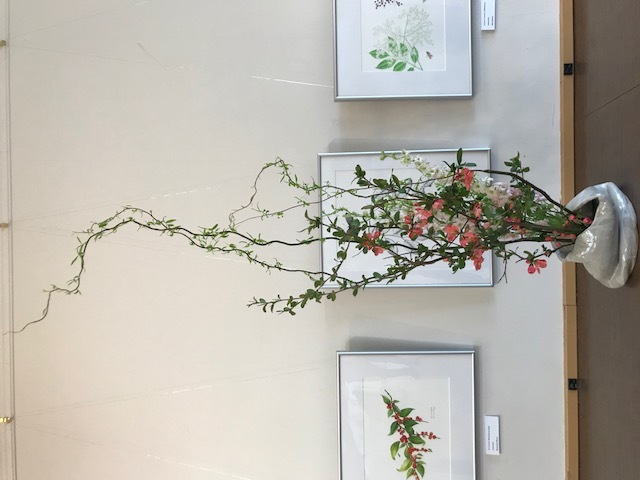 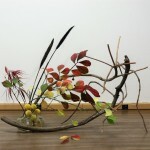 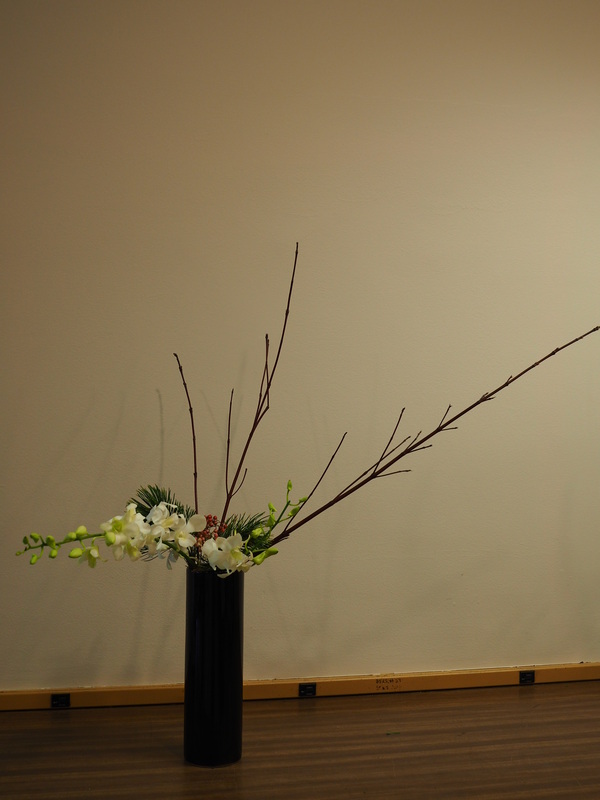 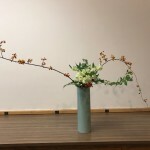 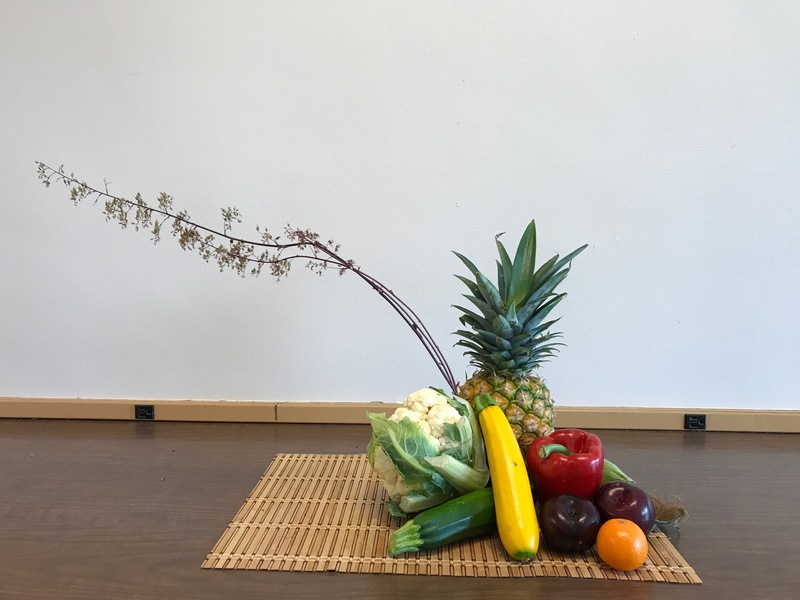 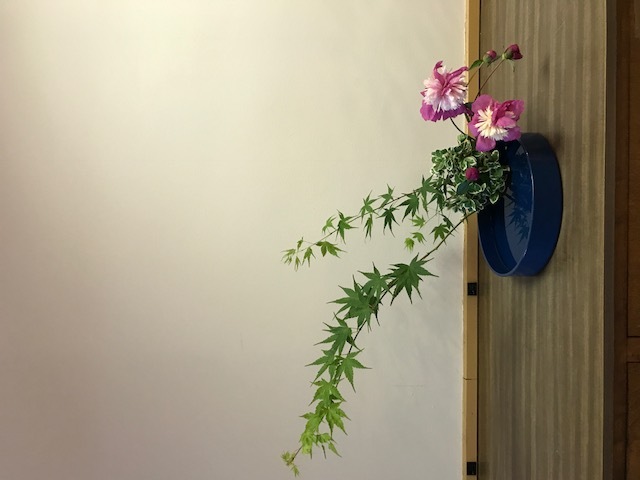 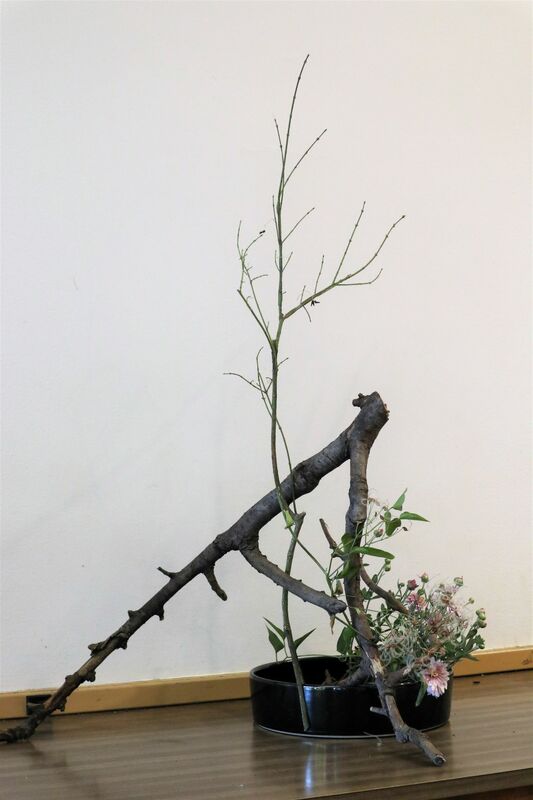 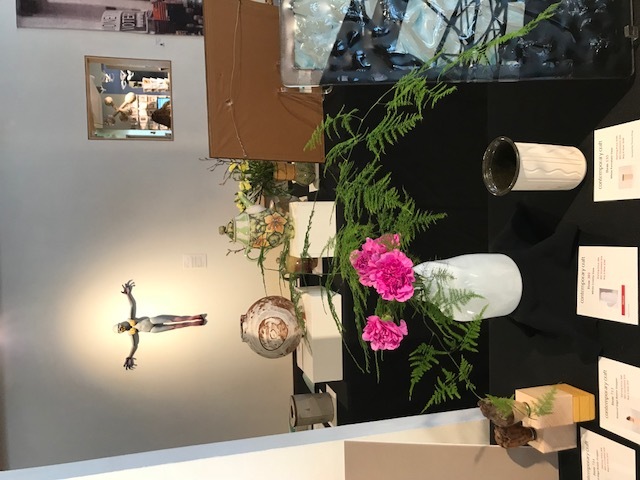 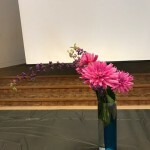 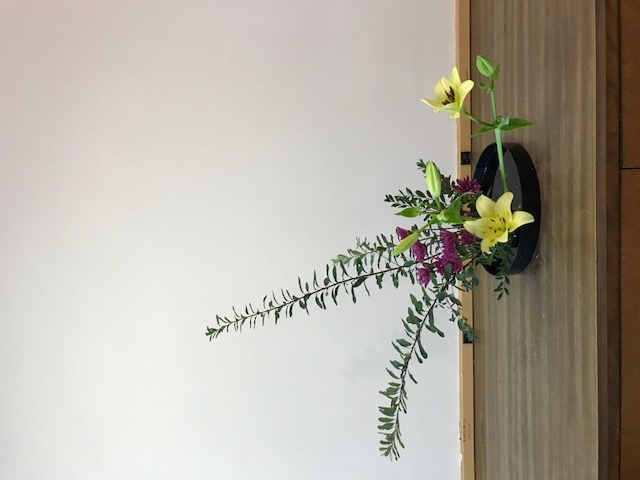 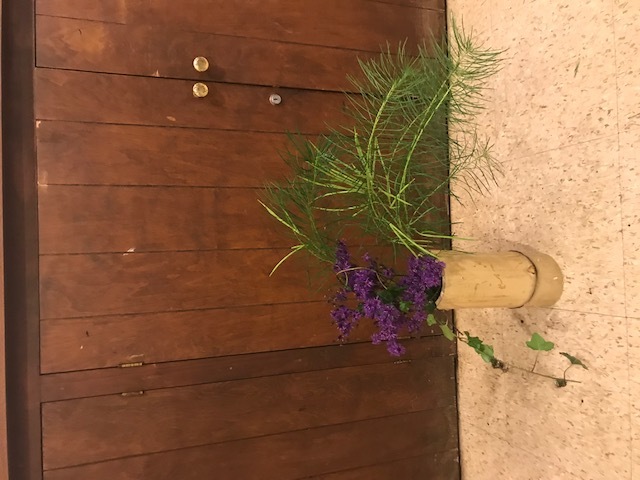 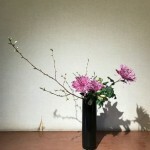 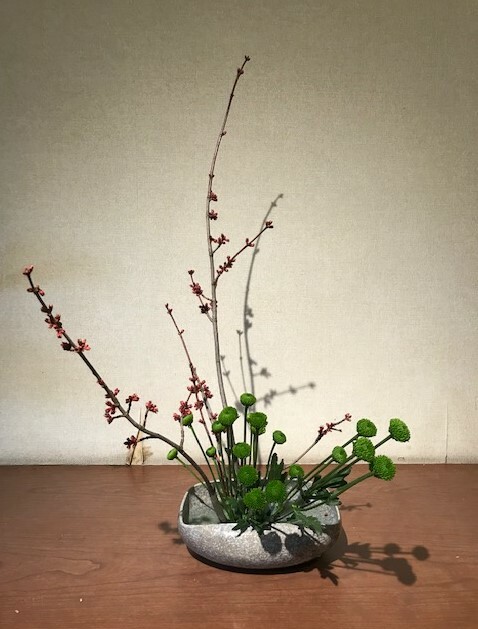 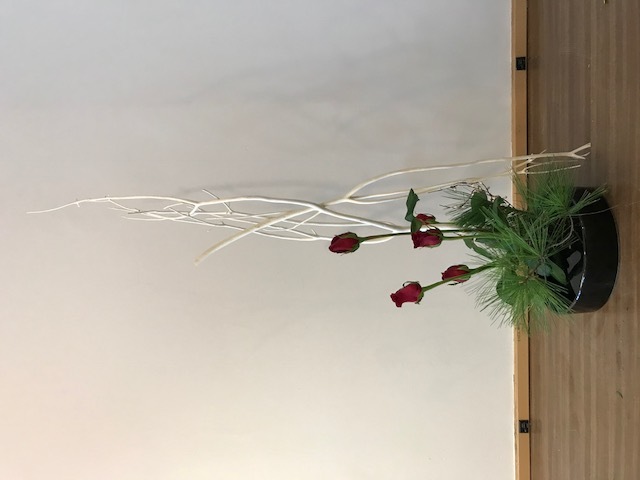 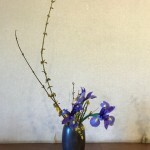 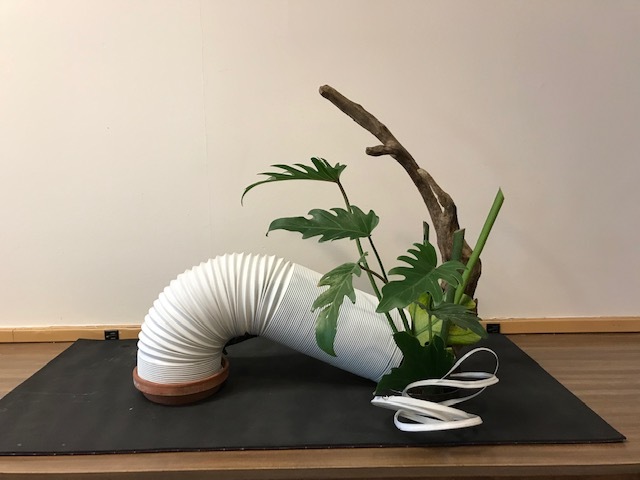 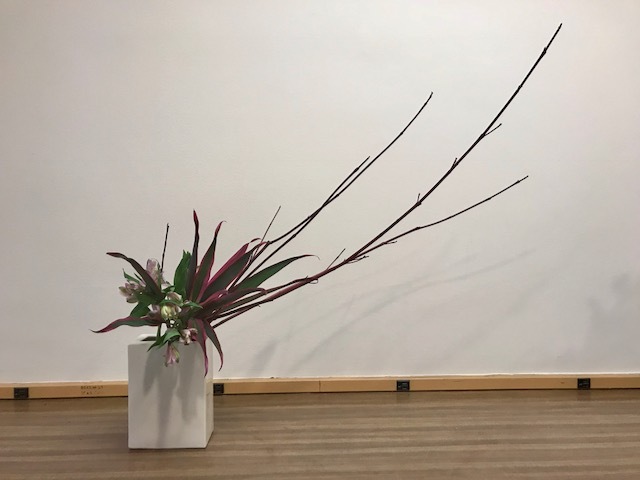 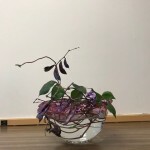 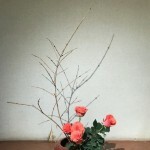 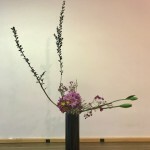 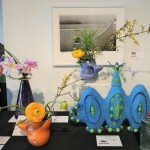 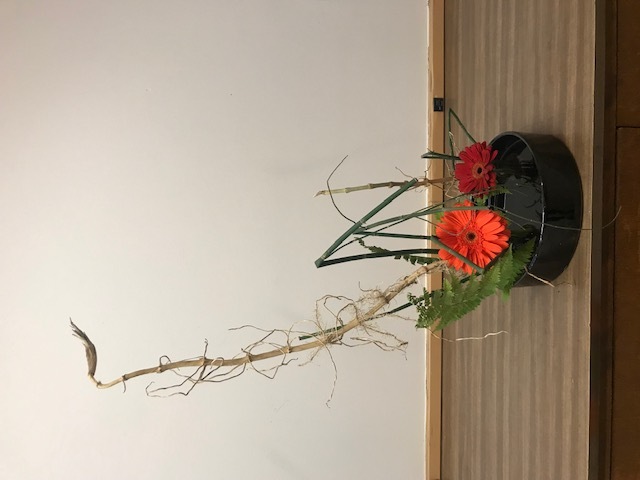 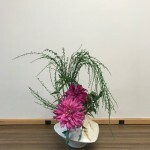 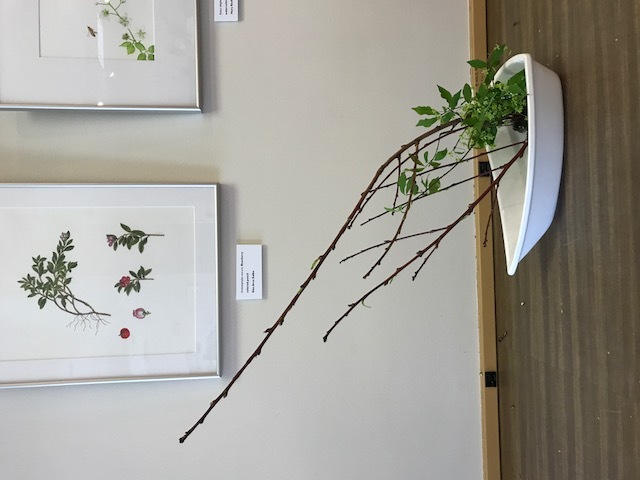 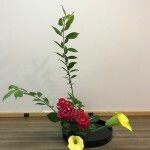 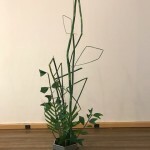 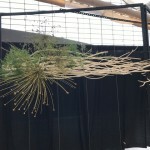 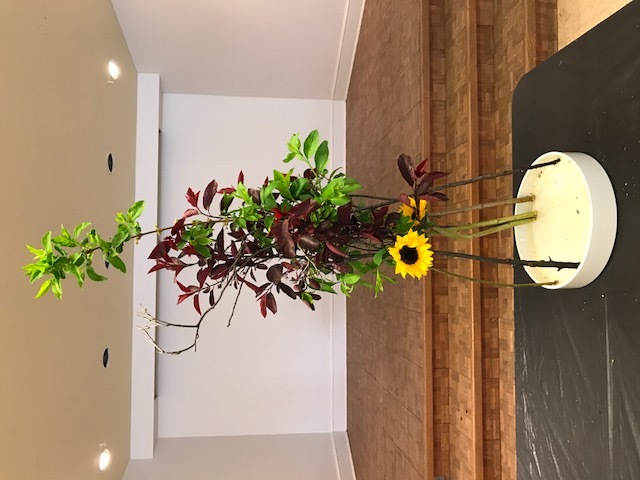 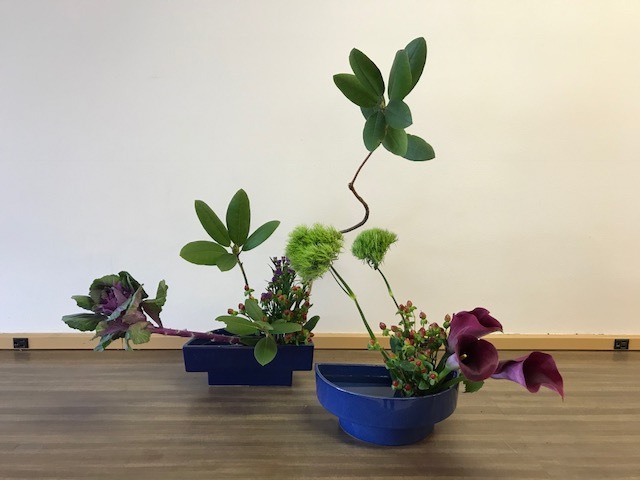 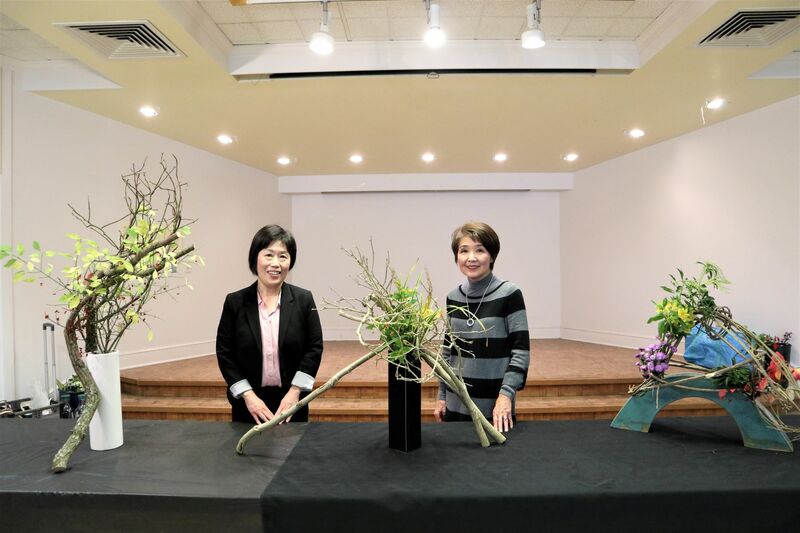 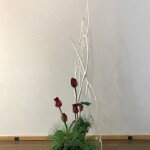 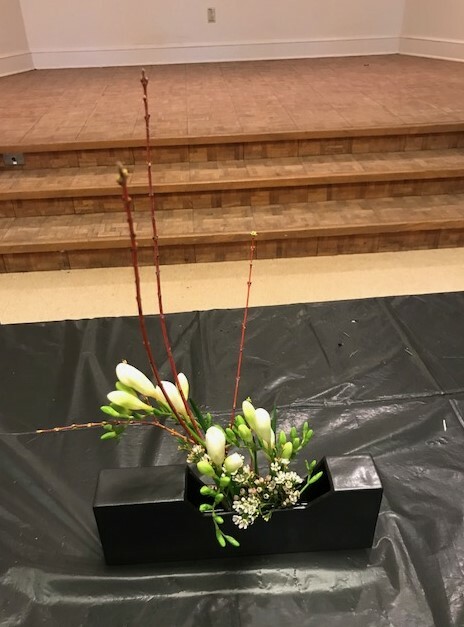 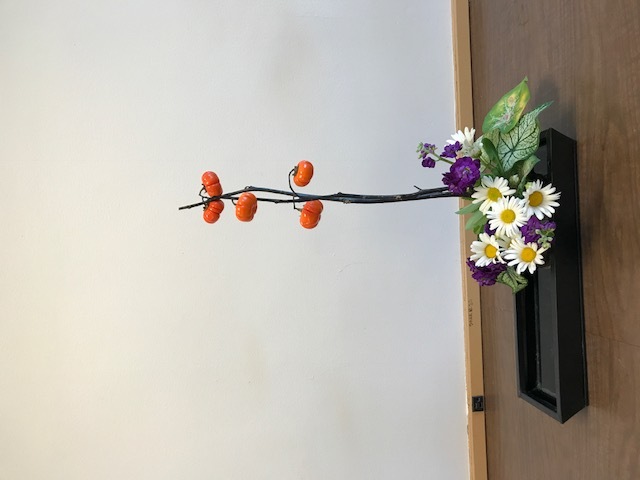 Ikebana is an encounter of materials, container and the arranger. 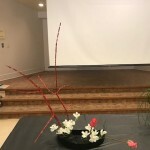 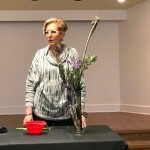 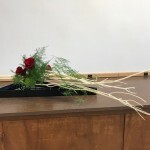 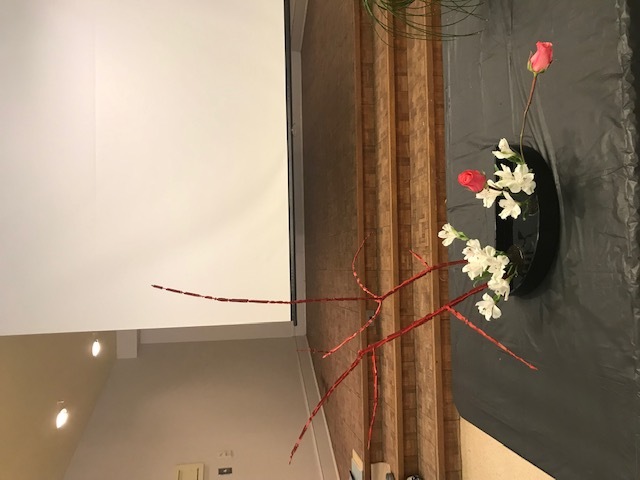 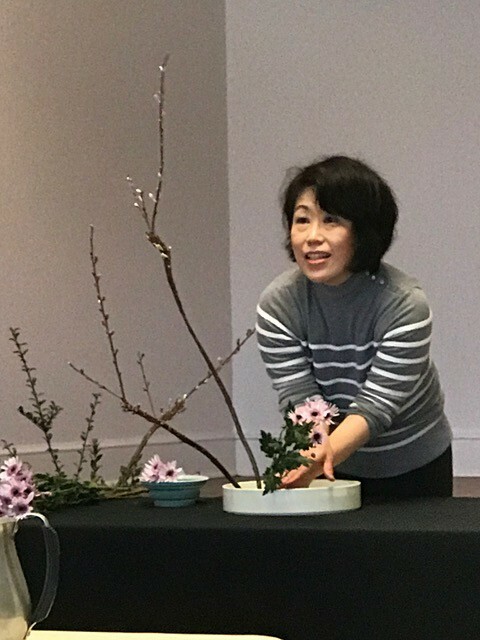 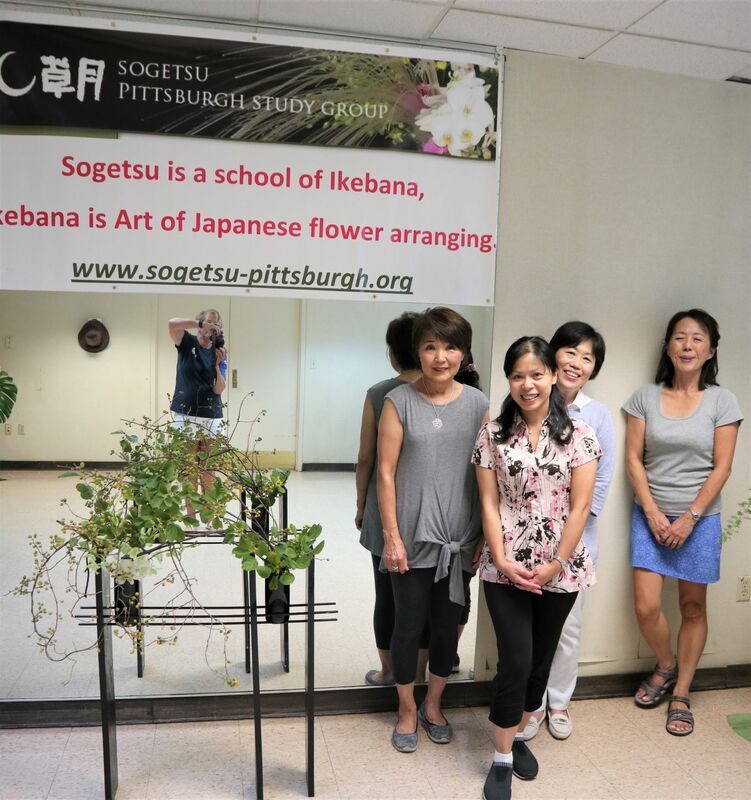 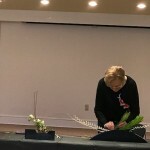 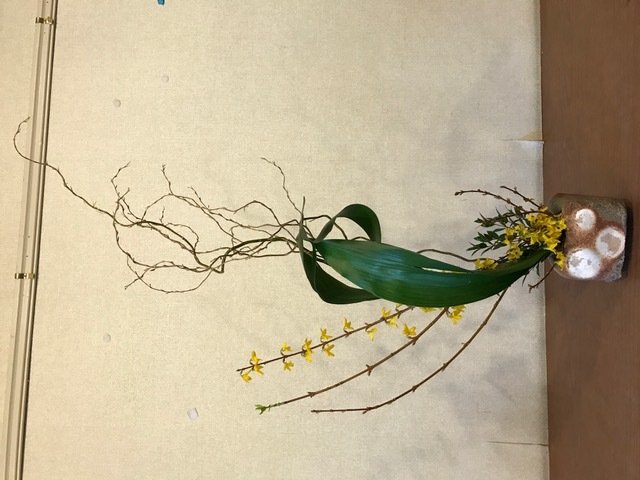 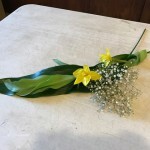 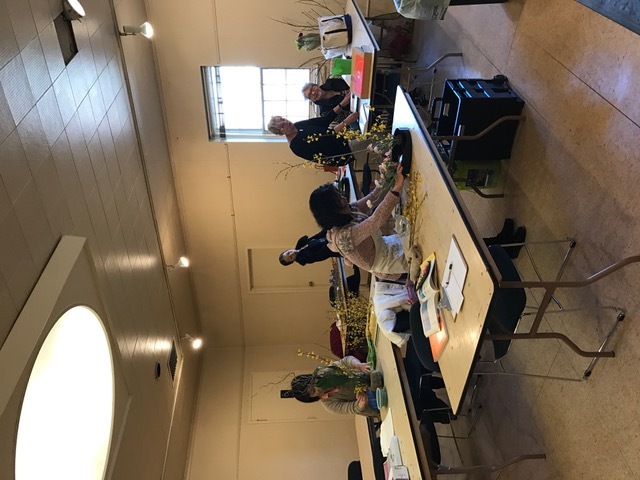 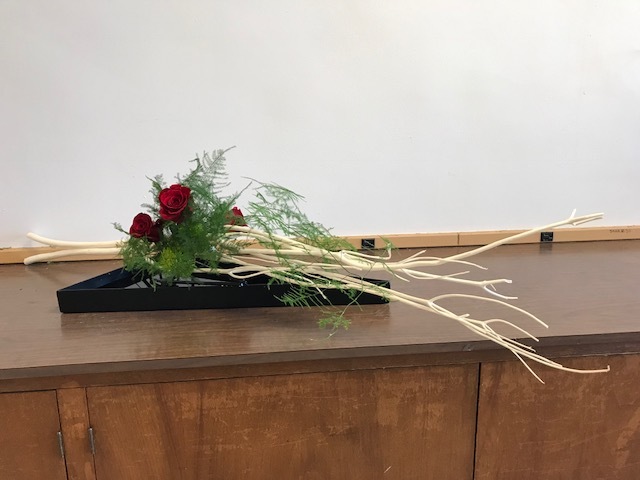 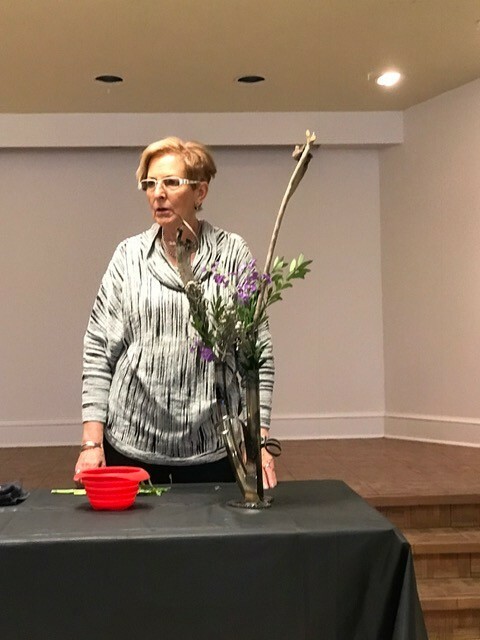 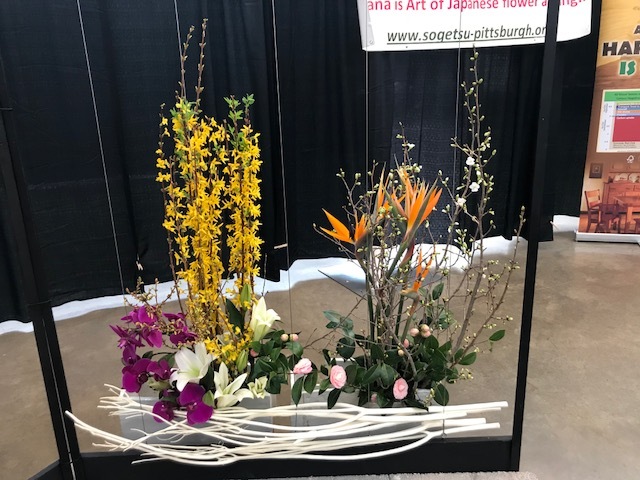 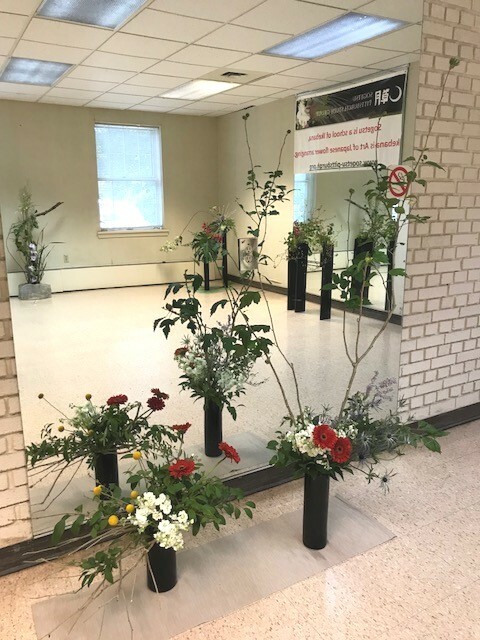 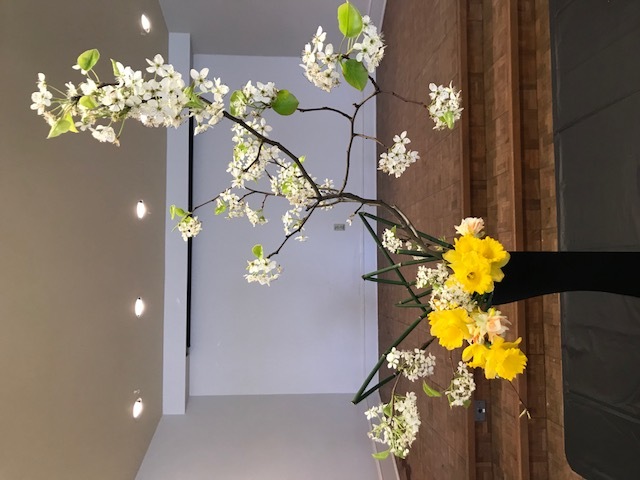 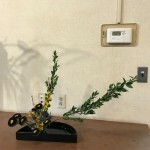 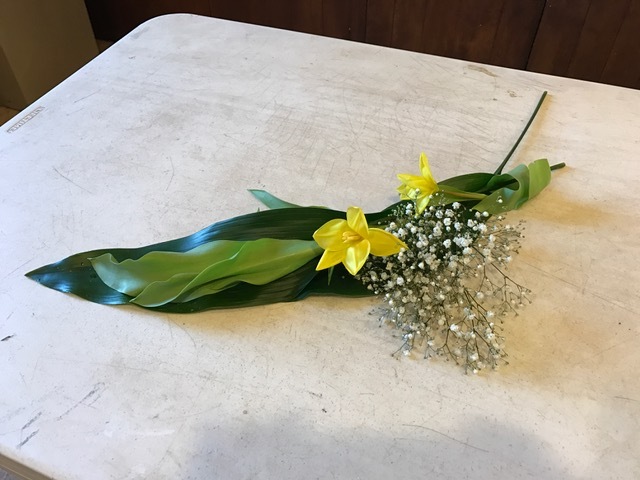 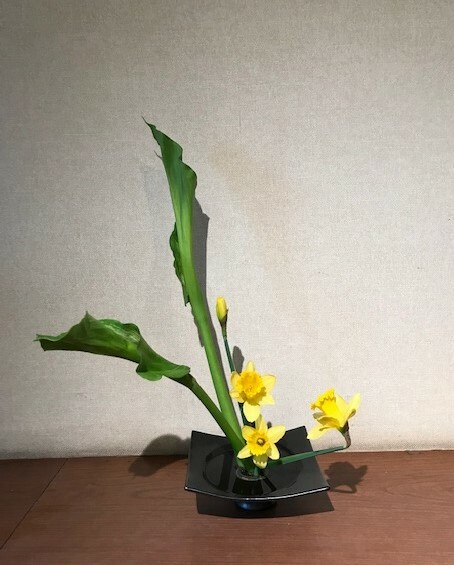 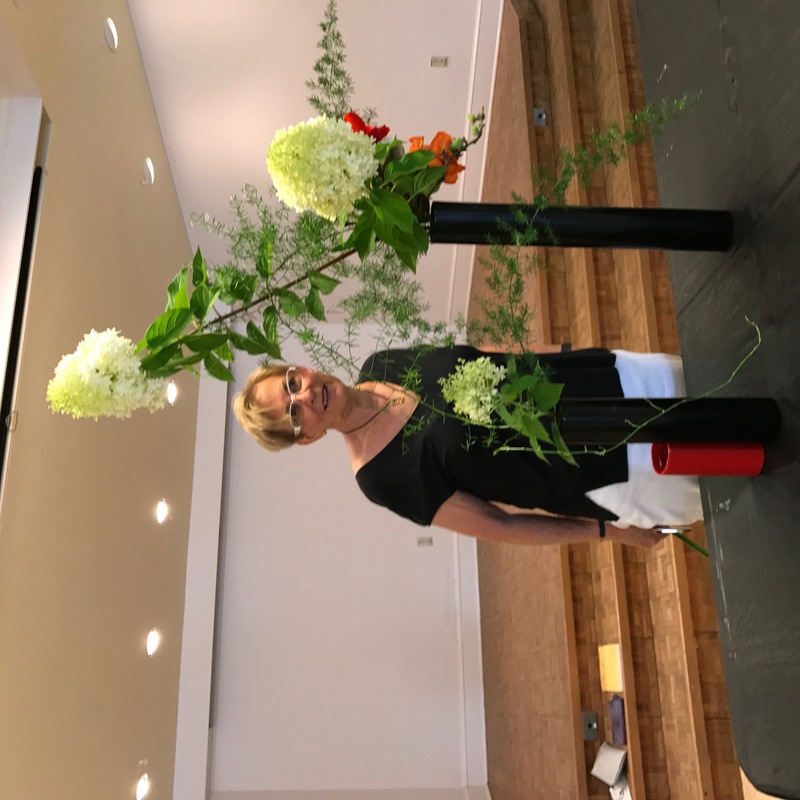 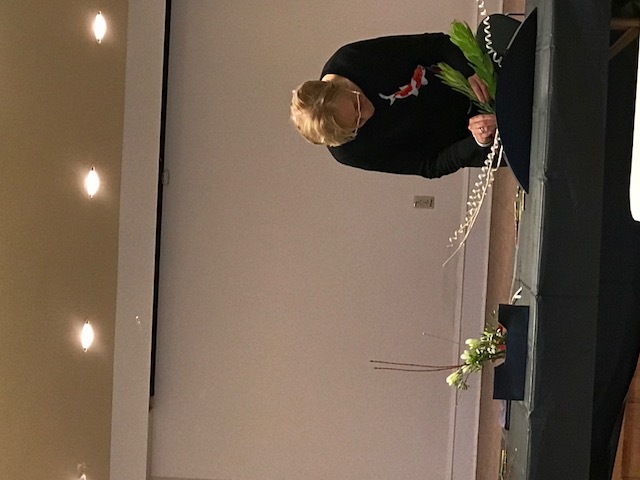 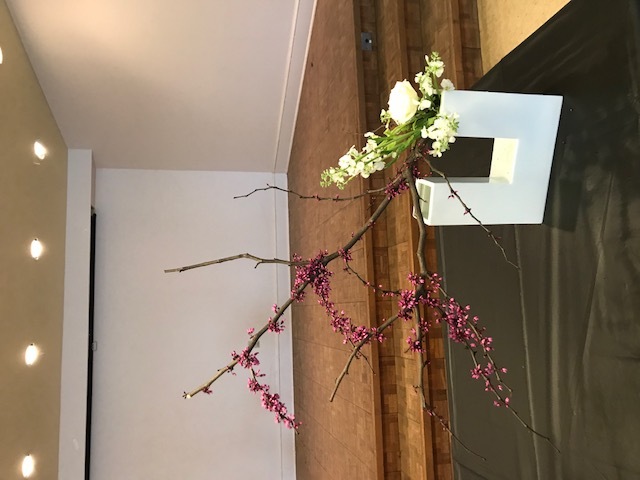 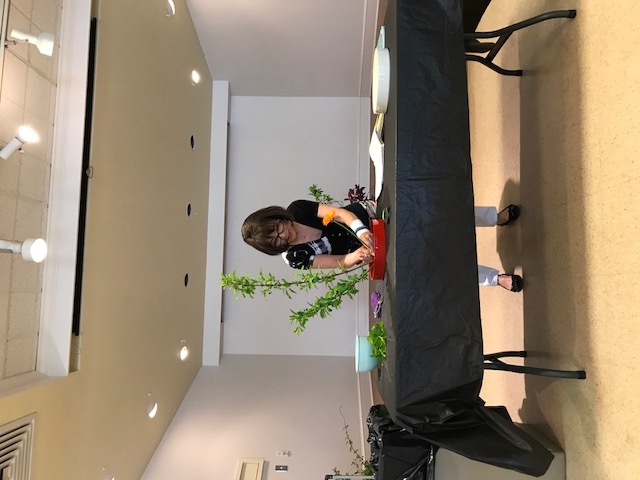 Point of Lesson ; Mastering the Kakei-Ho (Refer to P-3 in Yellow Book) is the key to accomplish fast progress in Sogetsu Ikebana. 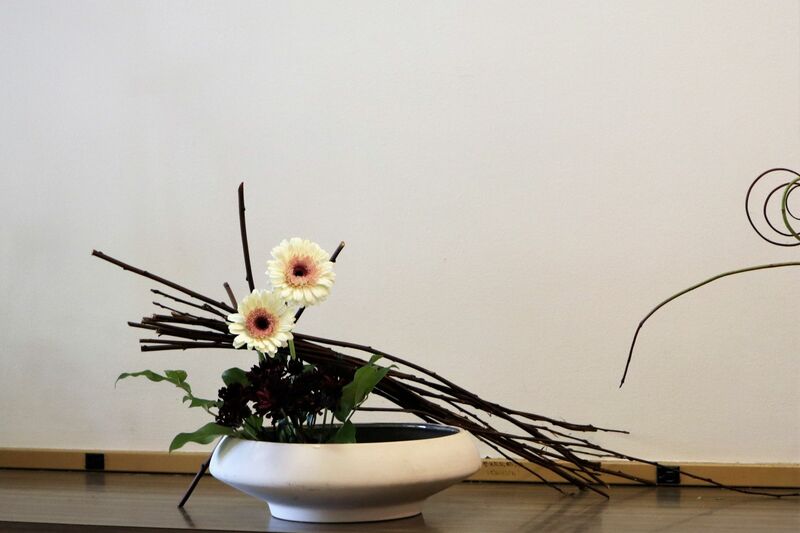 Let’s start with drawing Kakei-Zu (Diagram) before arranging . 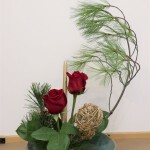 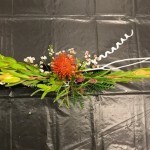 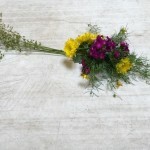 Point of lesson; We need to emphasize one flower, one branch that were found in nature to make beautiful arrangements. 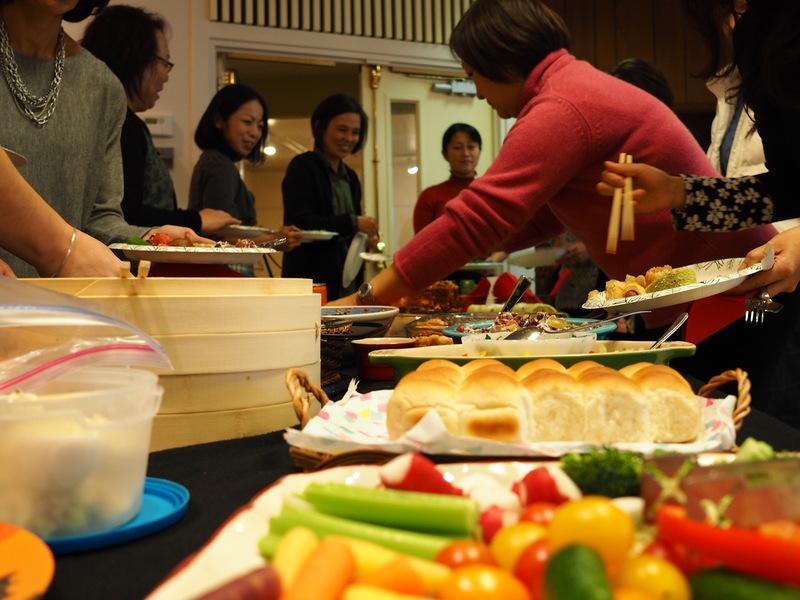 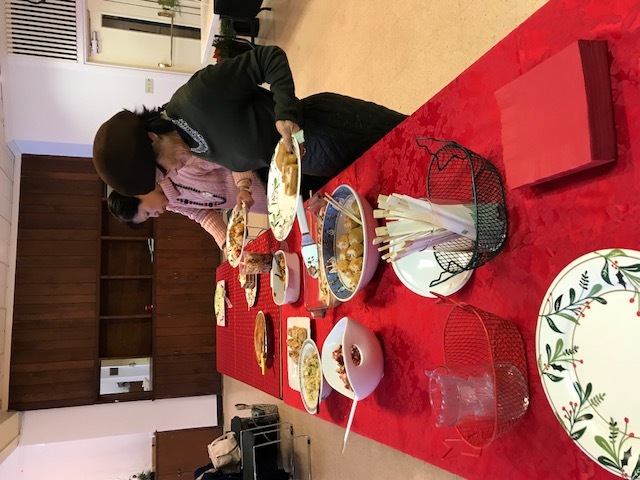 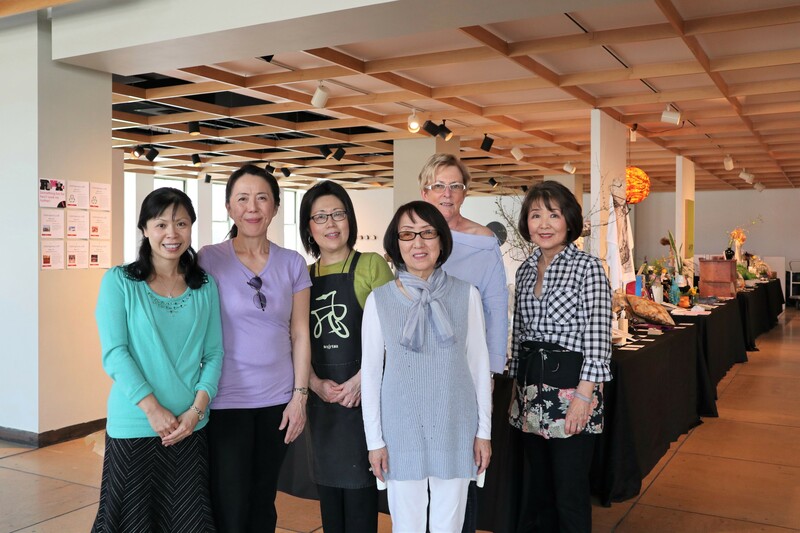 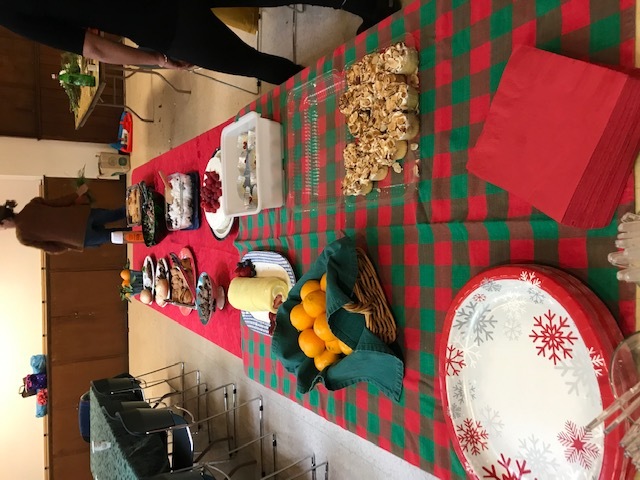 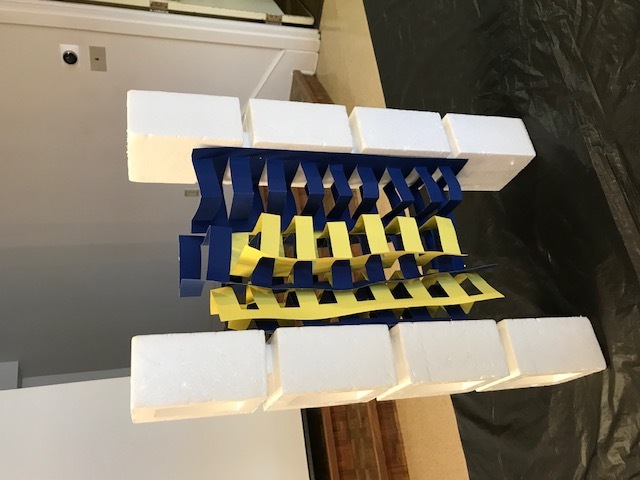 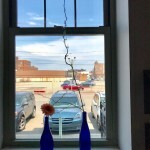 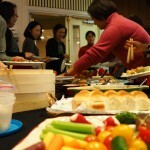 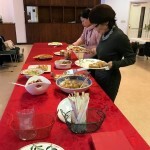 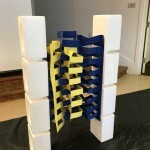 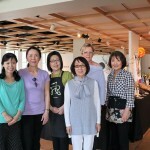 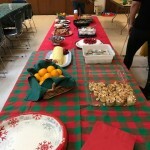 Some photos from Workshop and Luncheon, good work and good food! 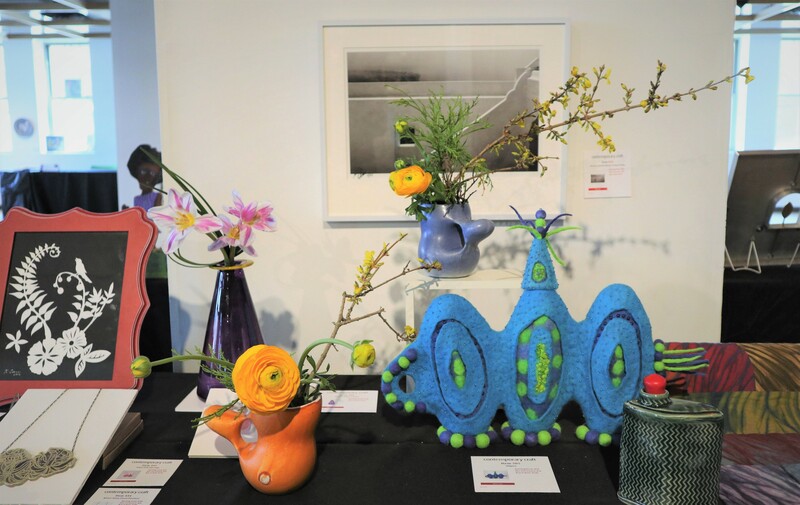 Fair in the Park, 2014, Sept 5 – 7. 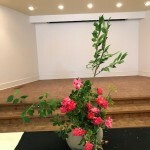 Here is our 2013 Workshop schedule, the theme for the workshop will be announced in an e-mail reminder prior to the workshop. 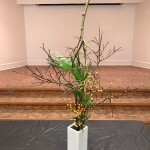 Dates are on the 4th Thursdays except Nov. & Dec.
We’ll be setting up Thursday, Sept.6 2012 from 10:00am, if you’d like to participate please contact Reiko and bring a pair of gloves and pliers. 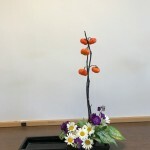 If you can’t participate please come and see our display. 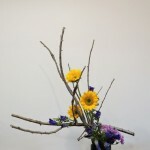 Website design by Jeff Guerrero.